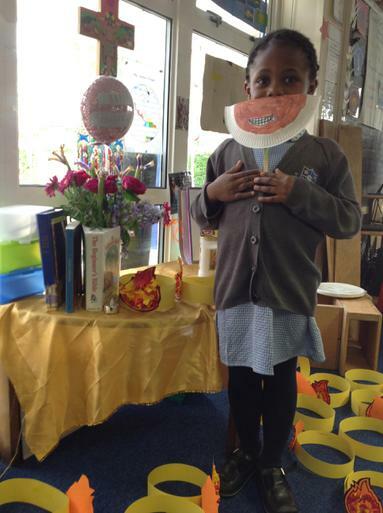 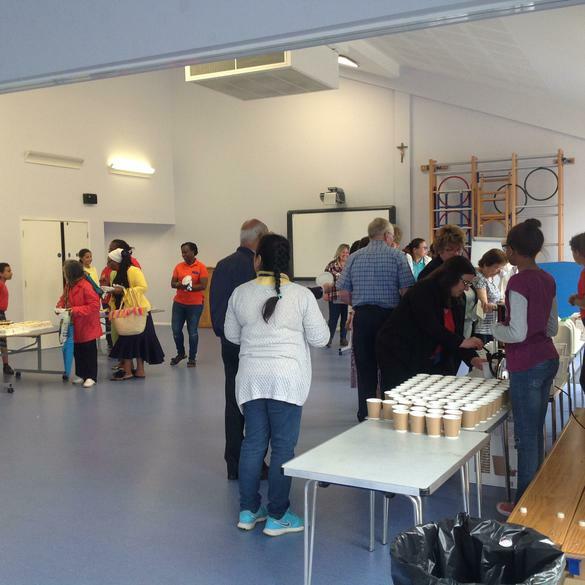 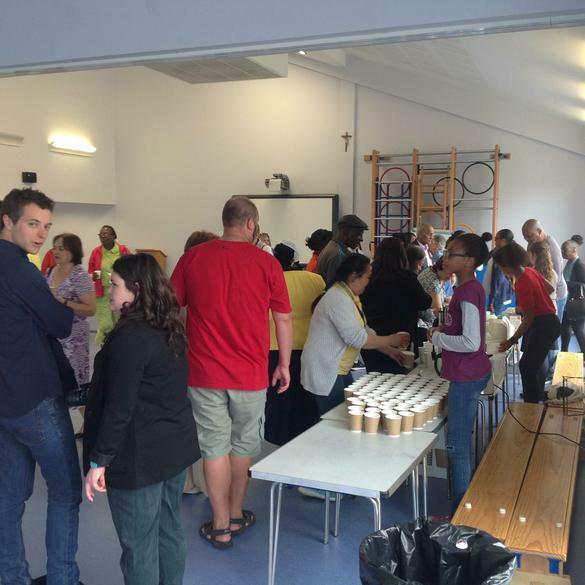 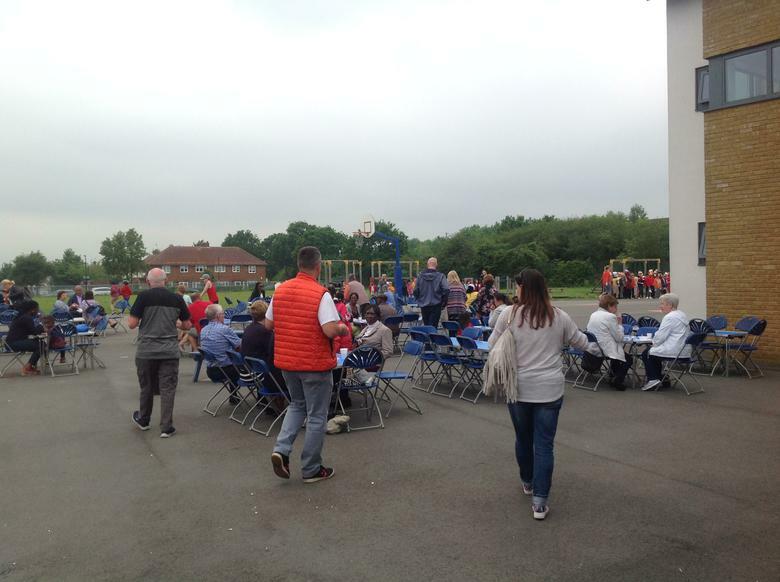 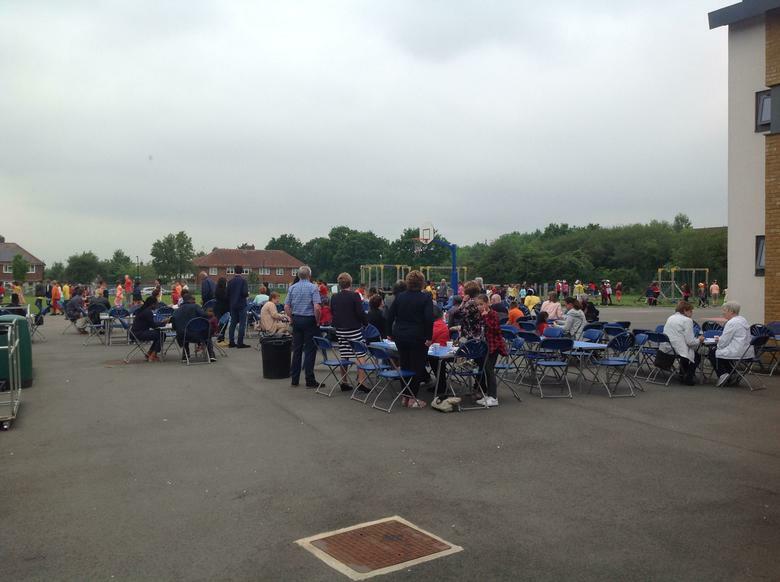 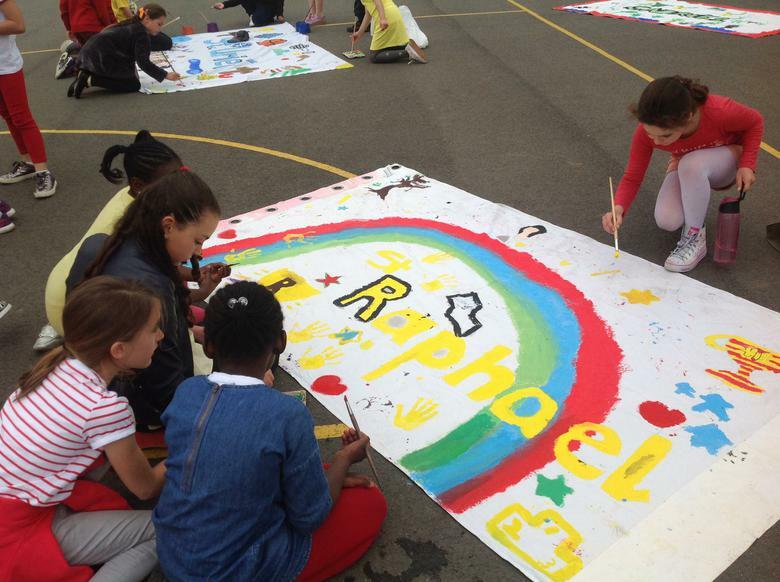 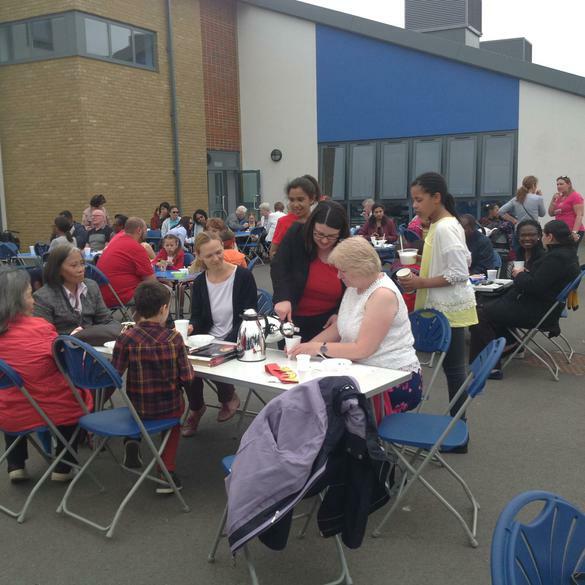 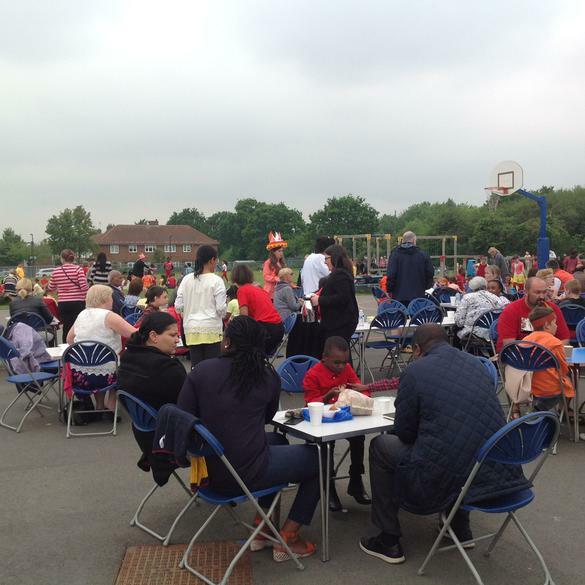 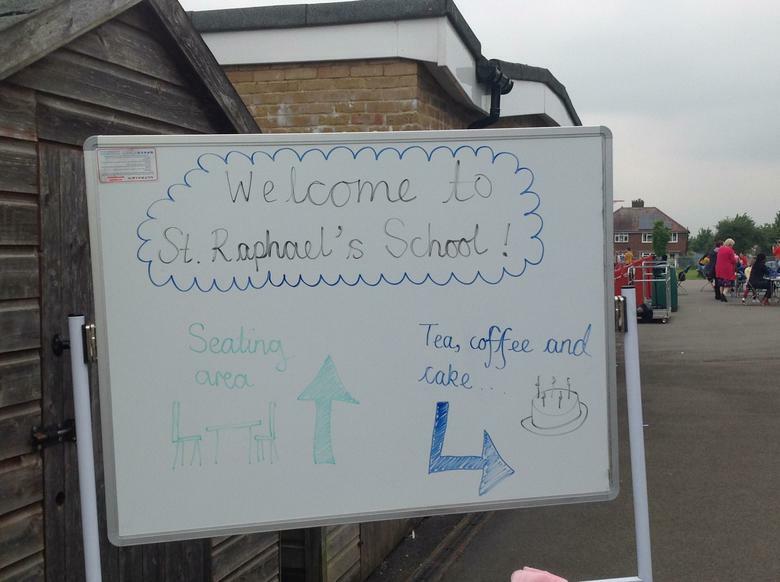 On Friday the 25th May St Raphael’s celebrated the birthday of the church. 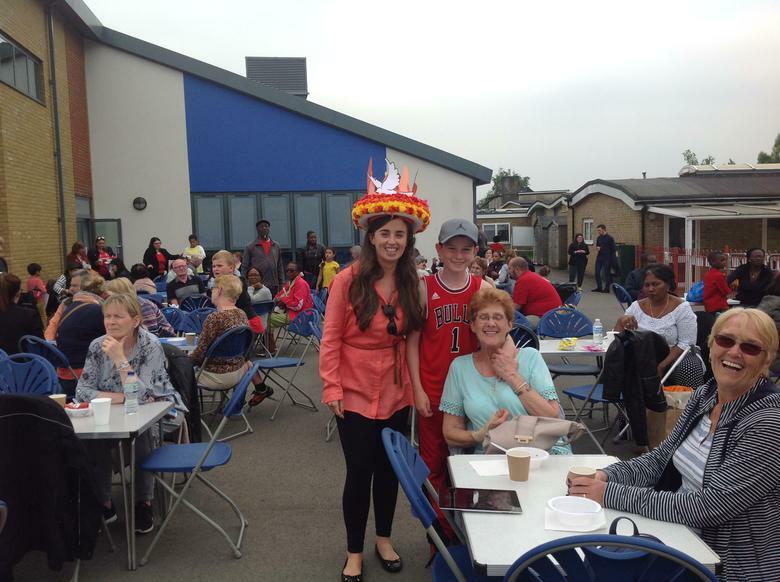 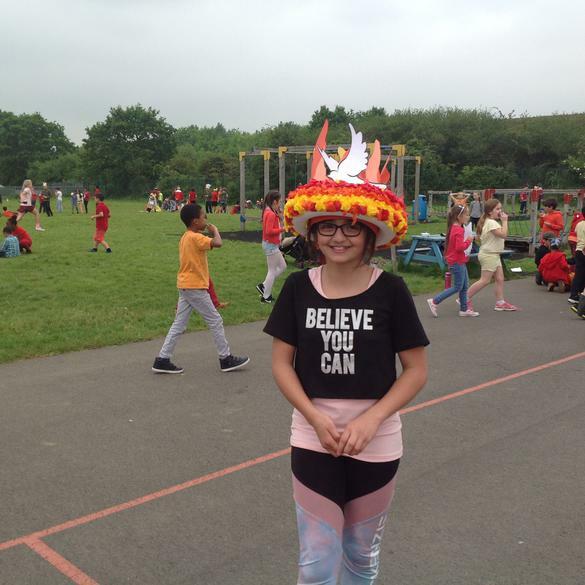 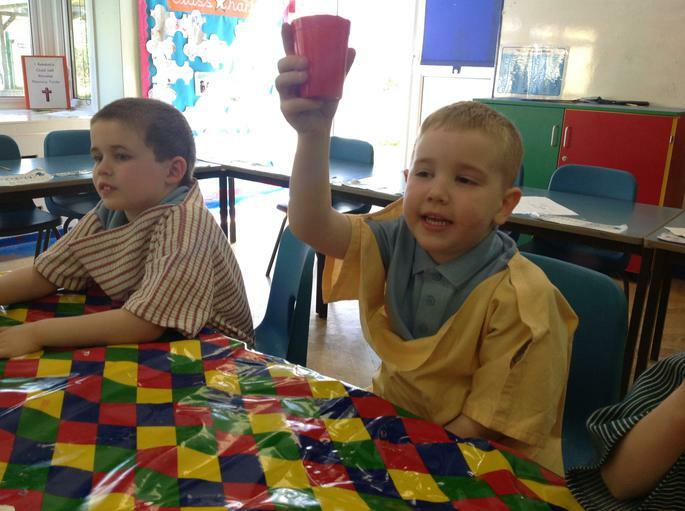 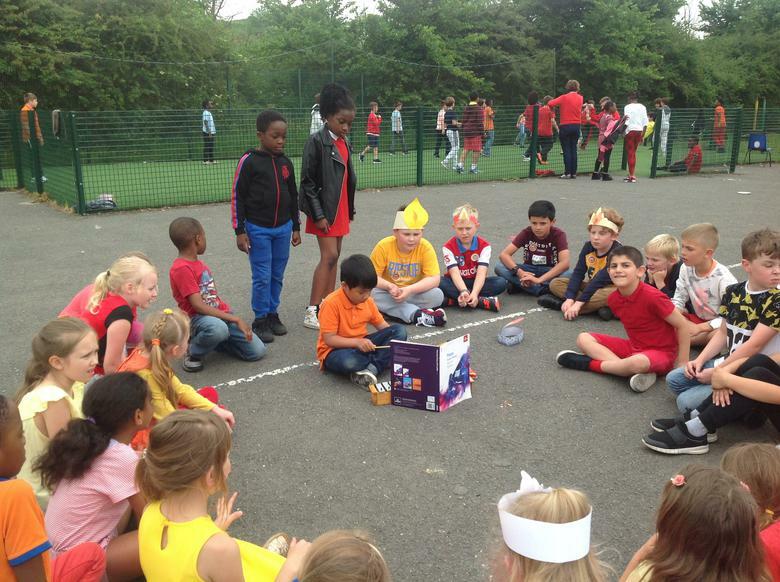 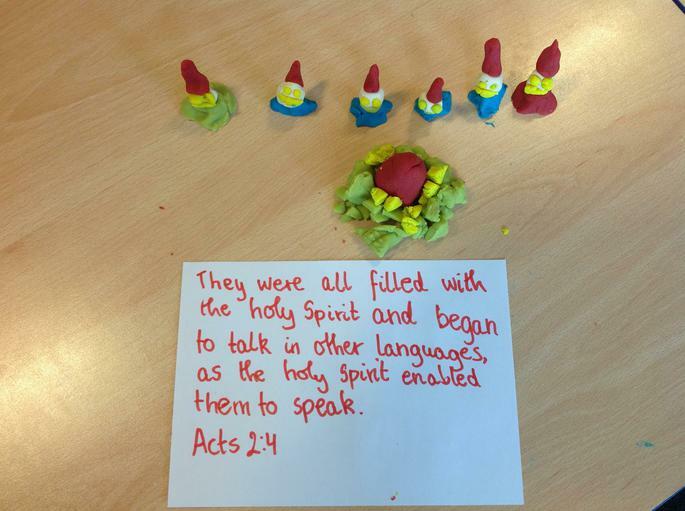 All the children dressed in yellow, red and orange and some children made Pentecost hats. 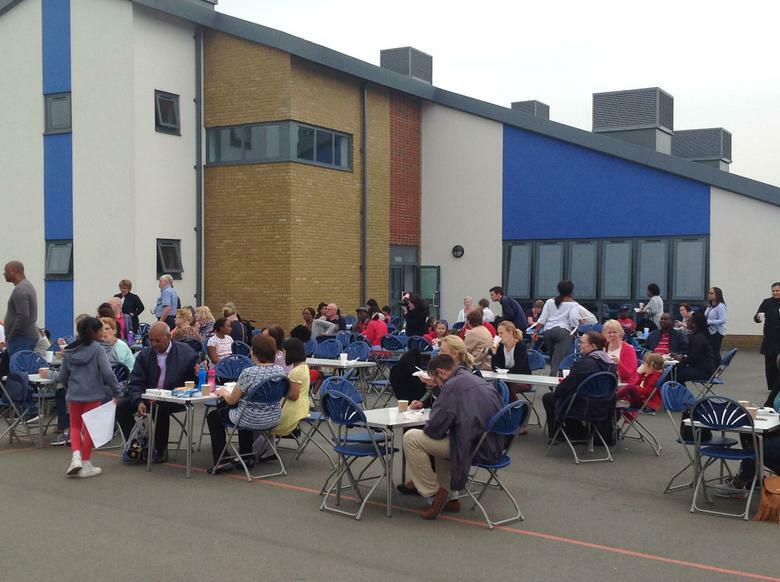 We welcomed our elderly parishioners and grandparents into school in afternoon for our first tea party. 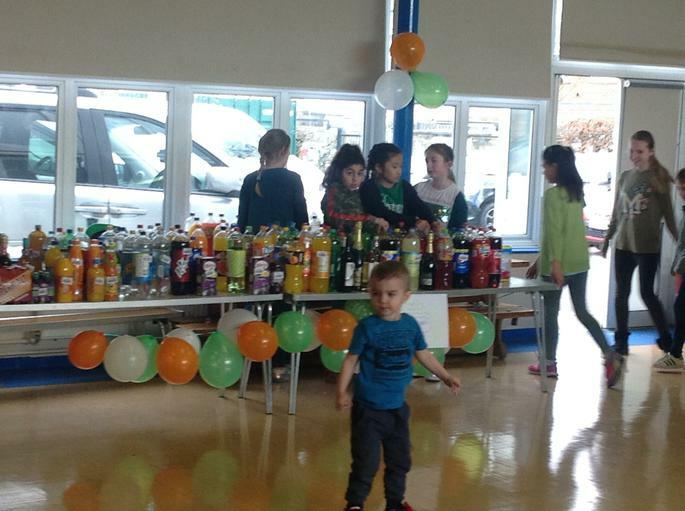 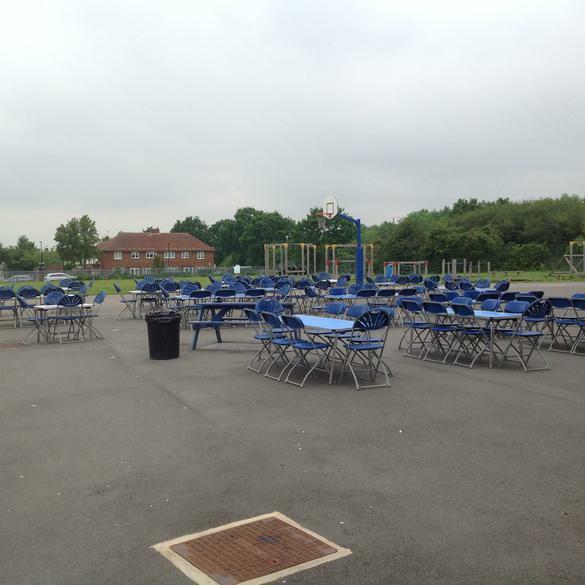 The children had planned the party and it was well received. 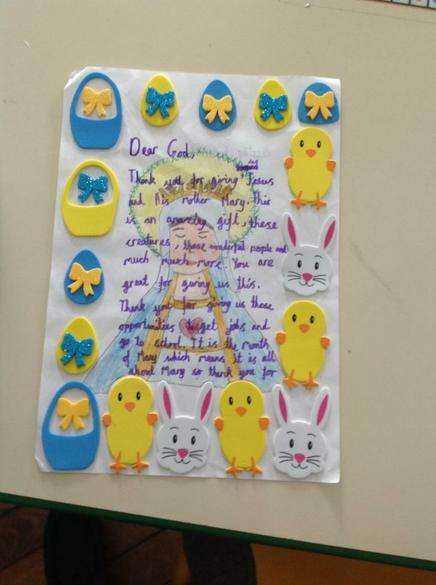 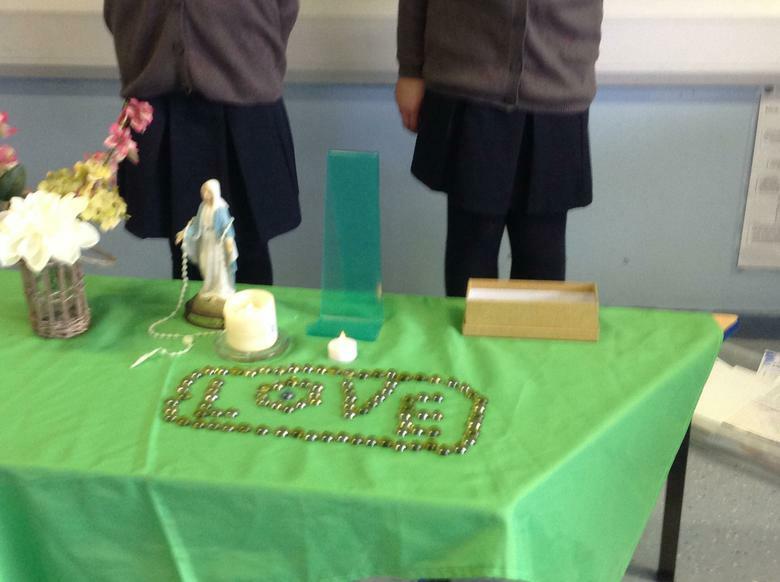 During the month of May, all classes took home Mary bags to honour Mary, ask her to pray with us and for us. 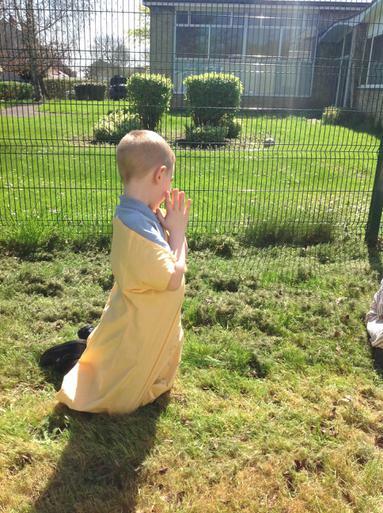 We ask Mary to intercede for us to God. 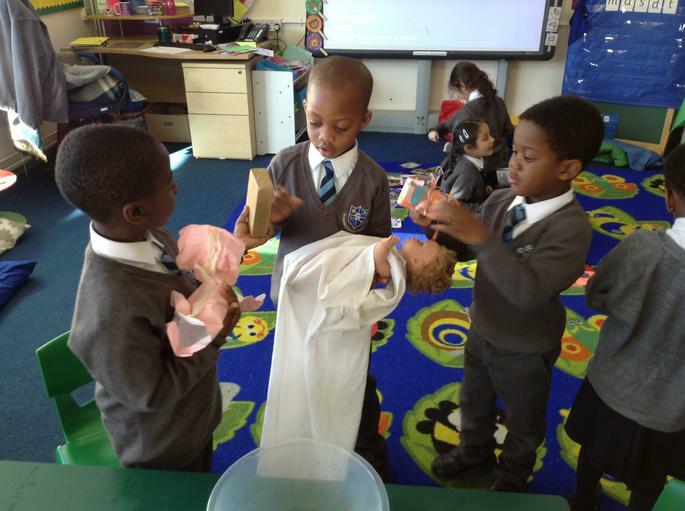 When we recite the Hail Mary, we are honouring Mary and her most important role as Mother of Jesus. 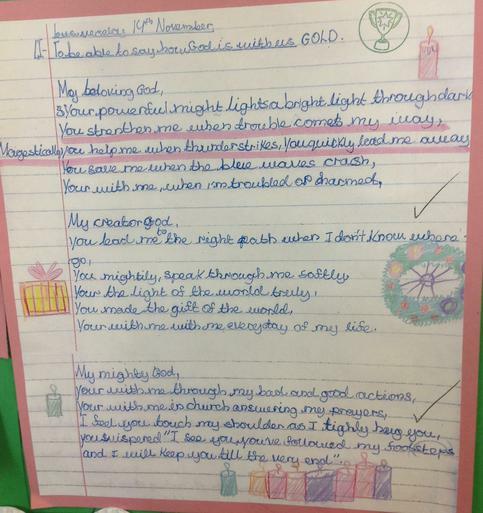 All classes produced such wonderful, thoughtful work. 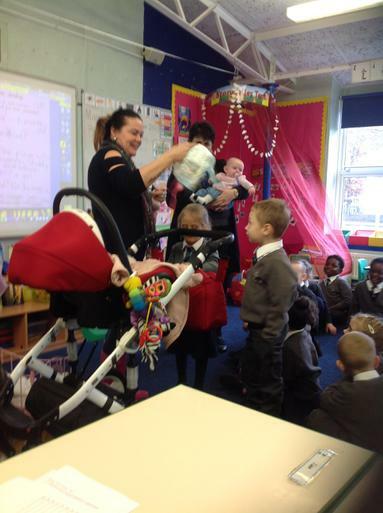 Thank you to all the families that supported this at home. 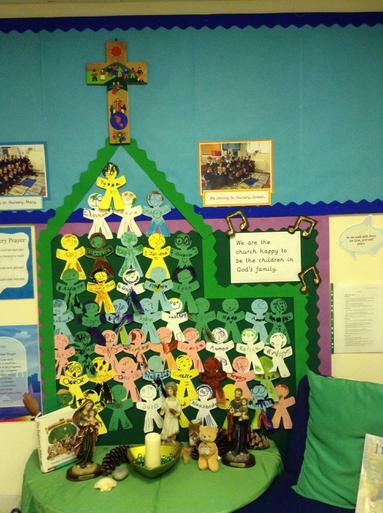 Please have a look at some of the work that was produced across the school. 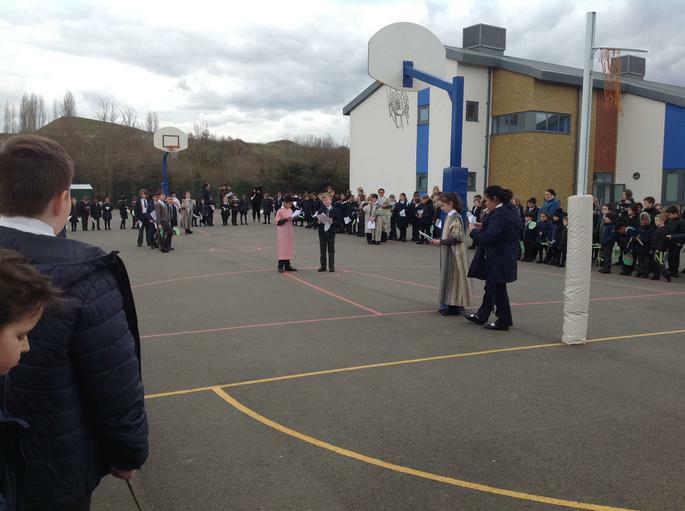 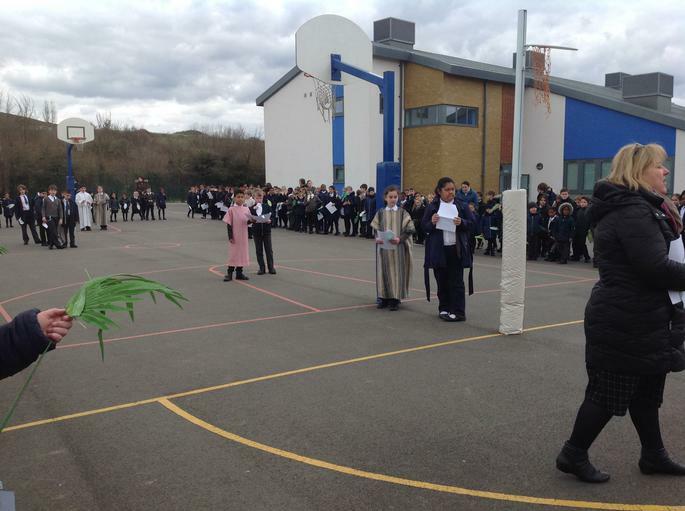 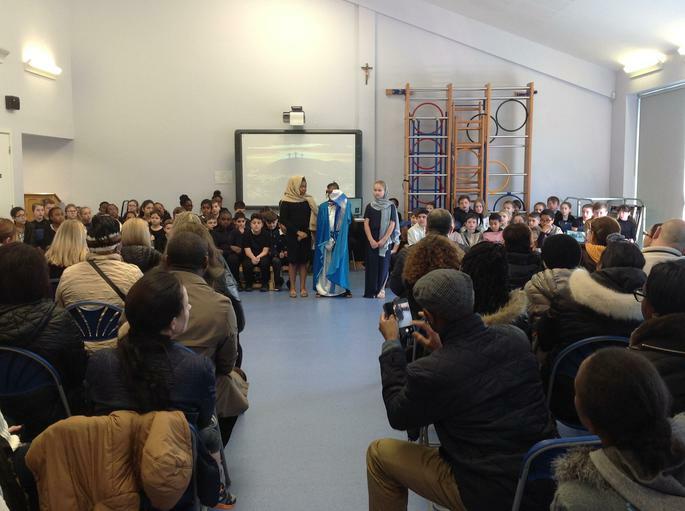 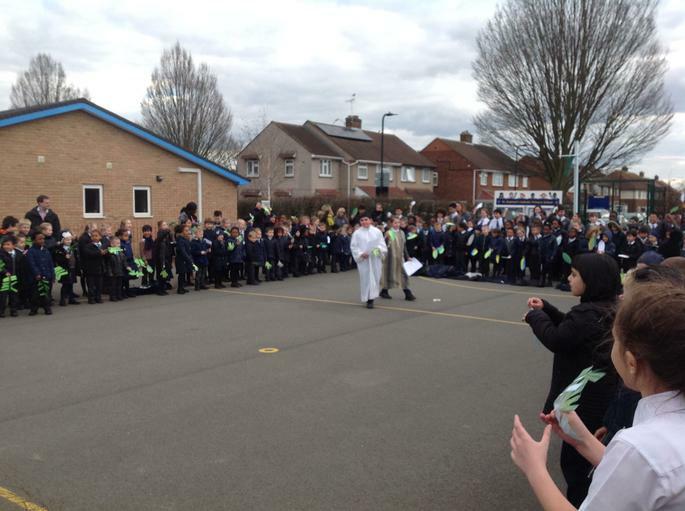 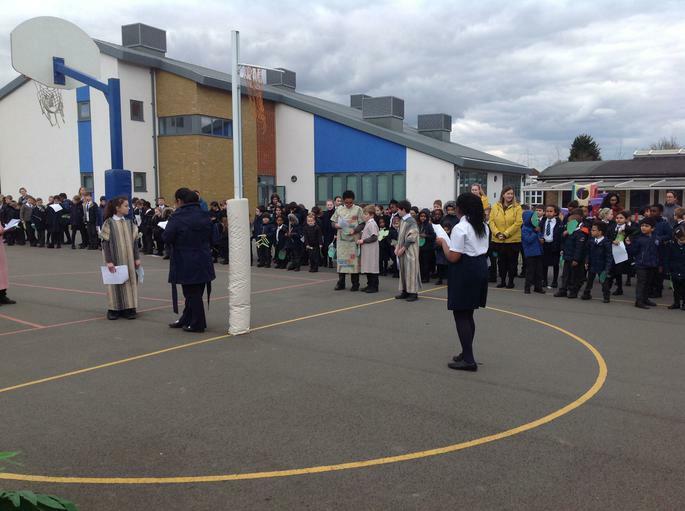 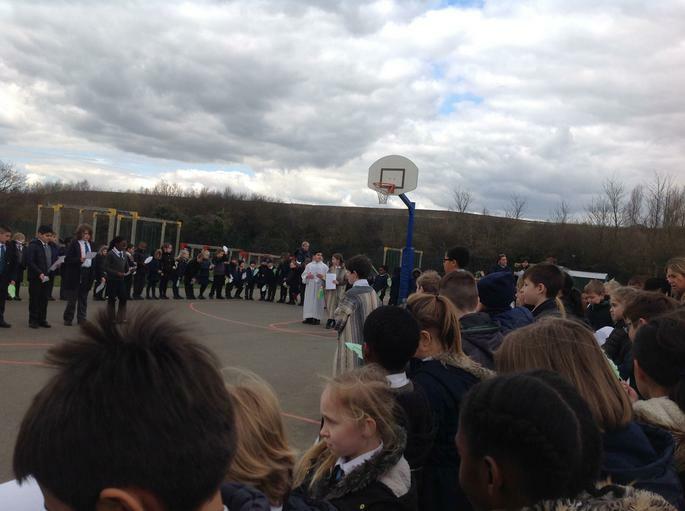 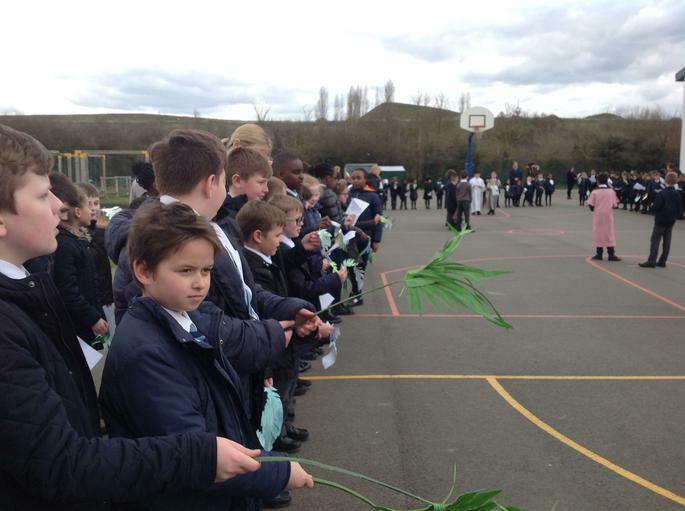 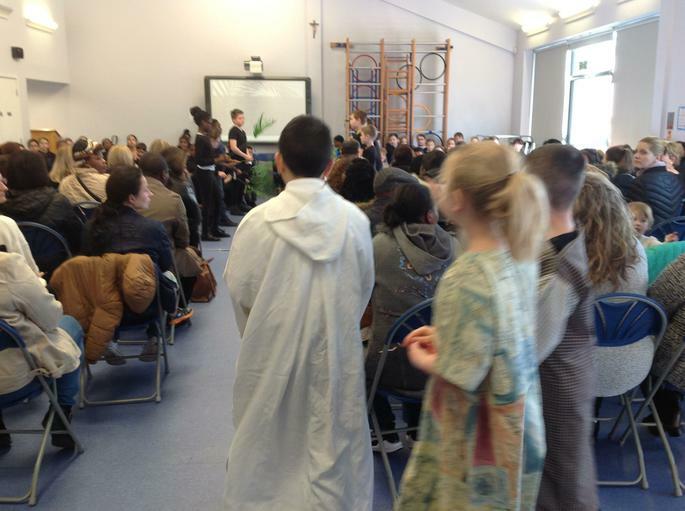 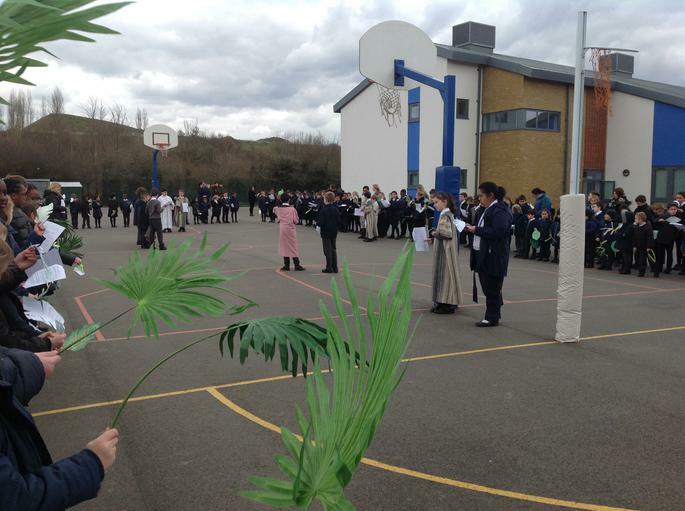 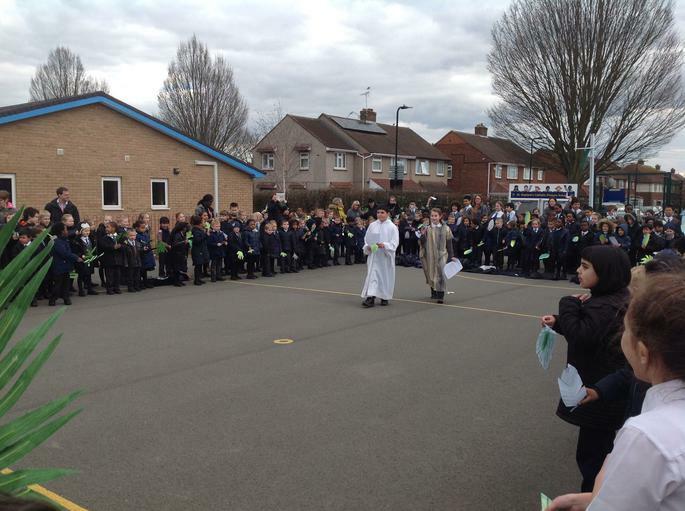 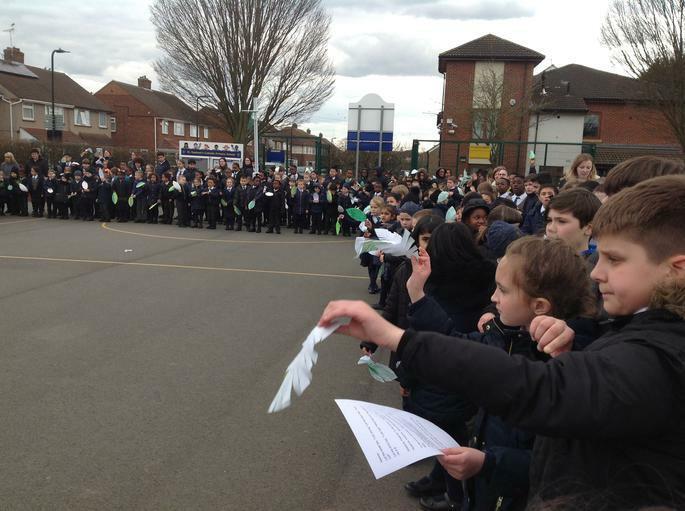 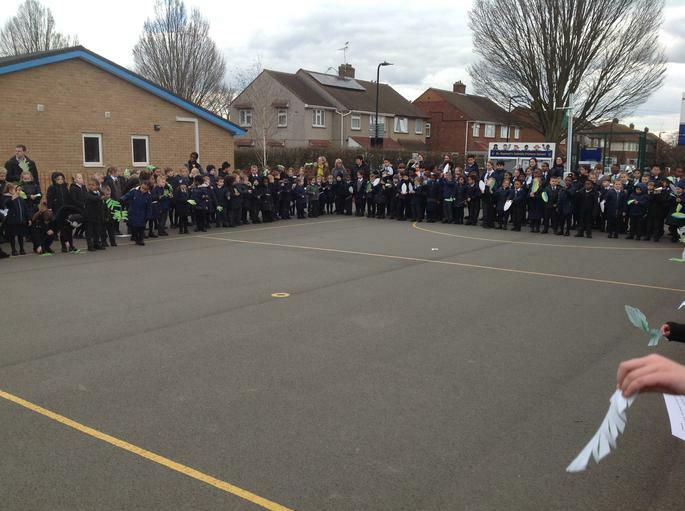 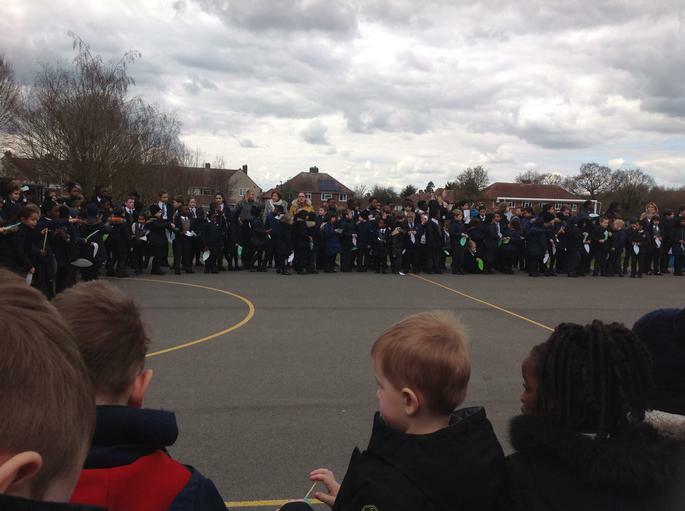 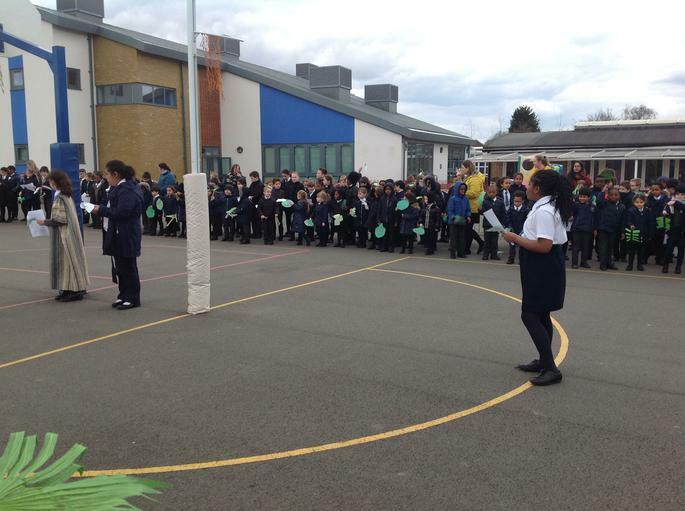 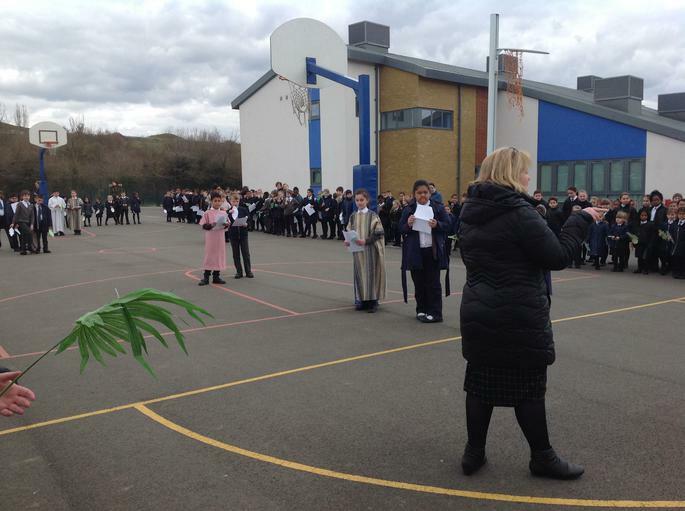 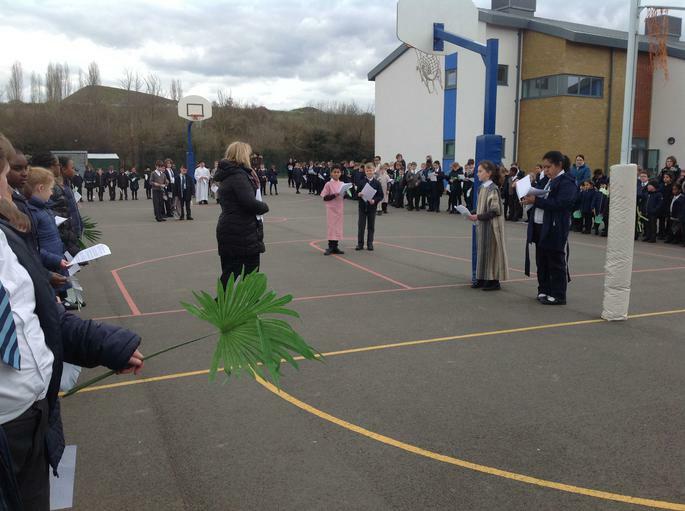 On Monday, the entire school took part in a procession to commemorate Jesus' triumphal entry into Jerusalem. 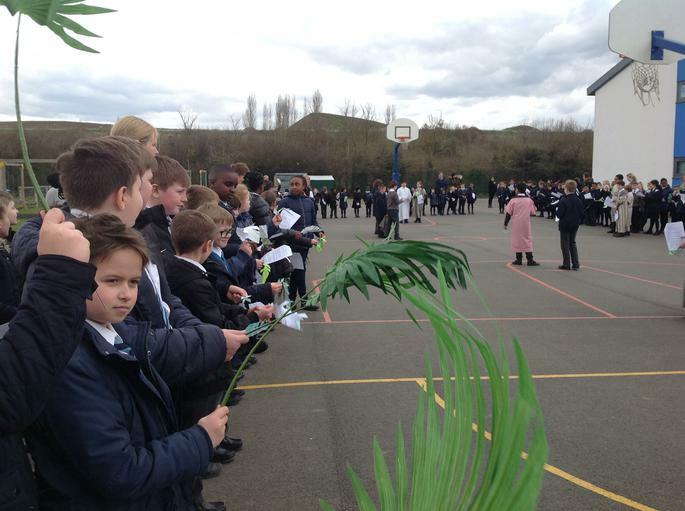 We all waved palms, representing the palm branches the crowd scattered in front of Jesus as he rode into Jerusalem. 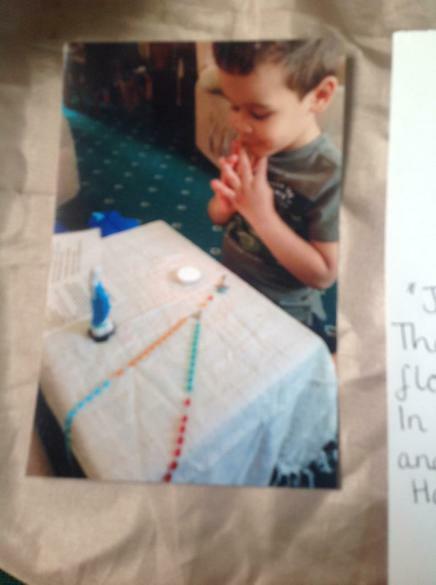 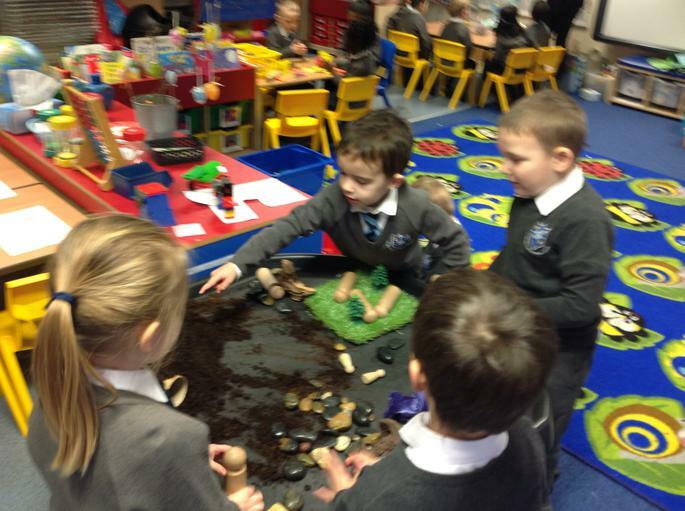 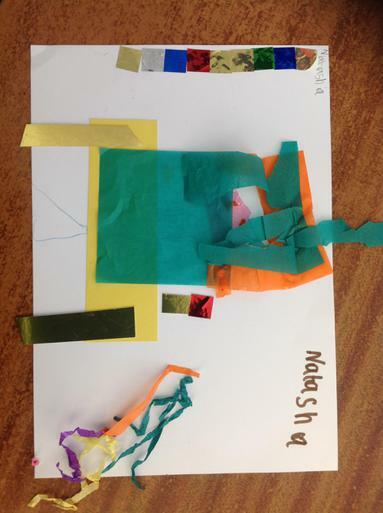 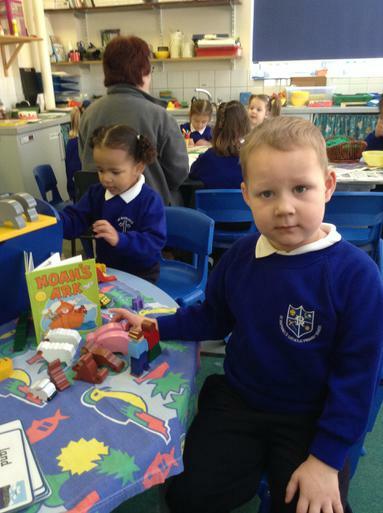 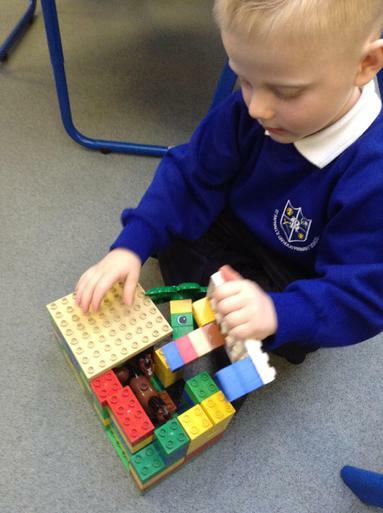 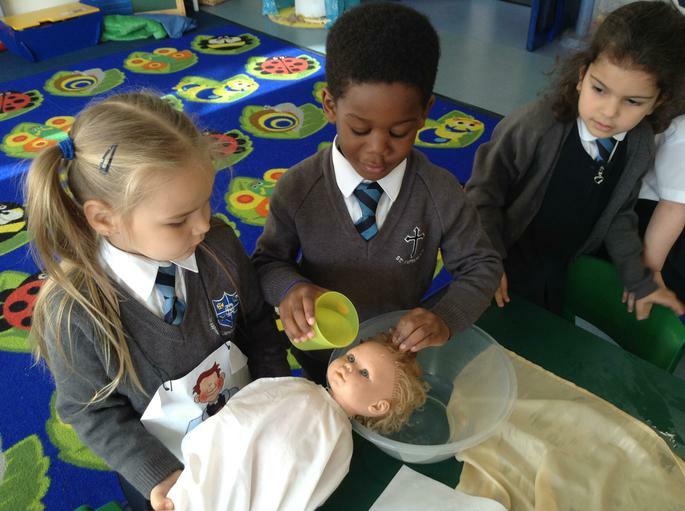 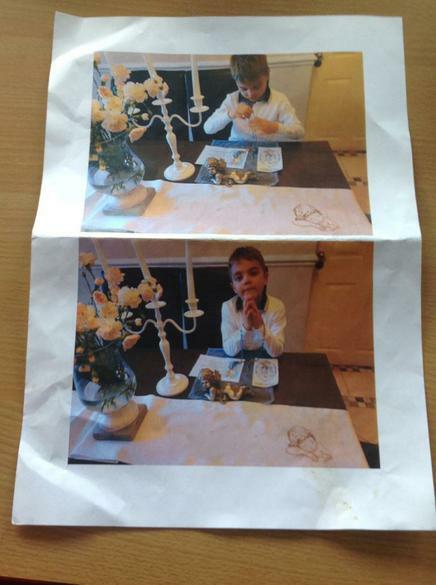 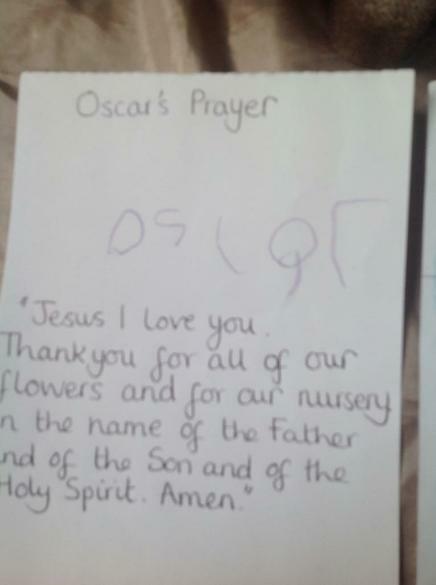 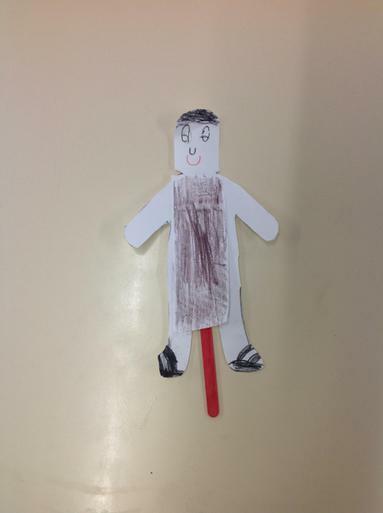 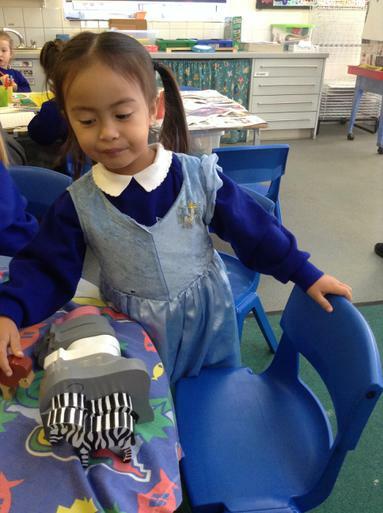 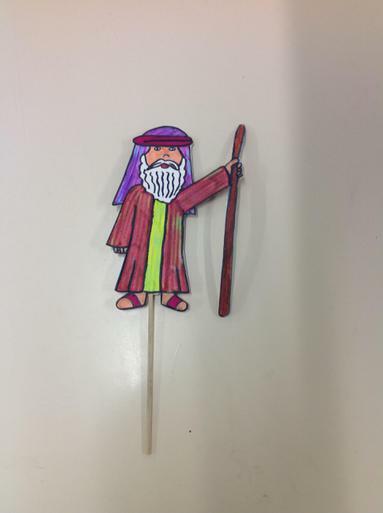 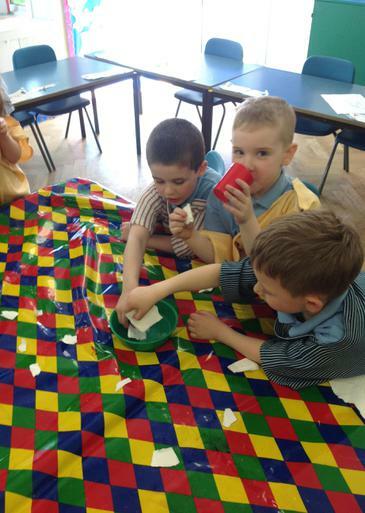 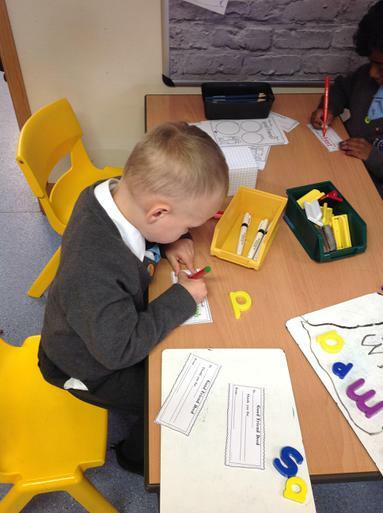 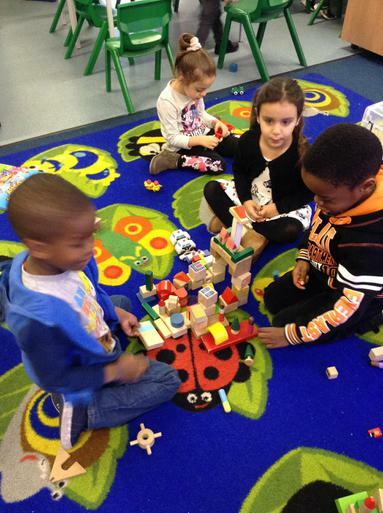 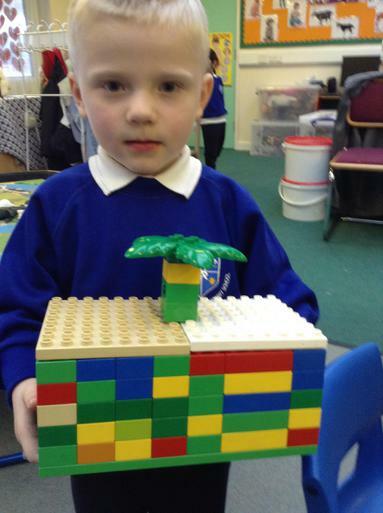 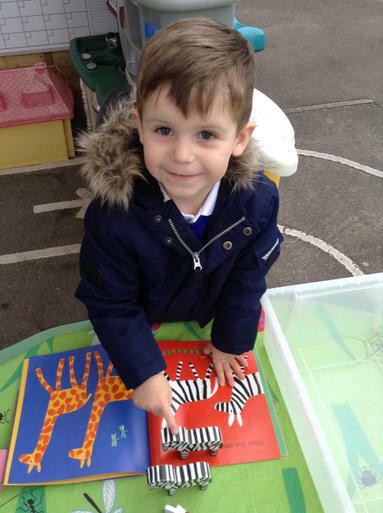 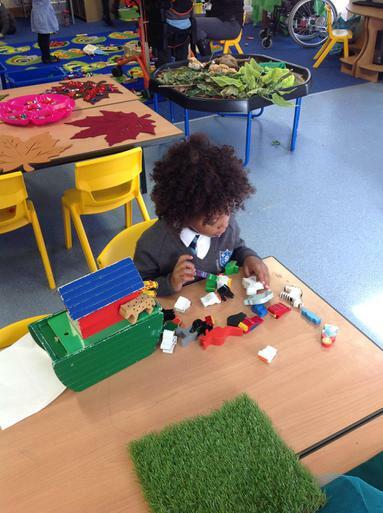 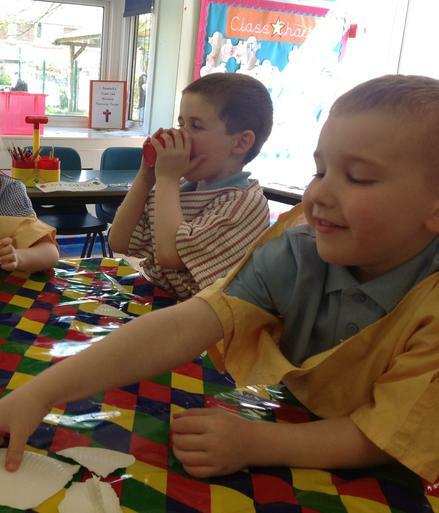 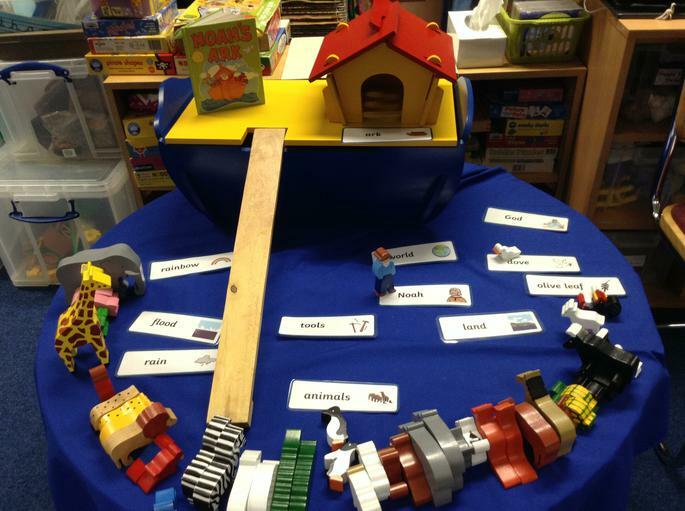 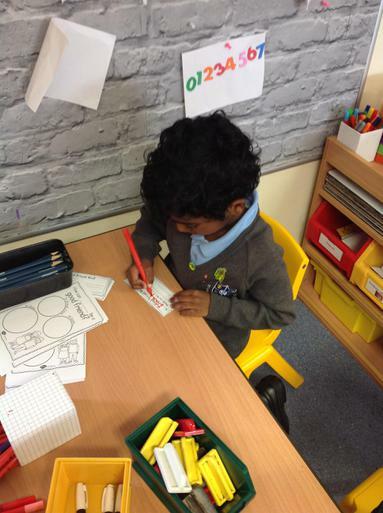 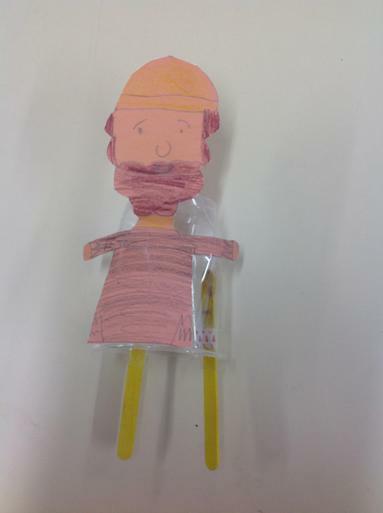 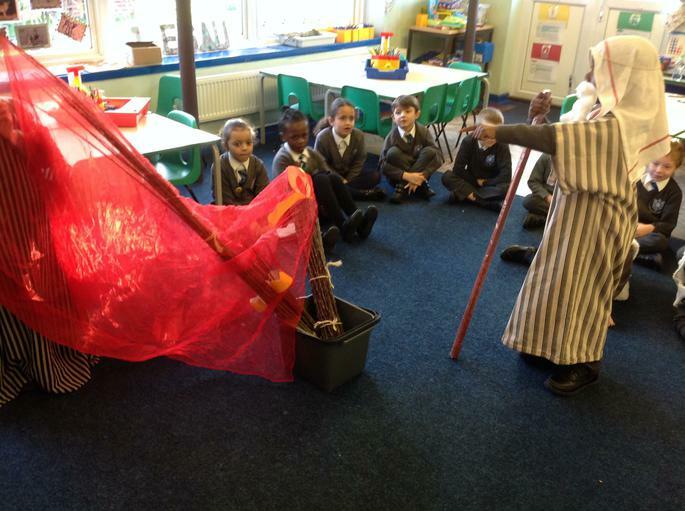 Nursery heard about God telling Noah he was a good man and gave him a very special job to do. 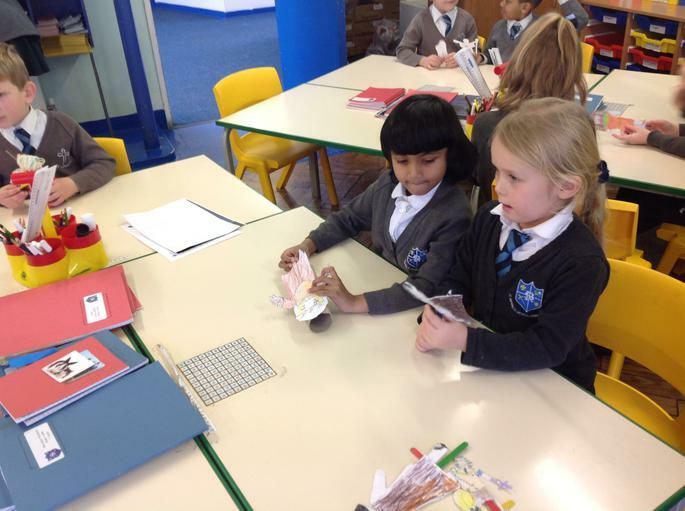 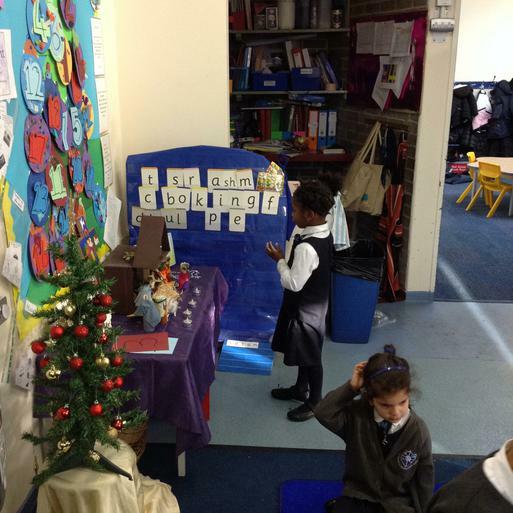 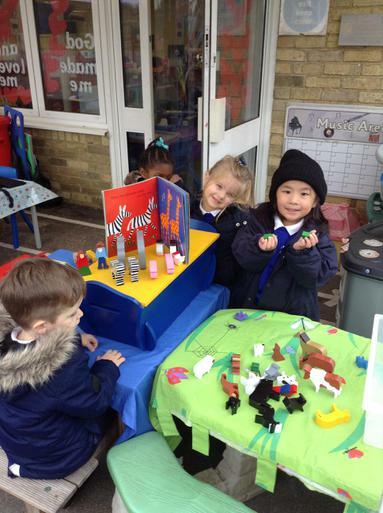 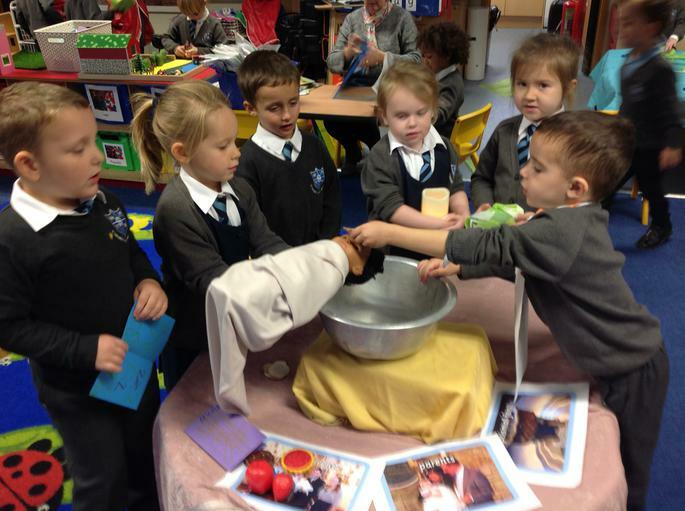 Nursery Mary and Joseph are beginning to think about giving to others in need. 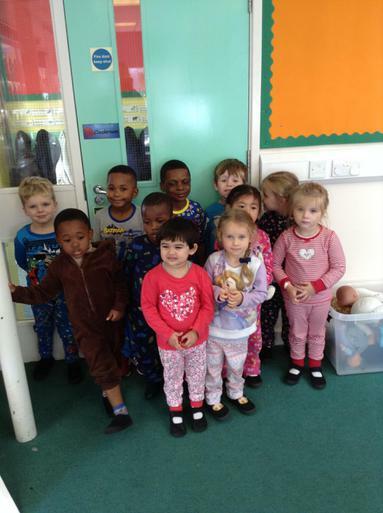 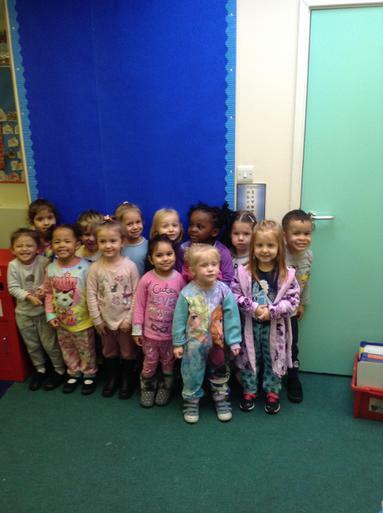 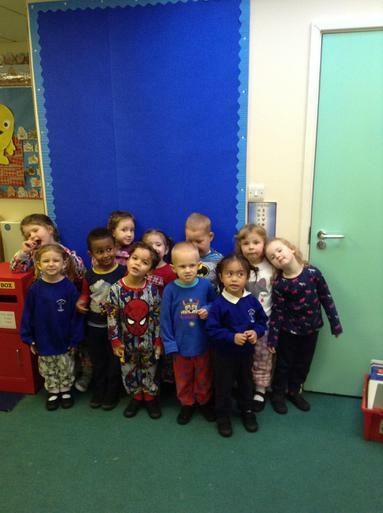 We dressed up in our pyjamas for our school charity 'action aid'. 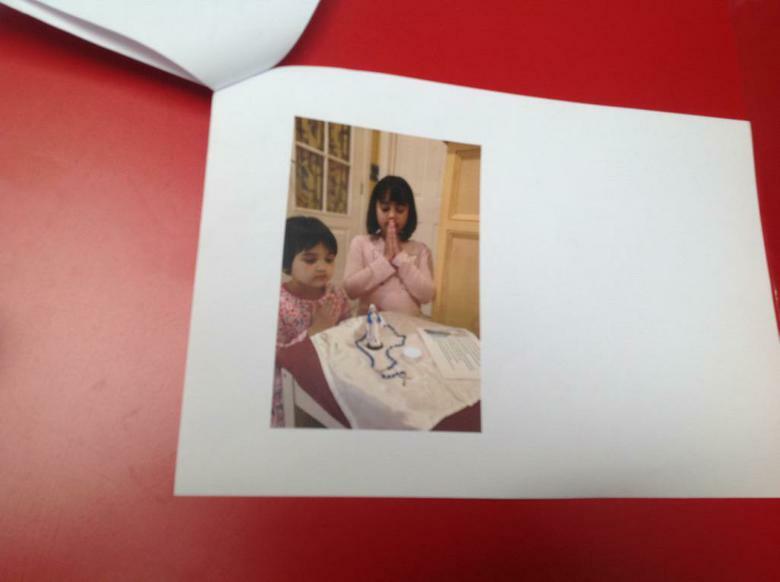 We brought in pictures of our families to talk about. 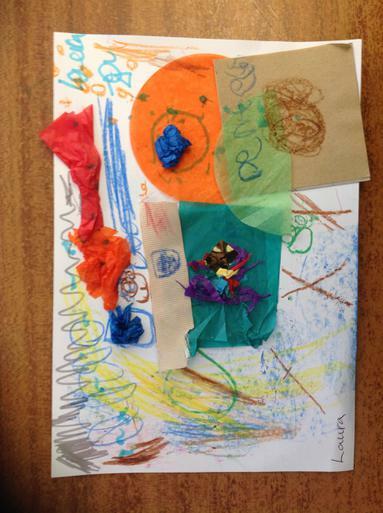 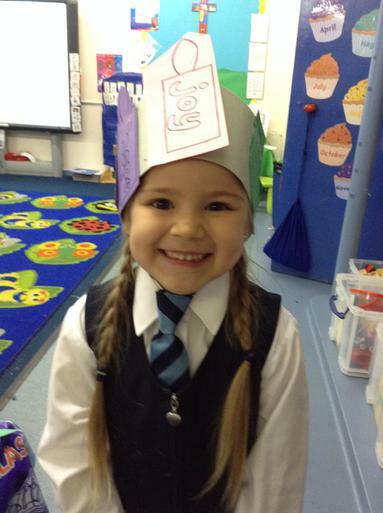 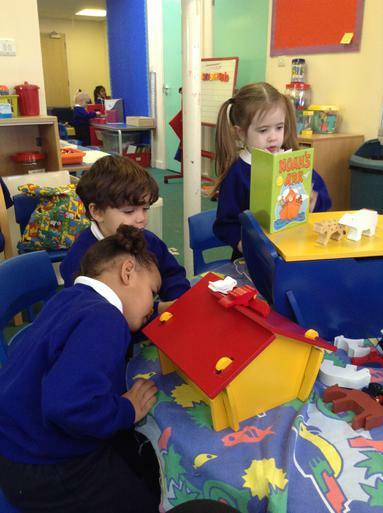 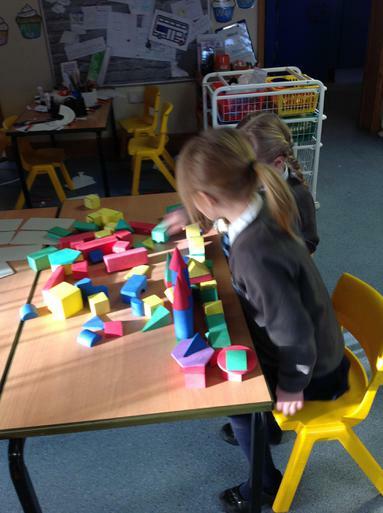 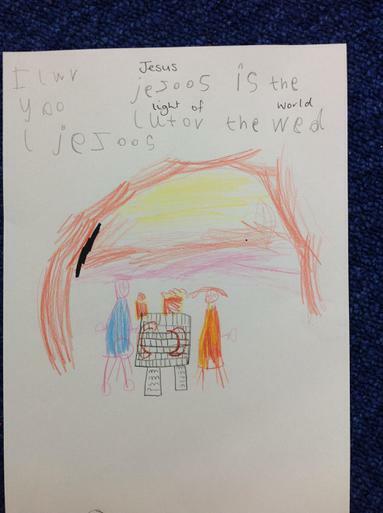 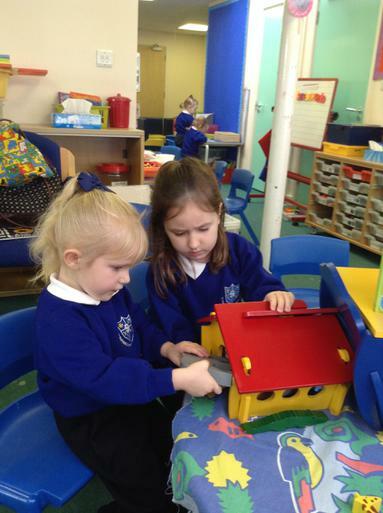 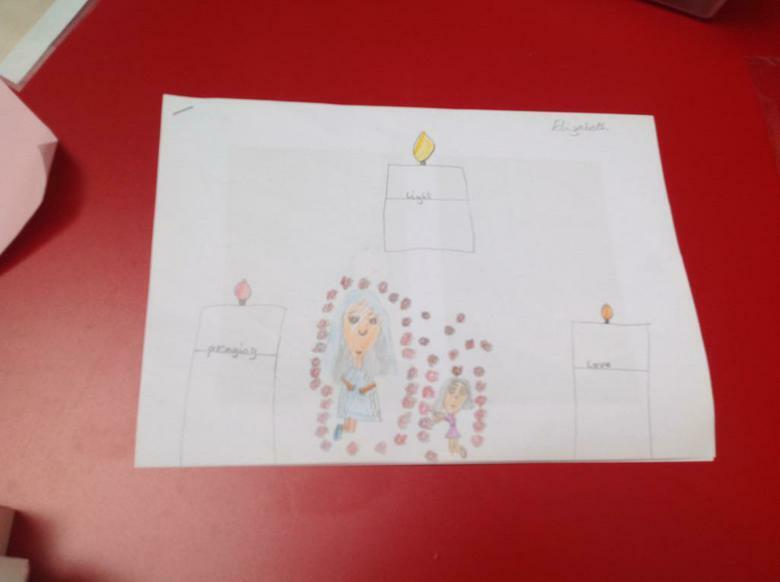 Nursery have been talking about the church being the house of God and how they belong to God's family. 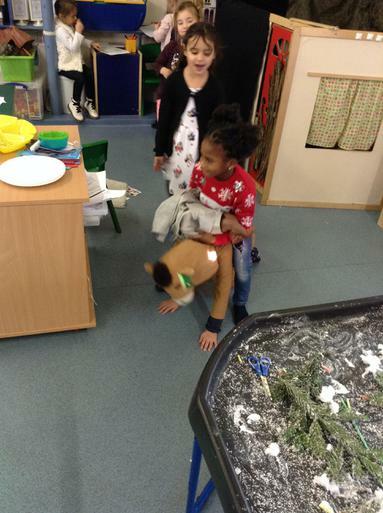 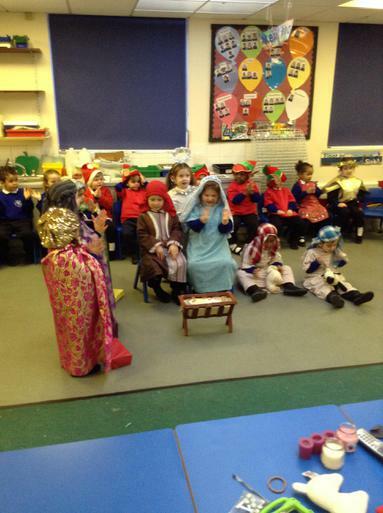 The children celebrated the Christmas story through songs and role-play. 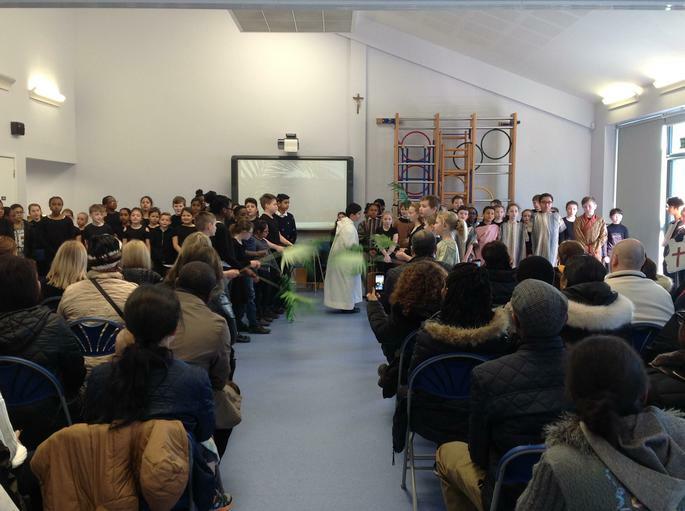 They performed with a great deal of enthusiasm and I'm sure all families were delighted. 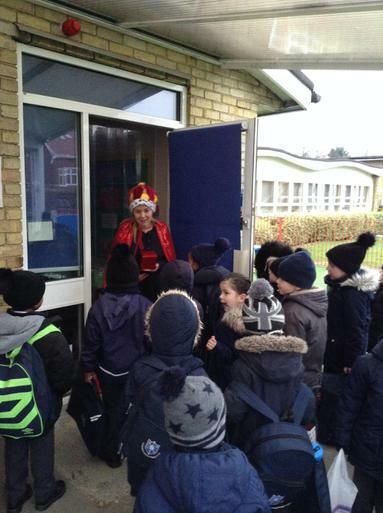 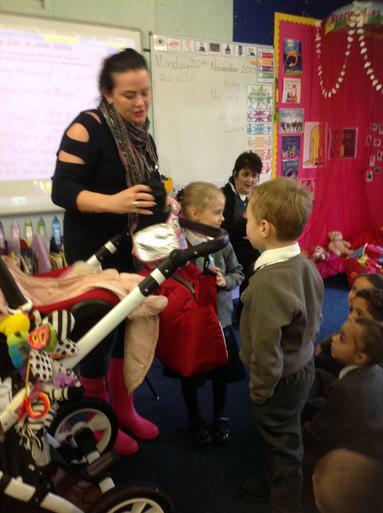 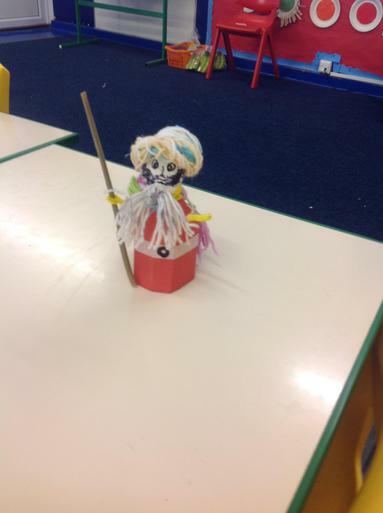 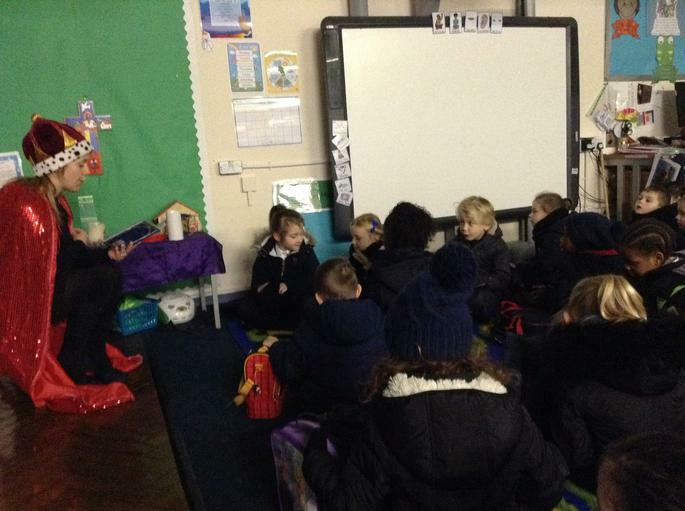 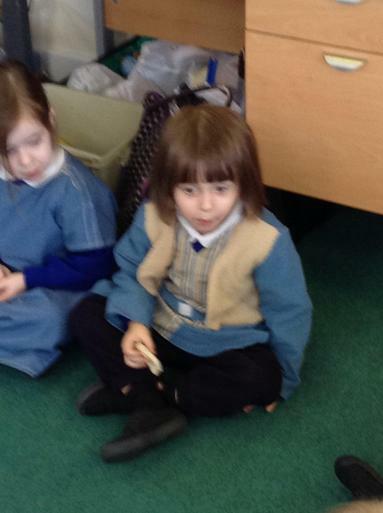 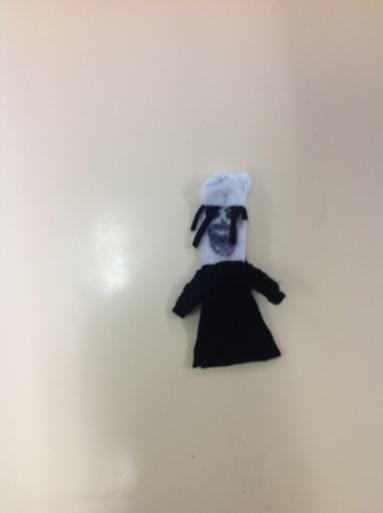 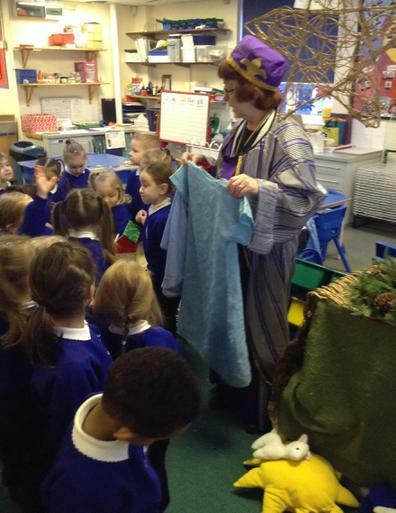 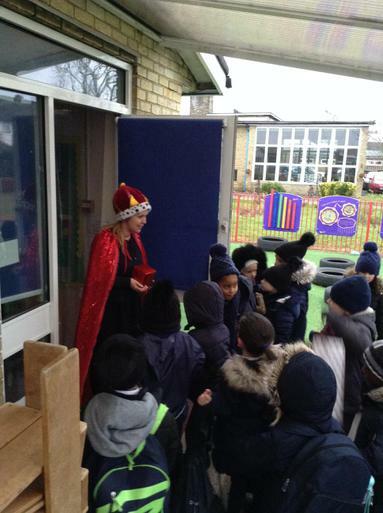 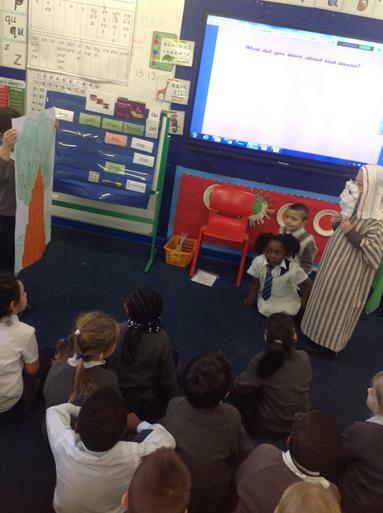 This week the Nursery children had a visitor, Casper, one of the Magi! 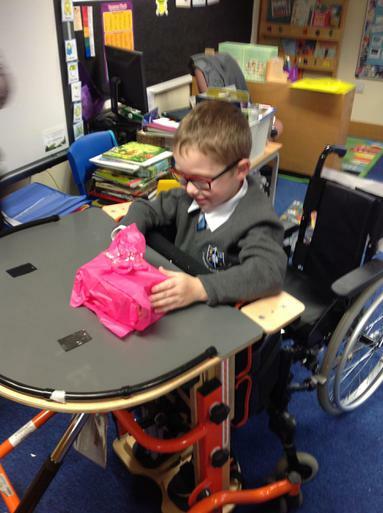 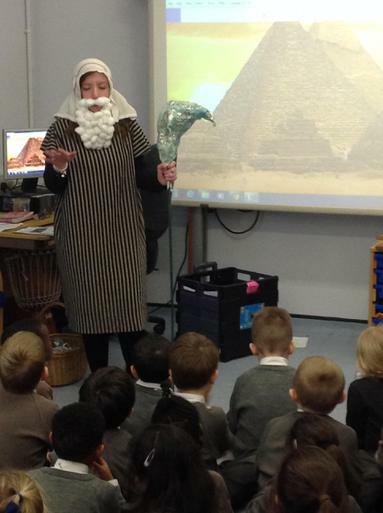 They heard all about his journey from the East and the very special person he came to visit. 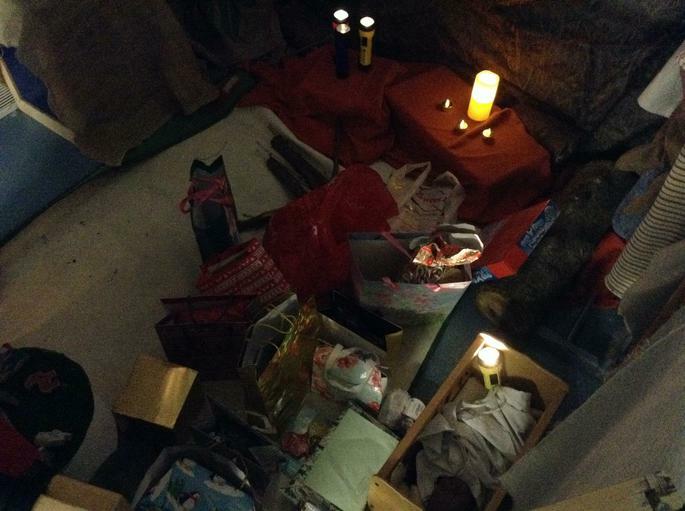 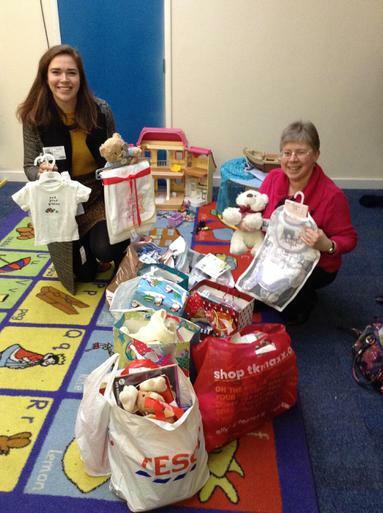 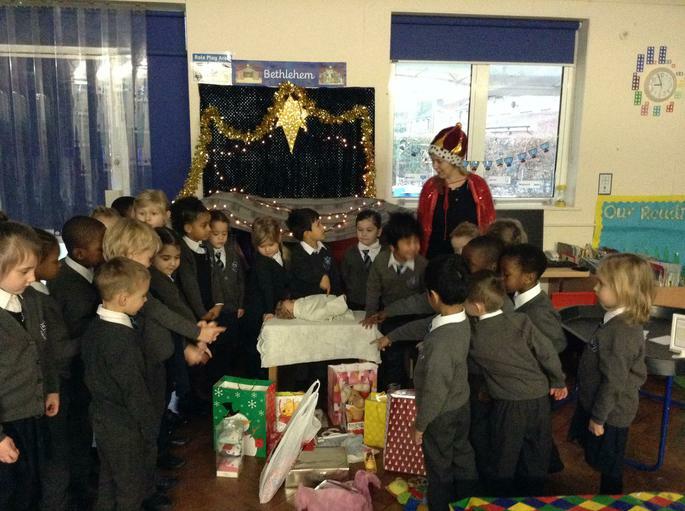 The children even brought in gifts for the baby Jesus, which were then given to the charity Caritas. 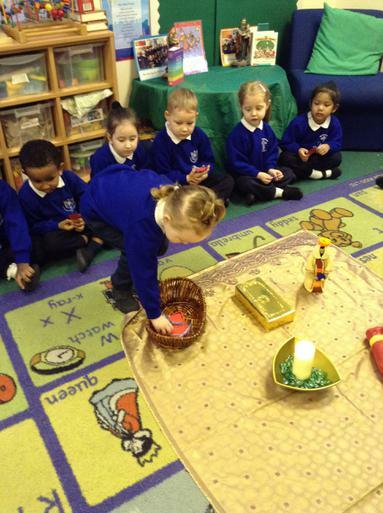 Within the Nursery the children gave baby Jesus their own special gift; "Jesus I give you my heart", as they placed them in a basket at the prayer space. 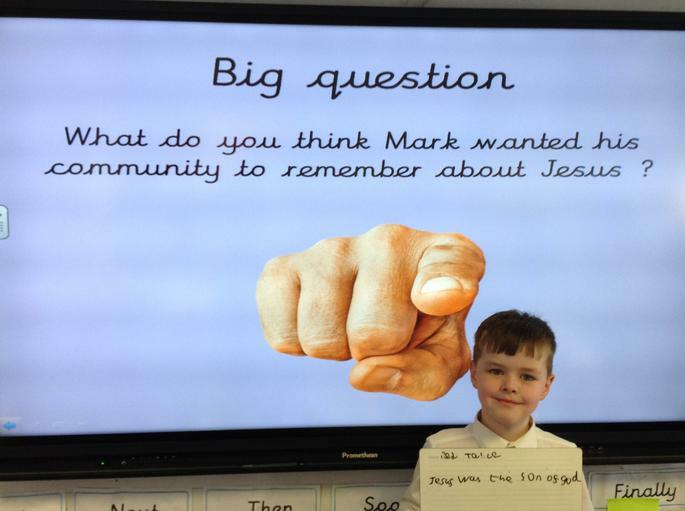 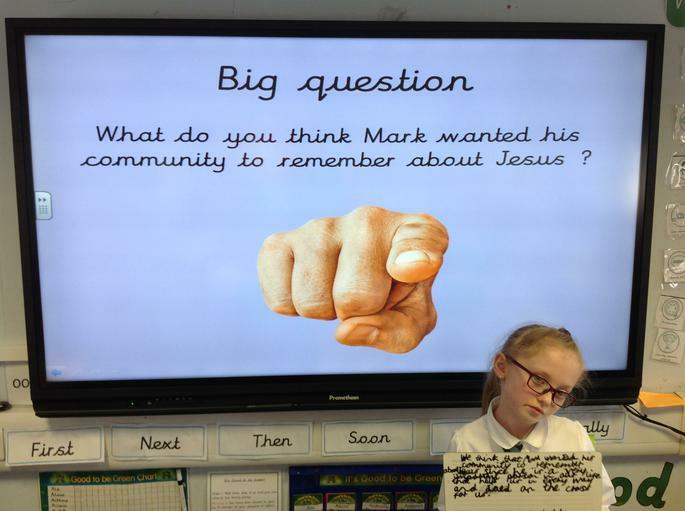 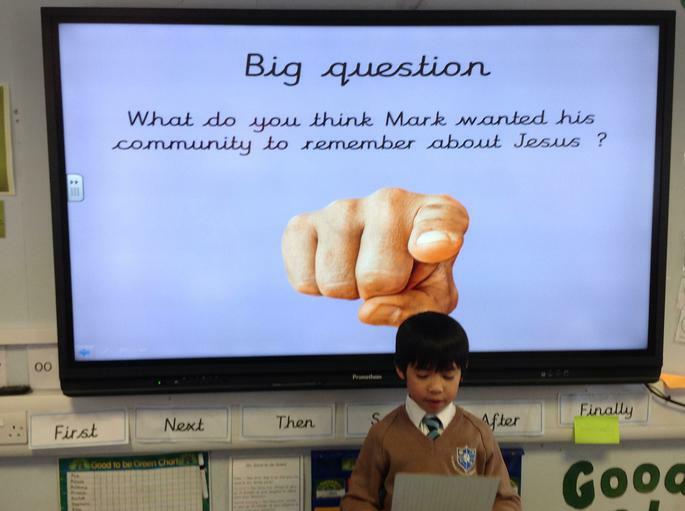 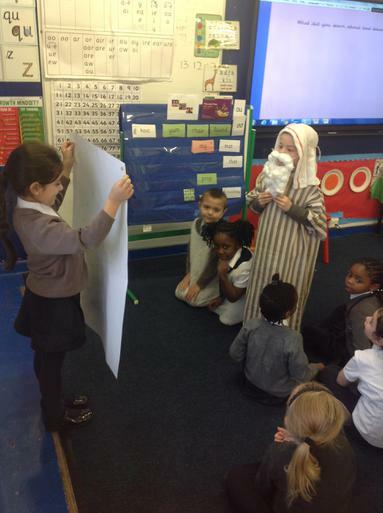 Nursery Mary and Nursery Joseph children taking part in role play and reponding to what happenned to Jesus and his friends in Holy Week. 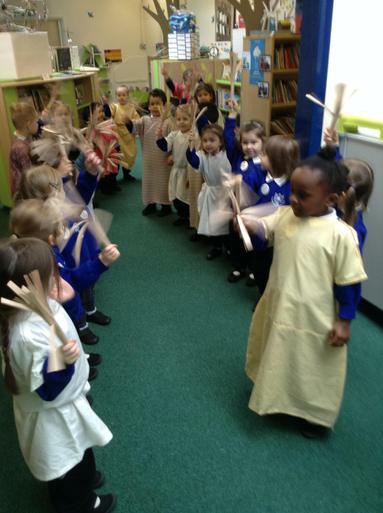 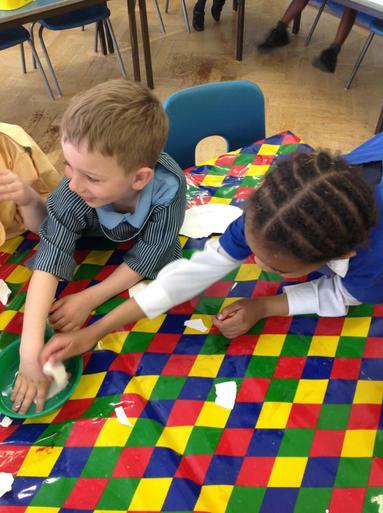 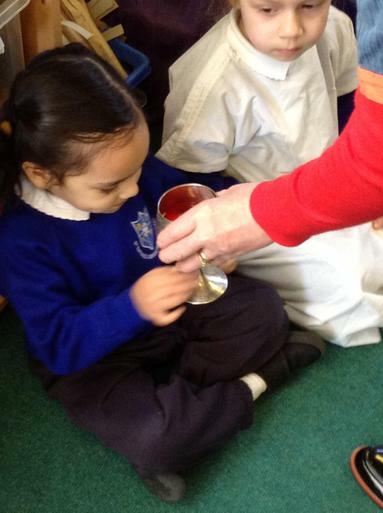 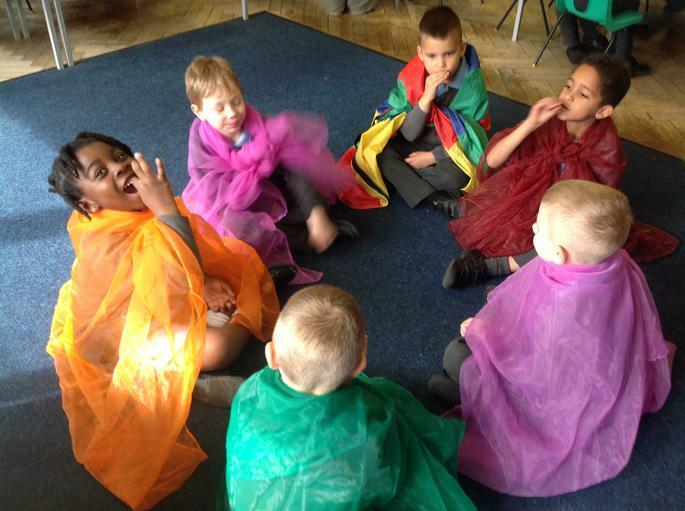 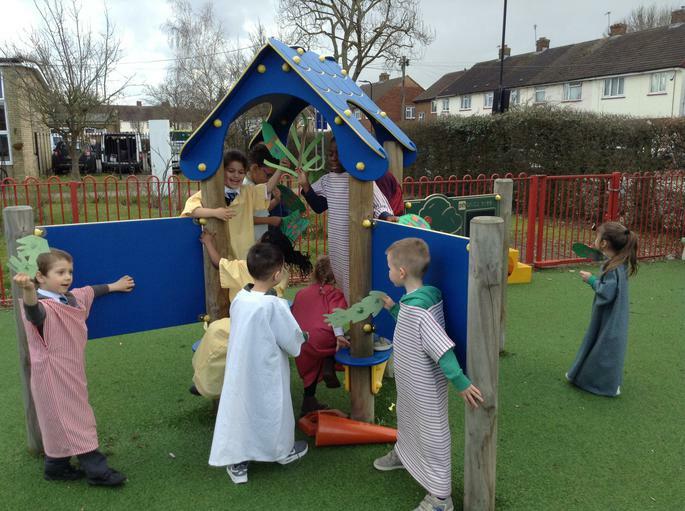 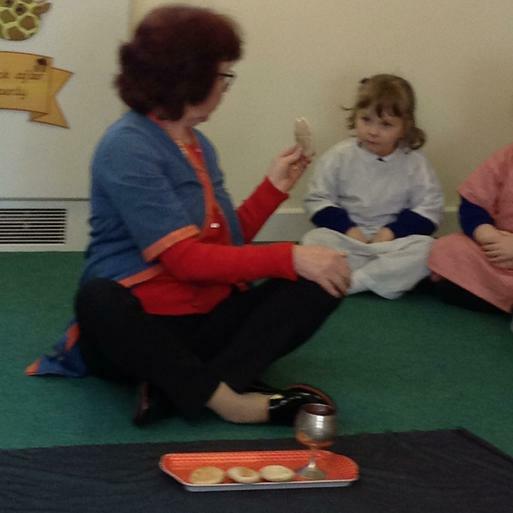 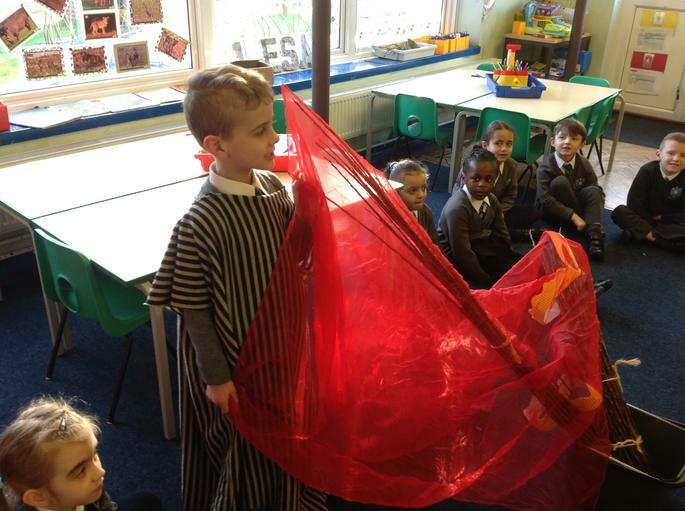 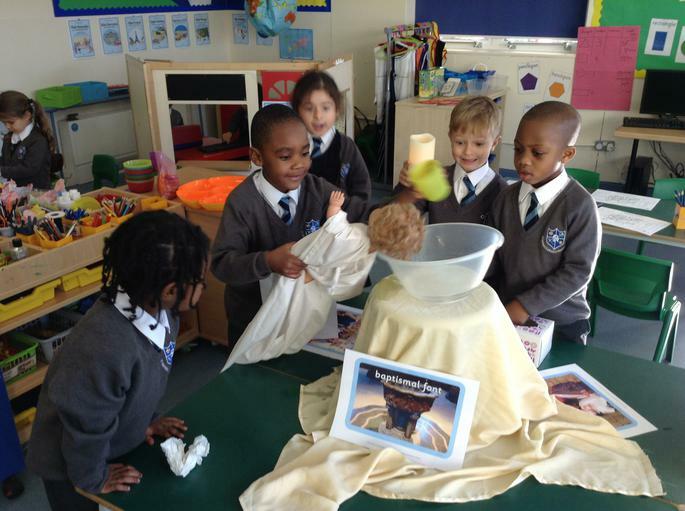 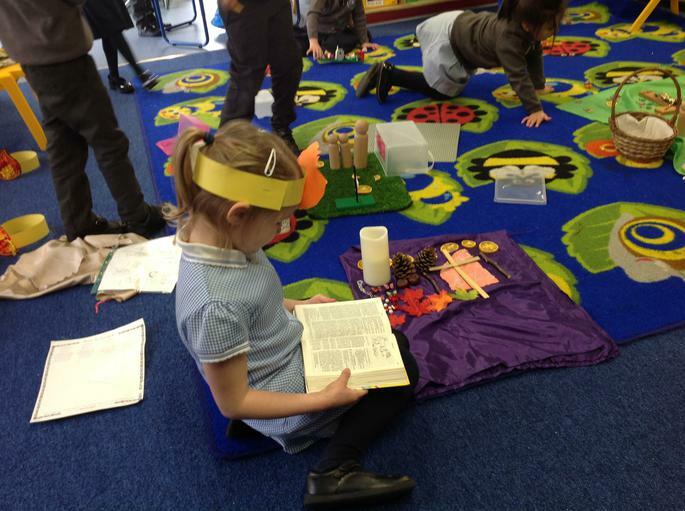 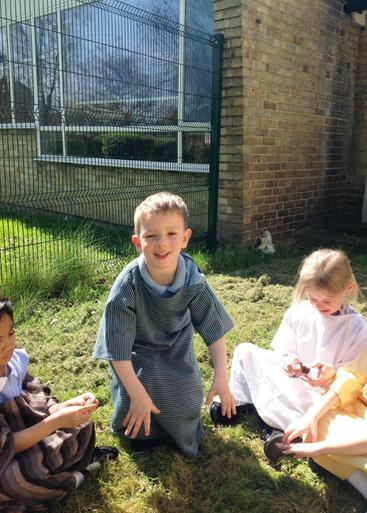 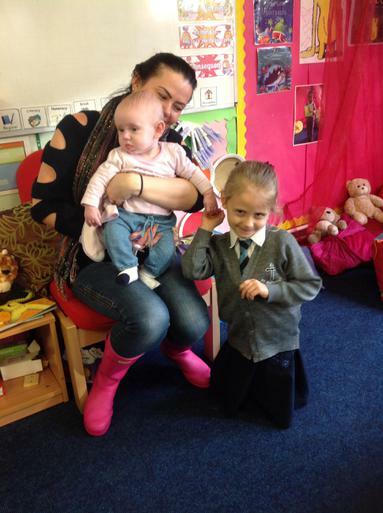 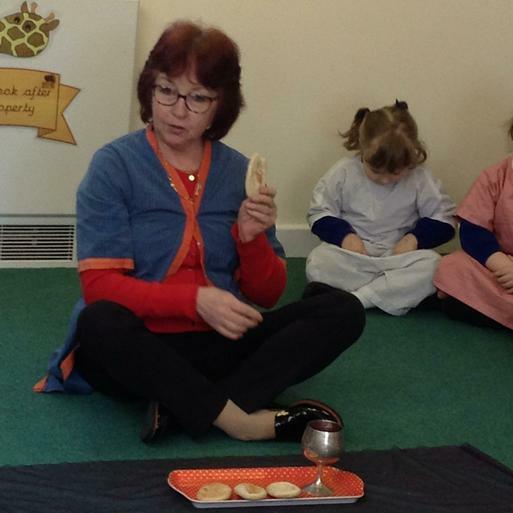 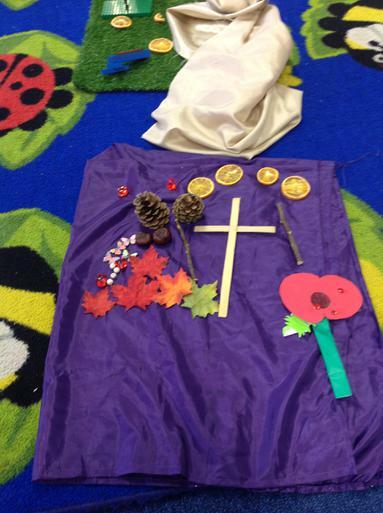 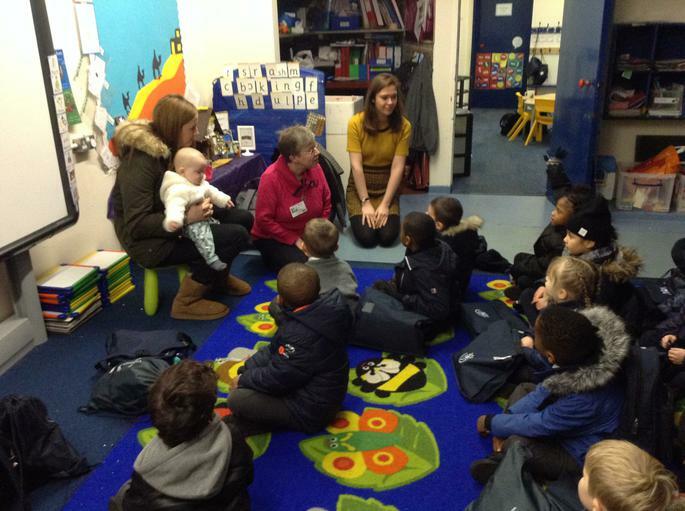 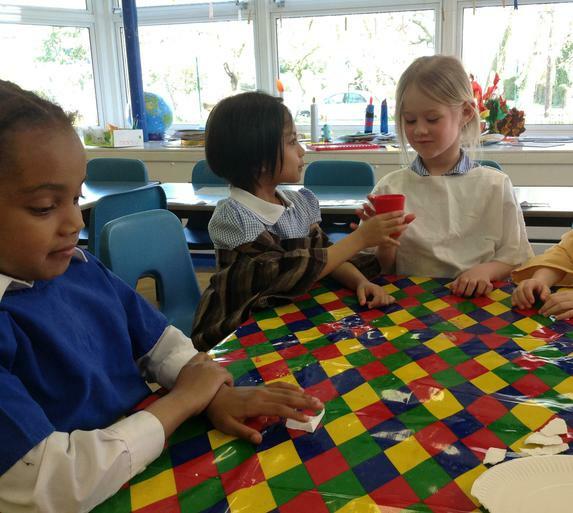 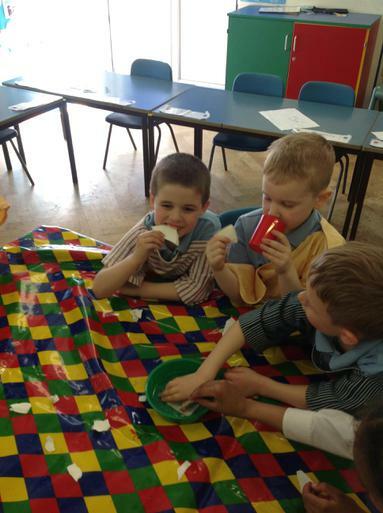 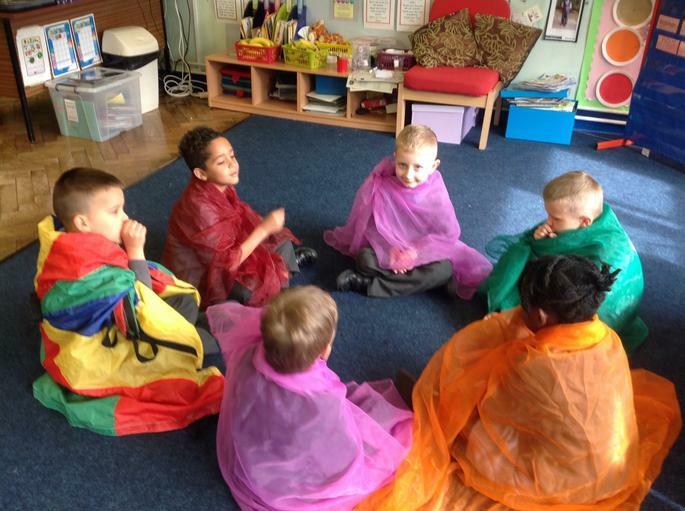 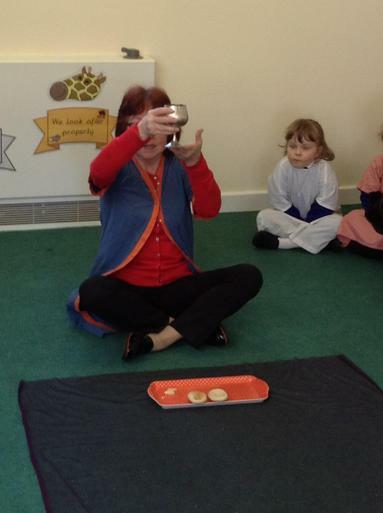 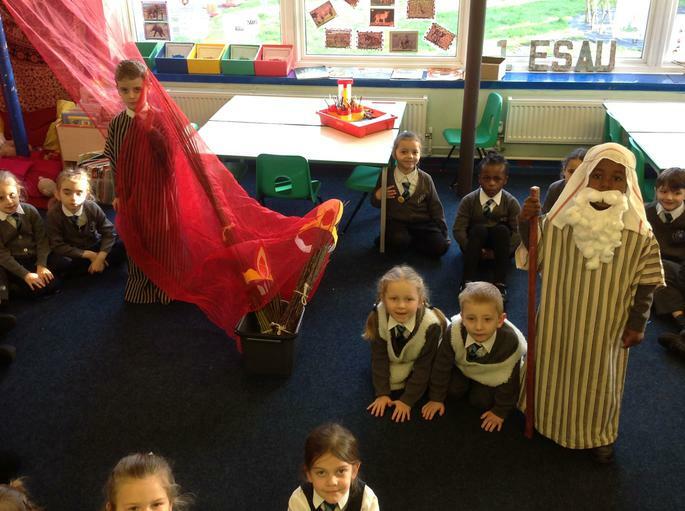 In the spring term, Nursery listened to and role played the story of Holy Week. 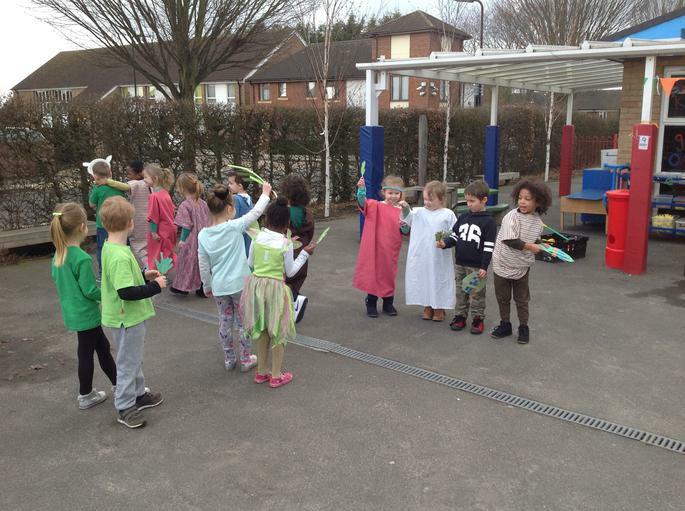 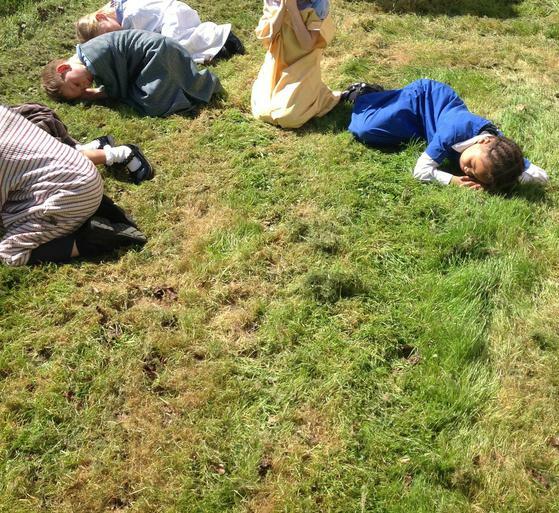 We had our own Palm Sunday procession, we shared a Last Supper with bread and 'wine' and fell asleep like Jesus' friends in the garden of Gethsemane . 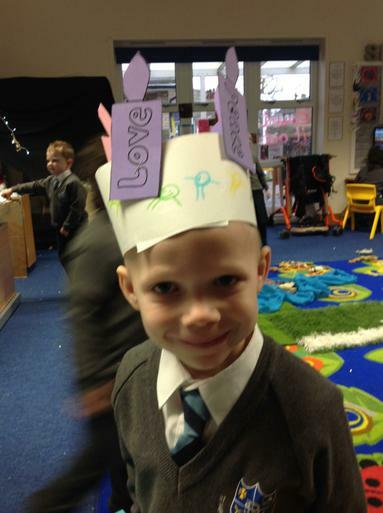 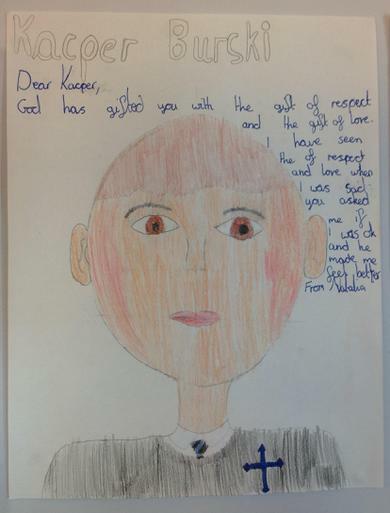 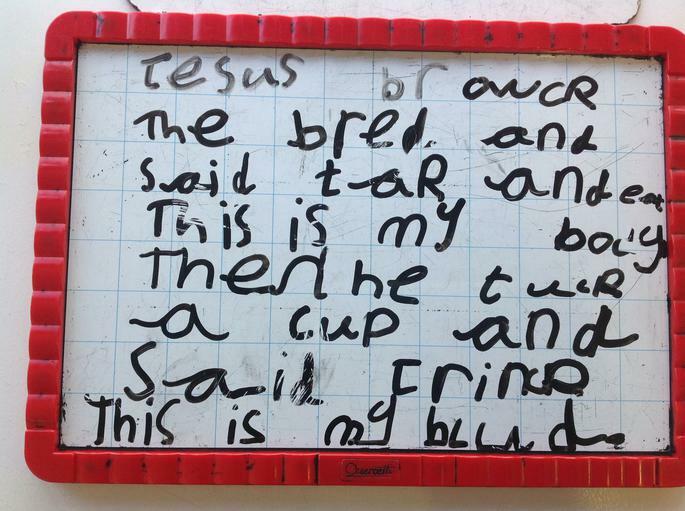 Reception have been learning about how God loves all people. 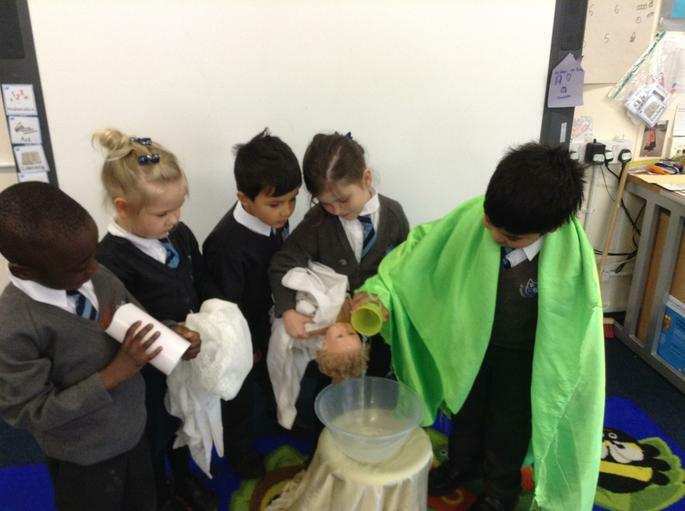 The children heard how Baptism welcomes new babies into the family of the church. 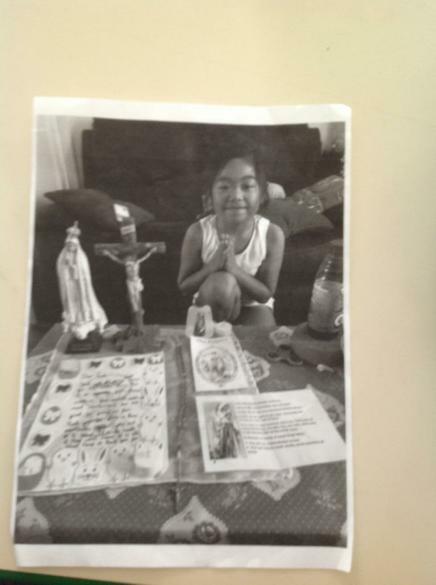 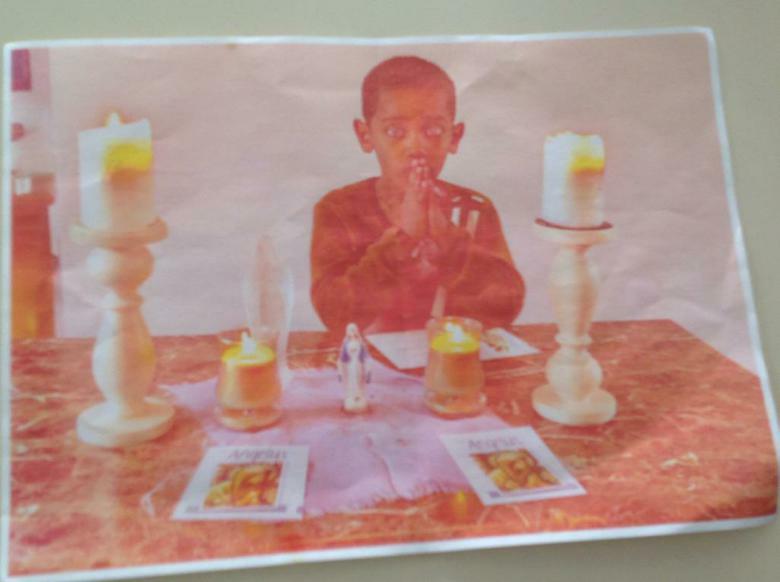 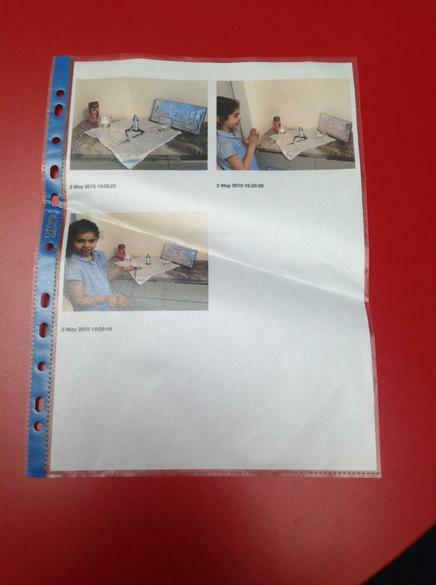 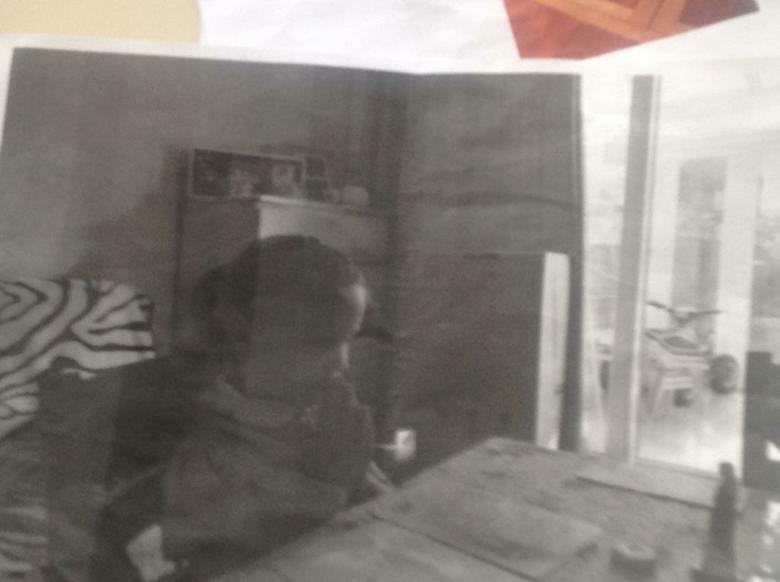 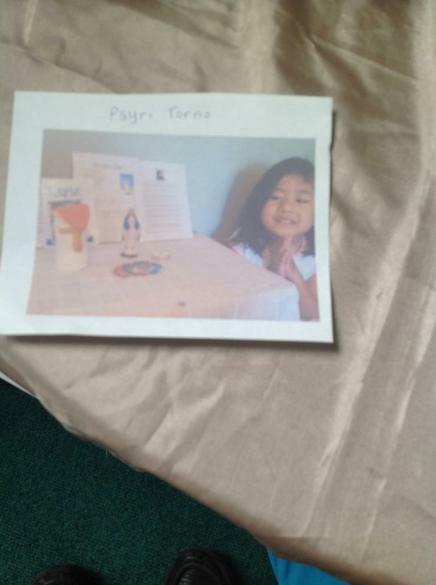 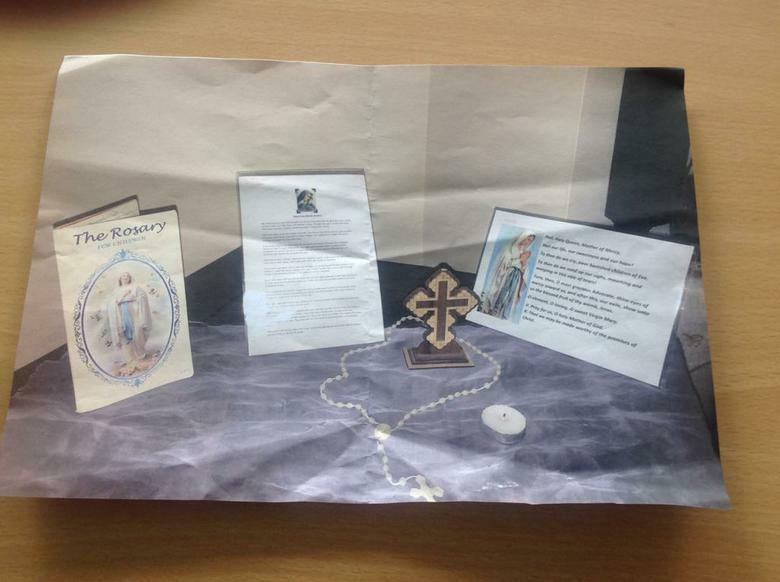 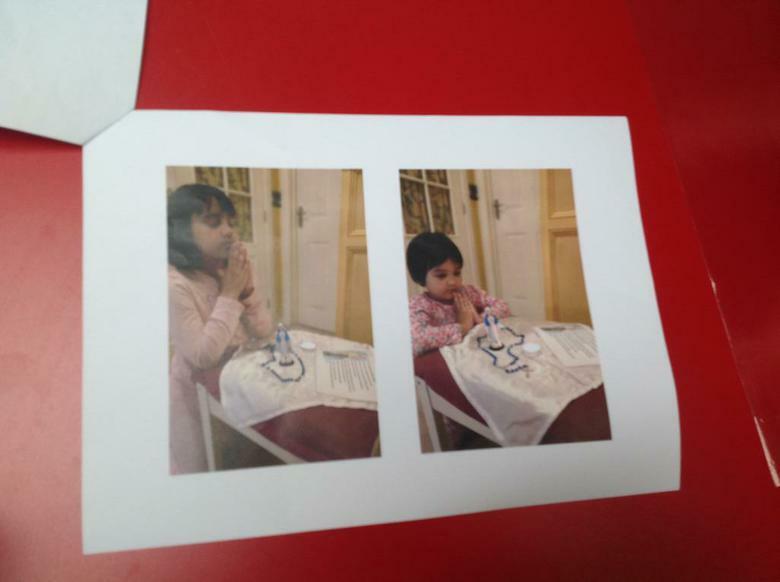 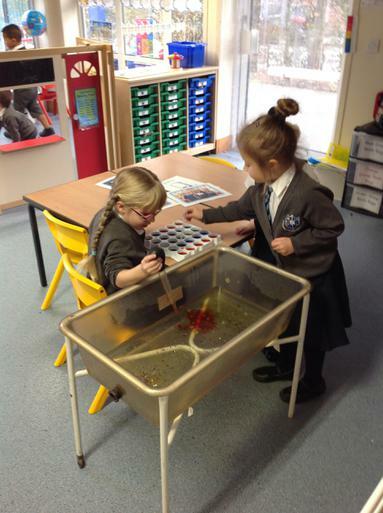 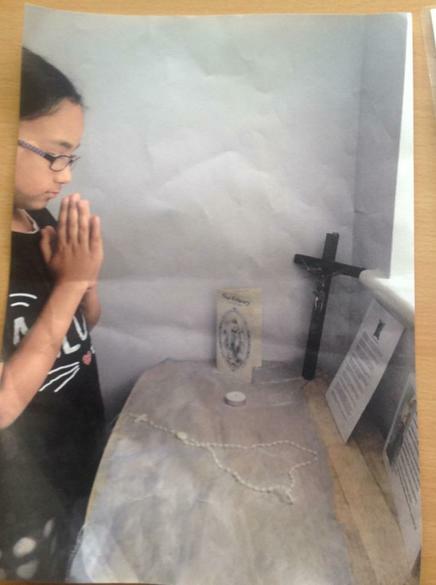 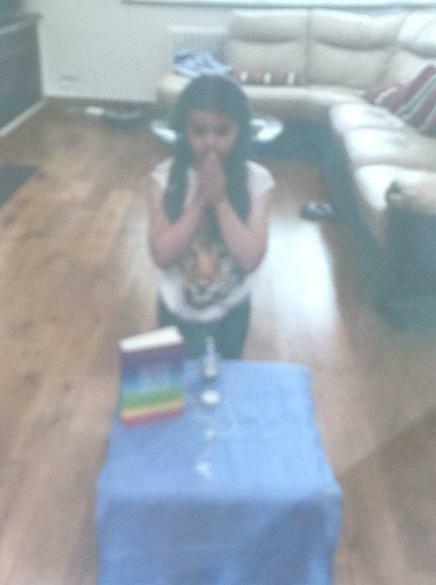 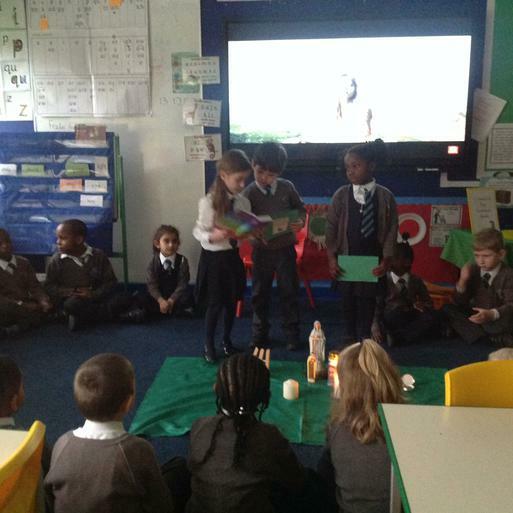 The children also had an opportunity to show their own Baptism photographs to their friends during circle time. 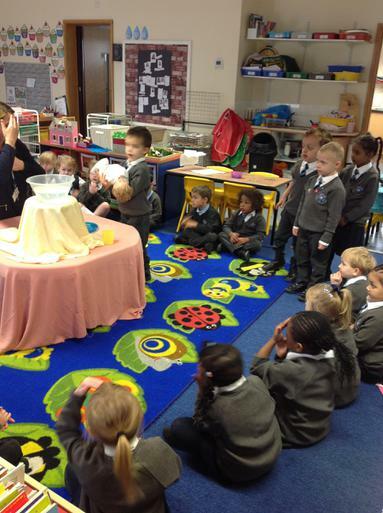 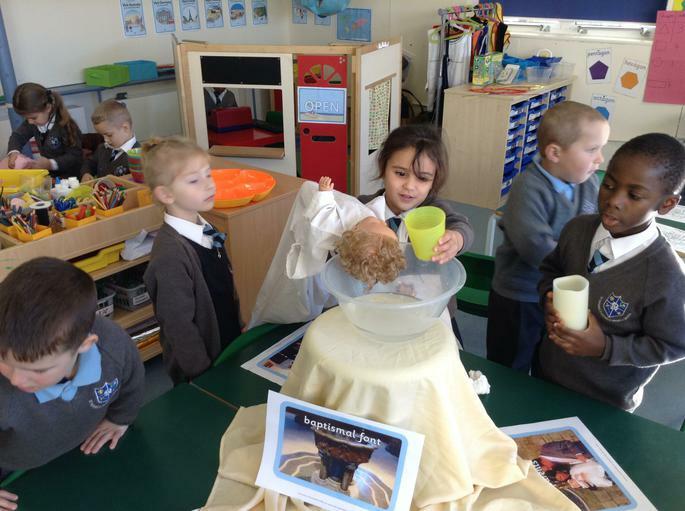 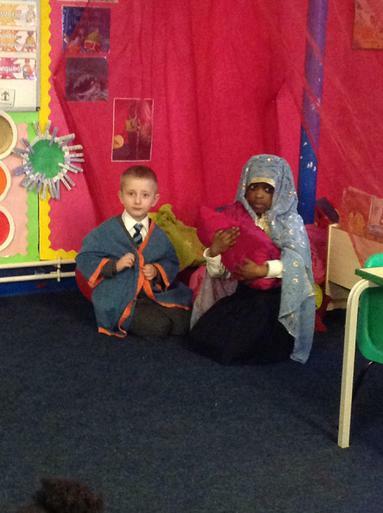 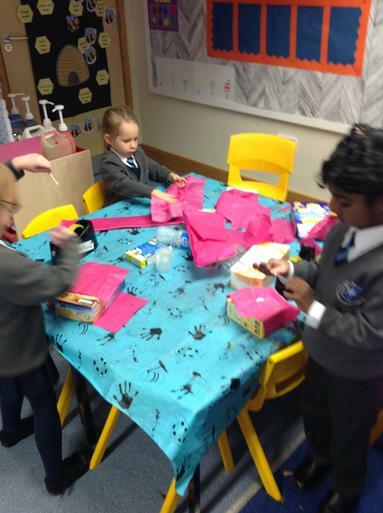 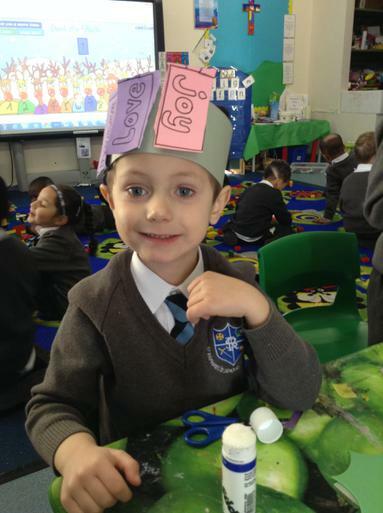 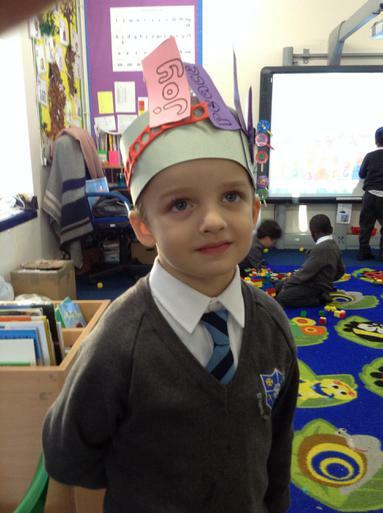 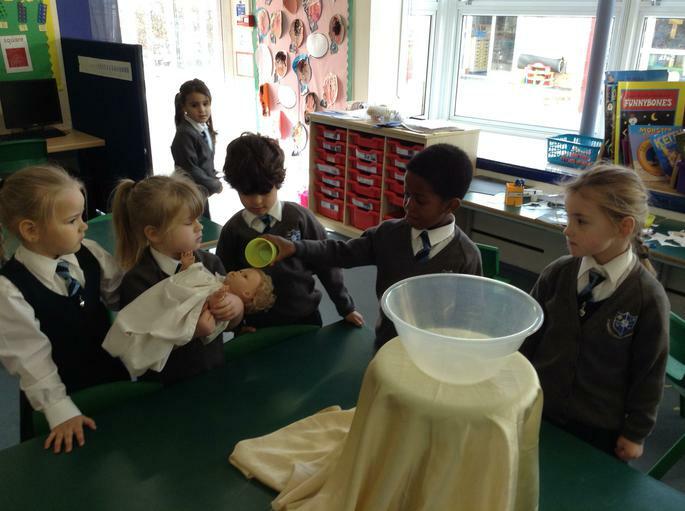 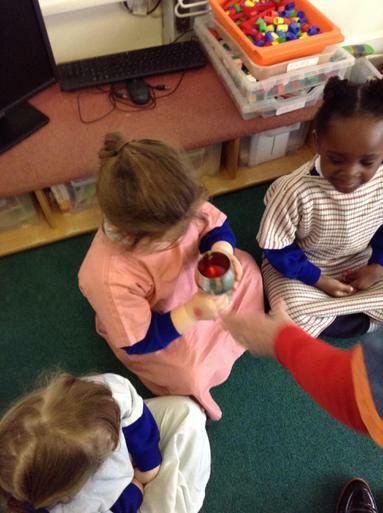 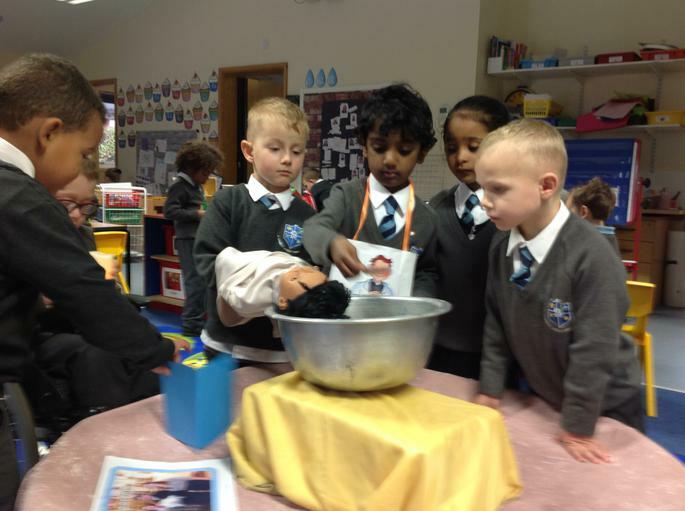 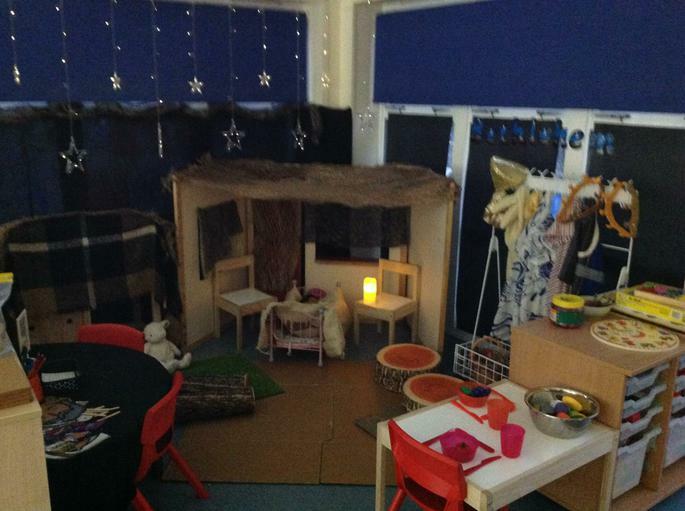 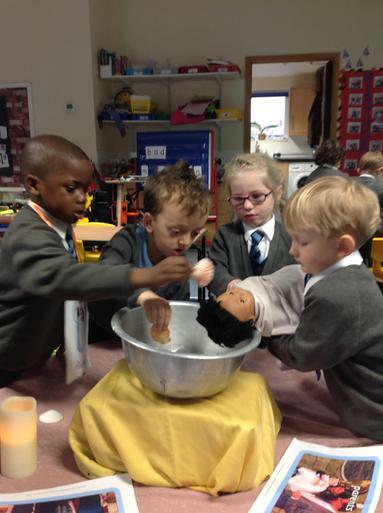 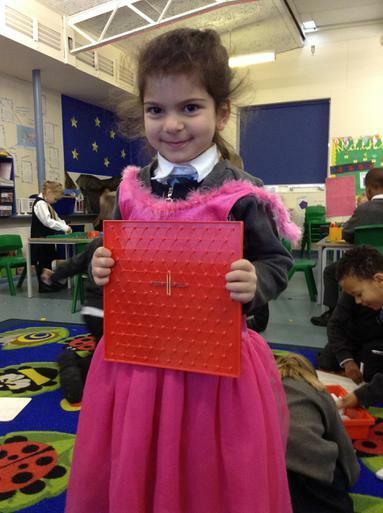 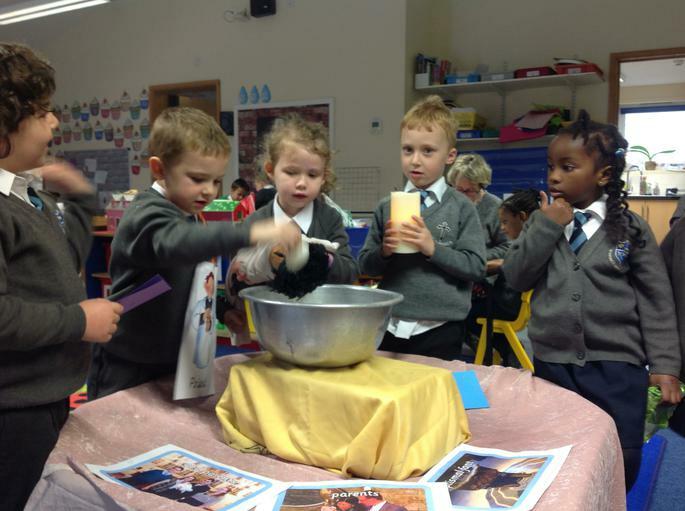 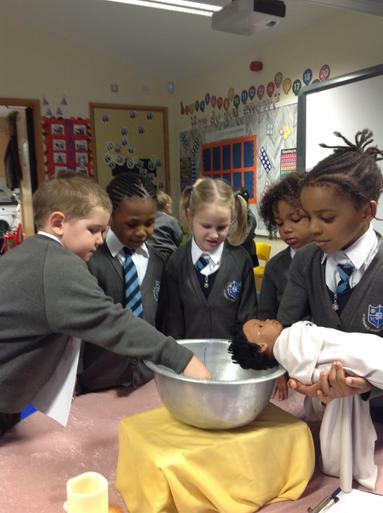 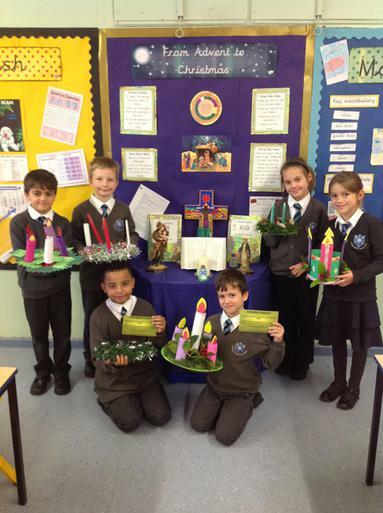 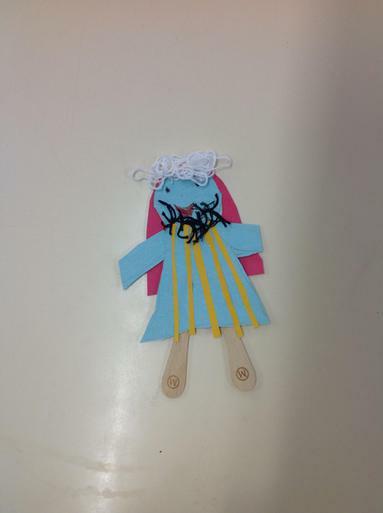 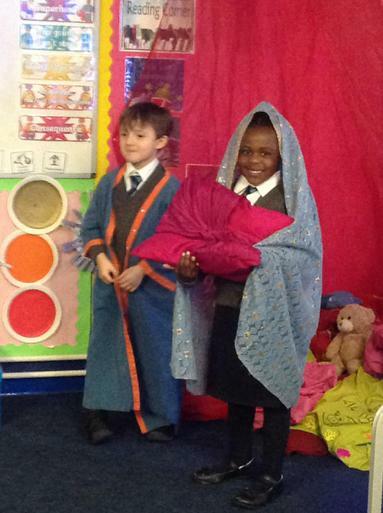 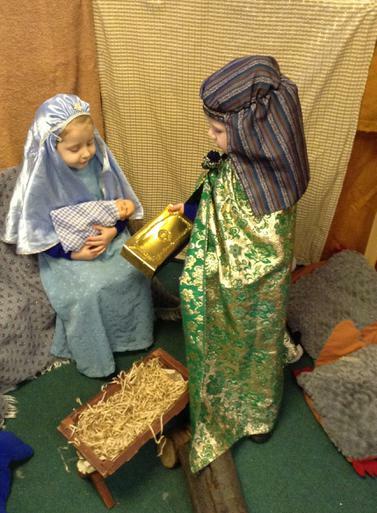 Reception have been learning that Advent is a time to prepare for the birth of the baby Jesus. 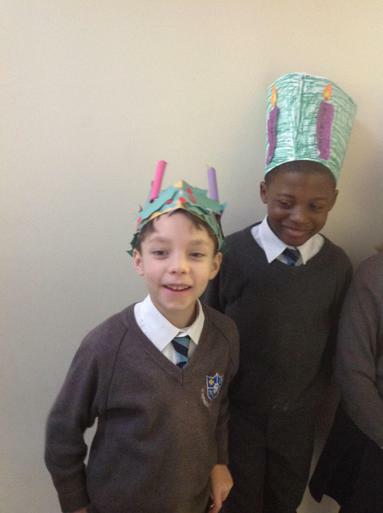 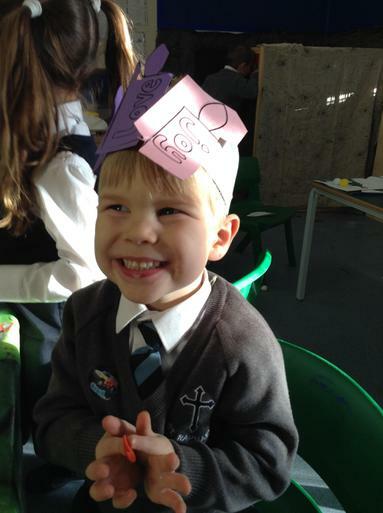 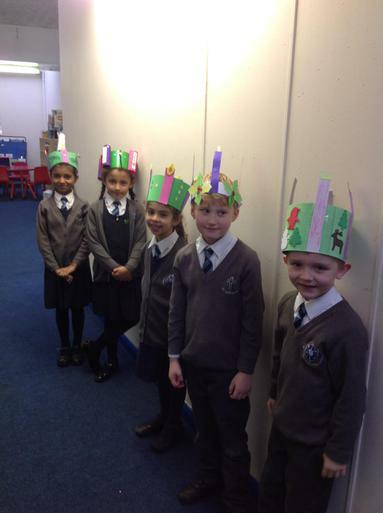 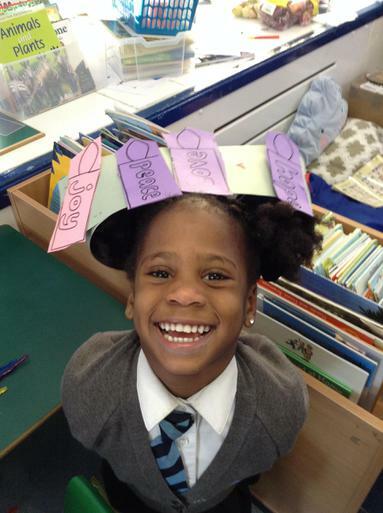 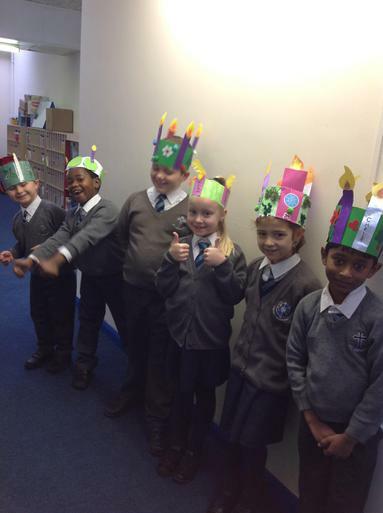 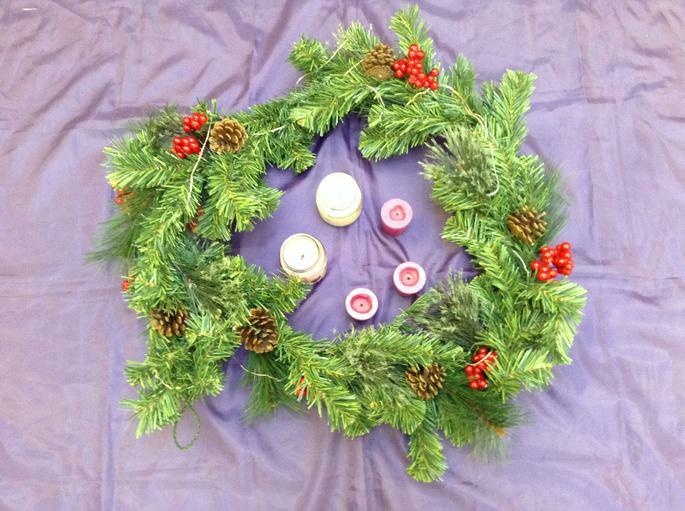 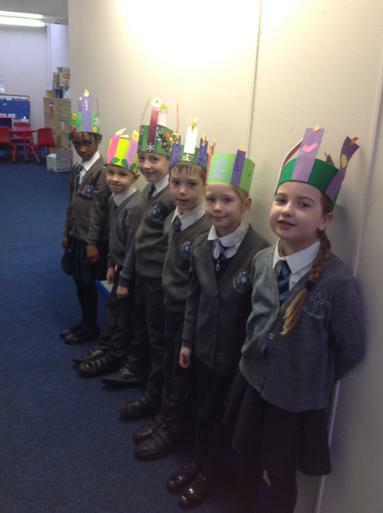 We made Advent Wreath crowns to celebrate the beginning of Advent. 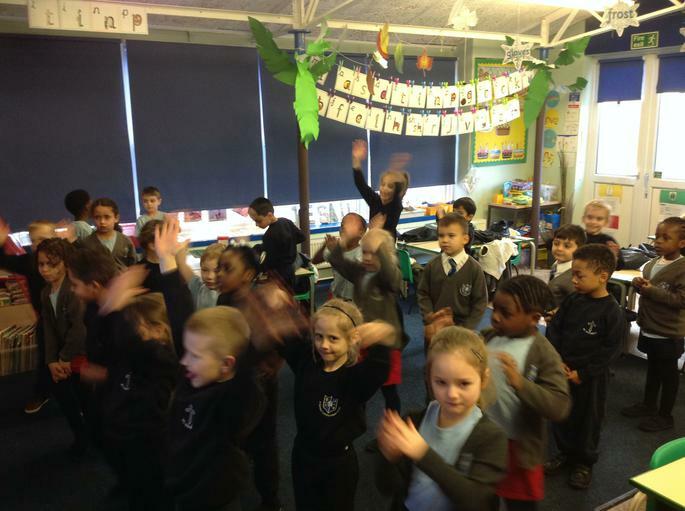 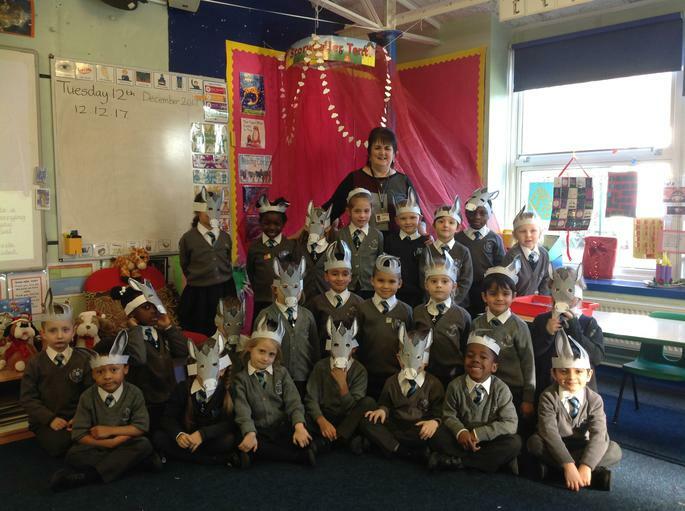 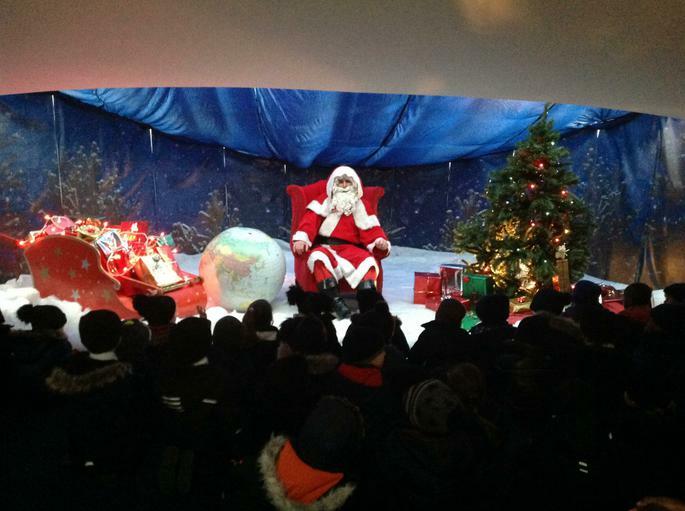 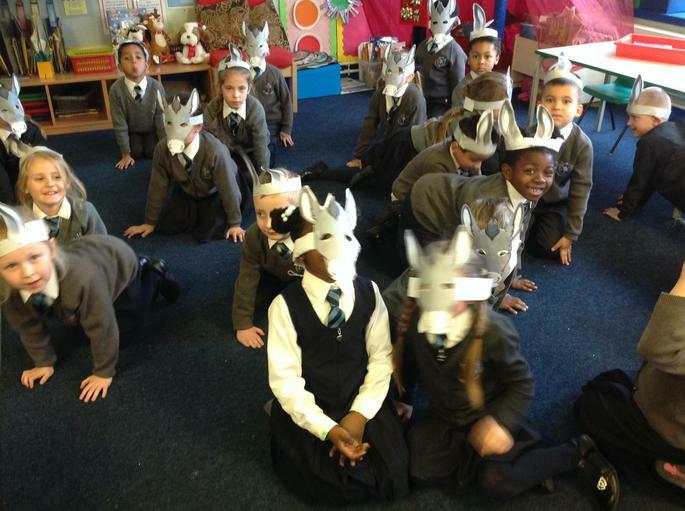 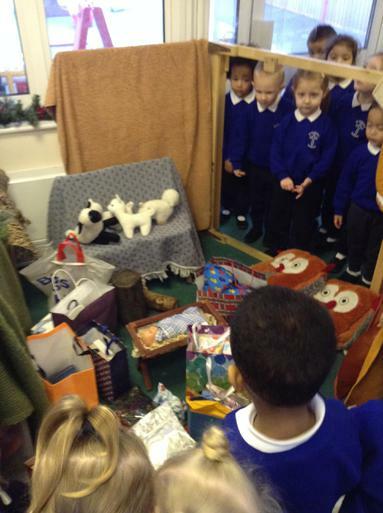 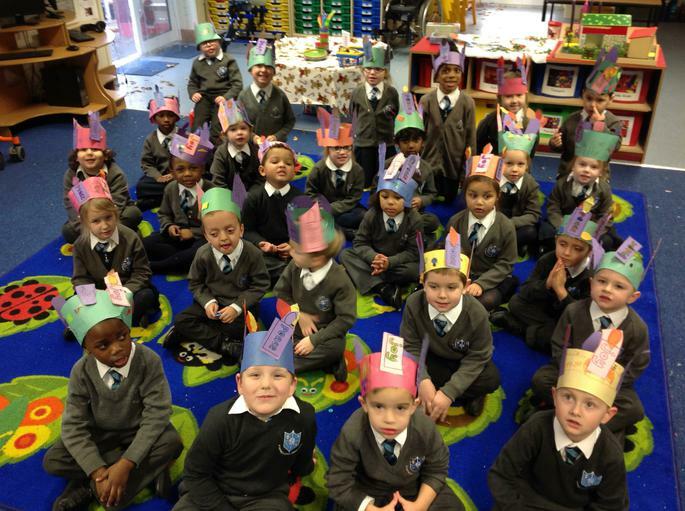 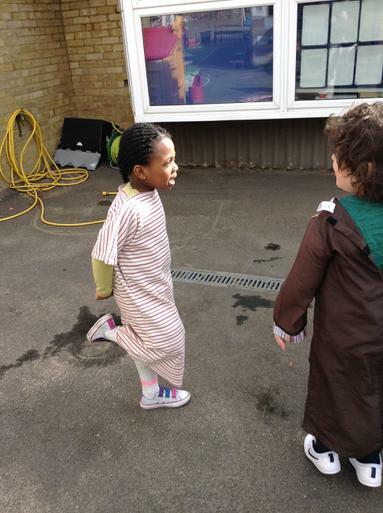 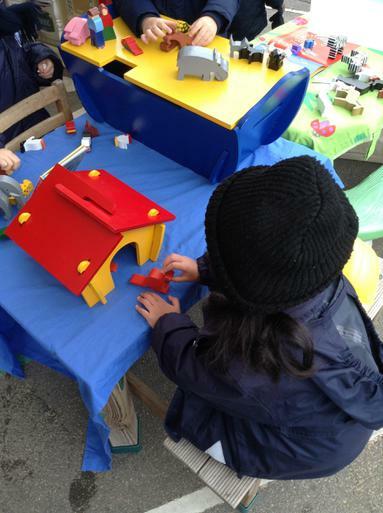 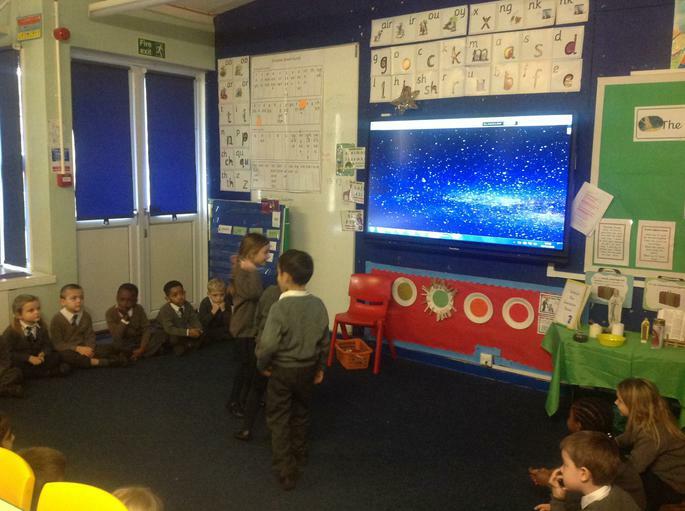 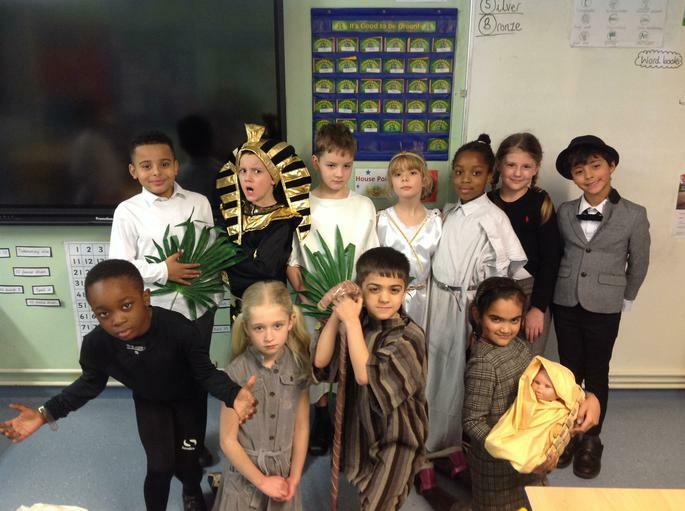 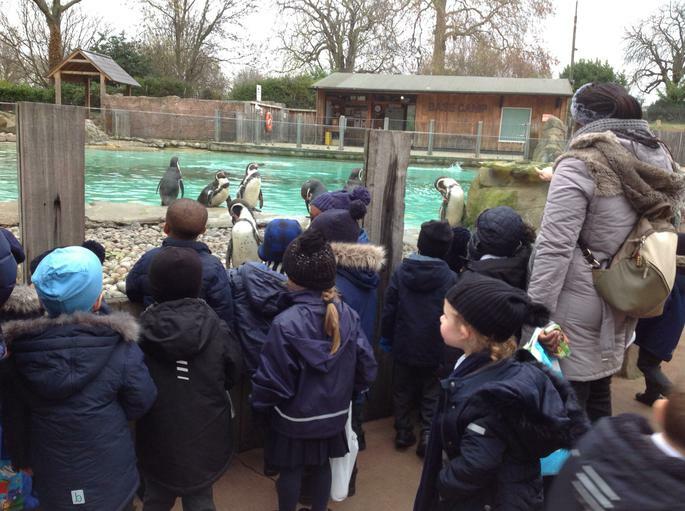 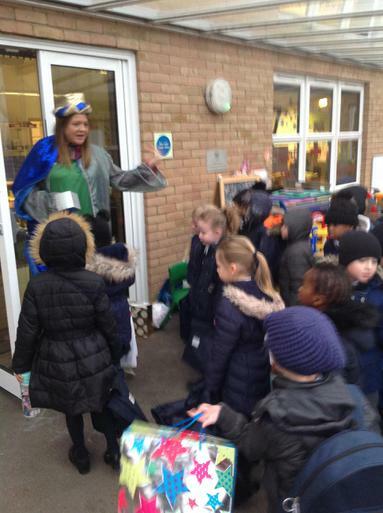 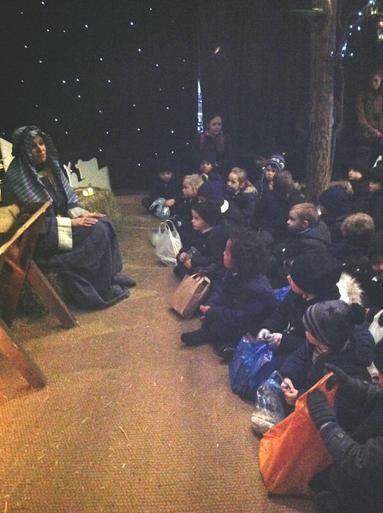 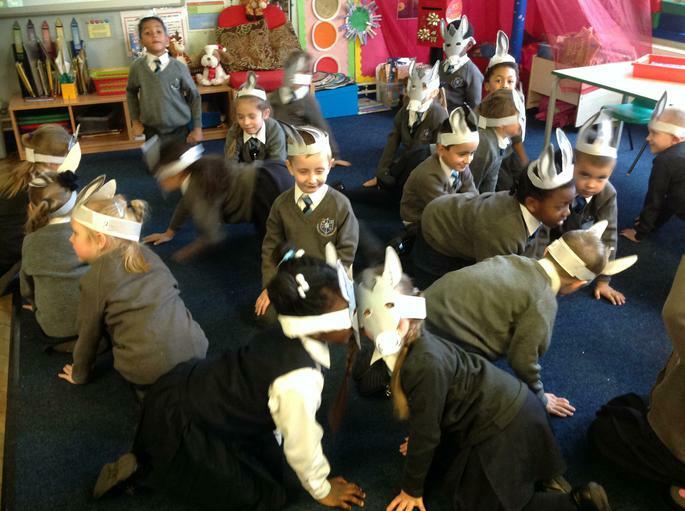 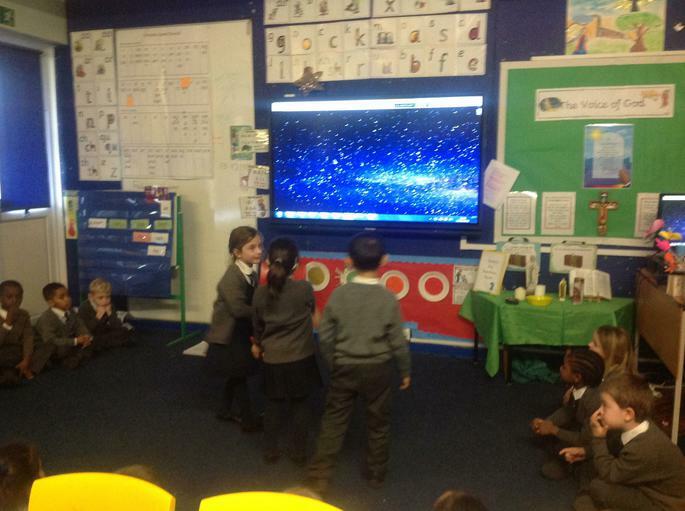 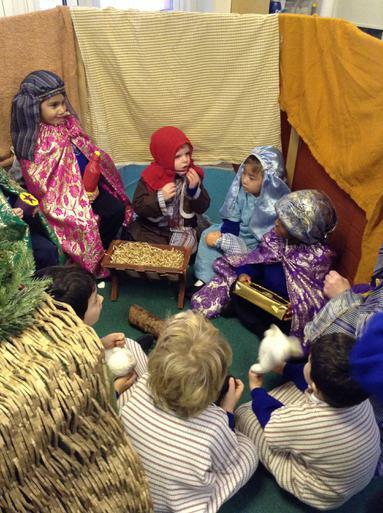 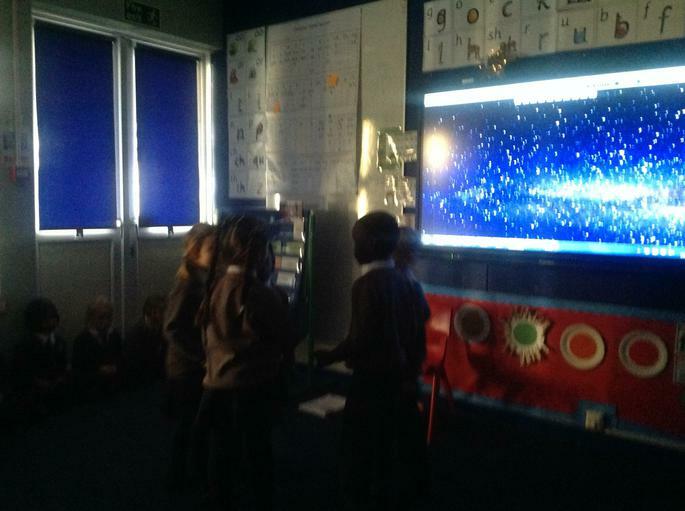 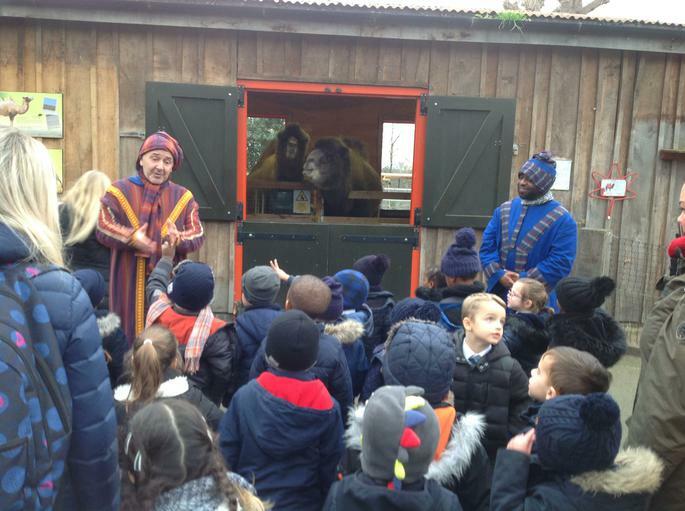 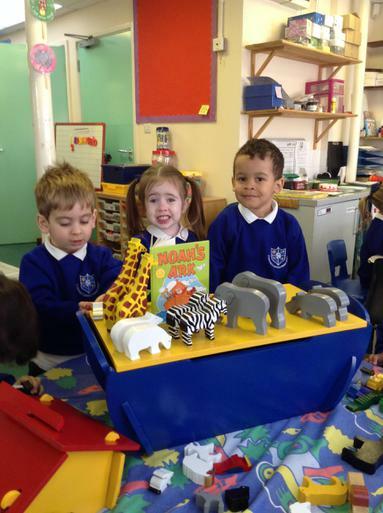 The Reception children took part in an exciting trip to see the Living Nativity at London Zoo! 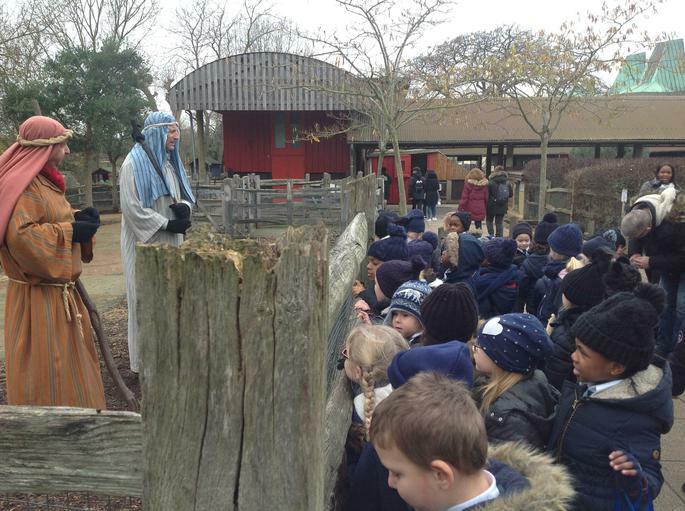 Not only did we spy some lions, tigers, monkeys, penguins and a whole host of exotic animals, we also took part in a trail to visit the baby Jesus and remind us of the true meaning of Christmas. 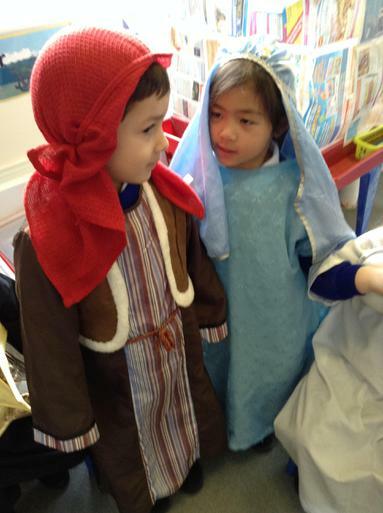 We met the wise men and their camels, went into the stable with Mary, and even saw the shepherds looking after their flock of sheep and goats. 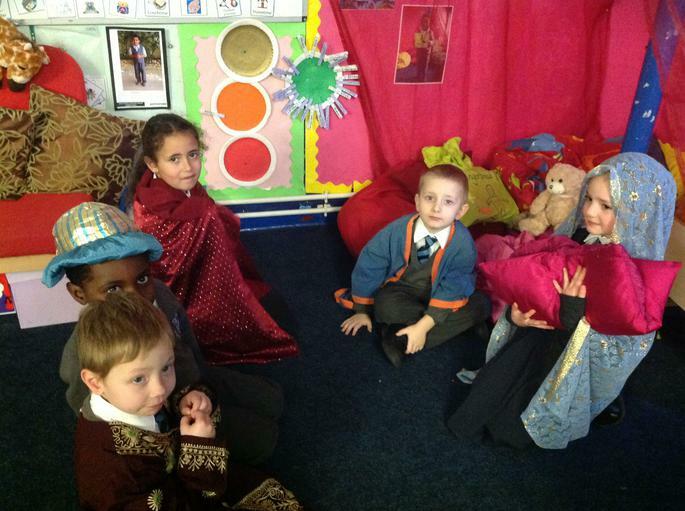 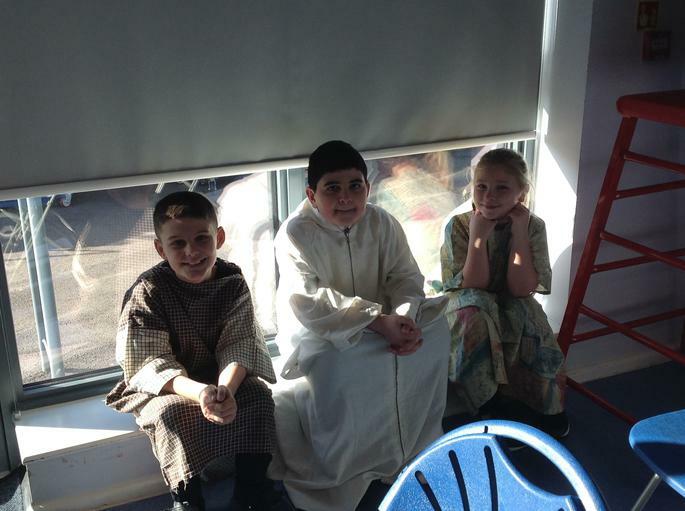 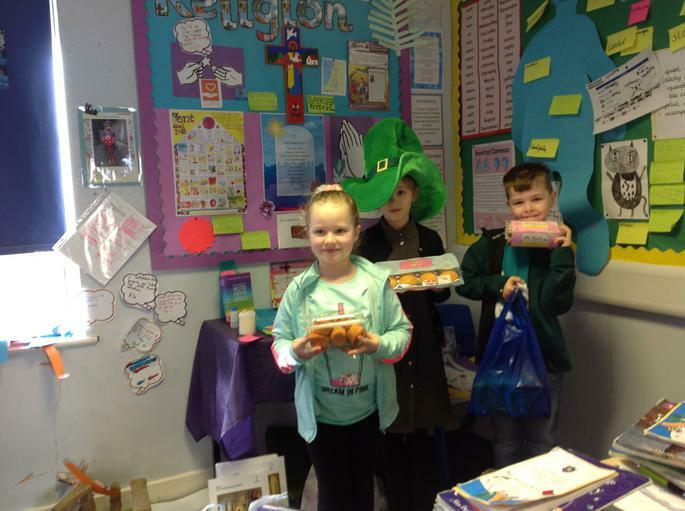 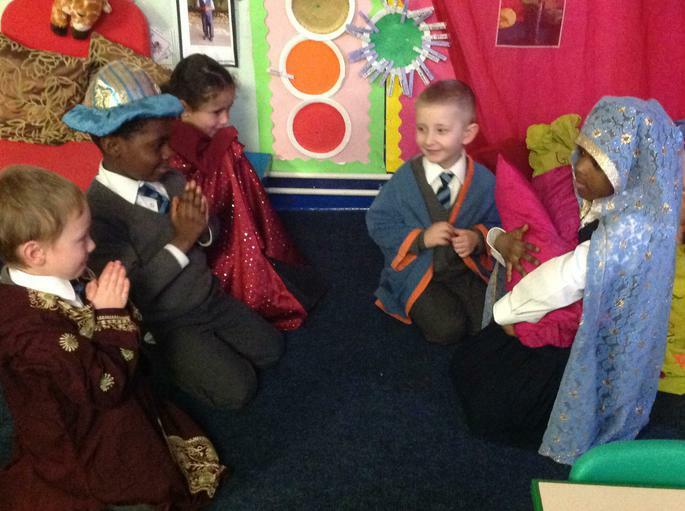 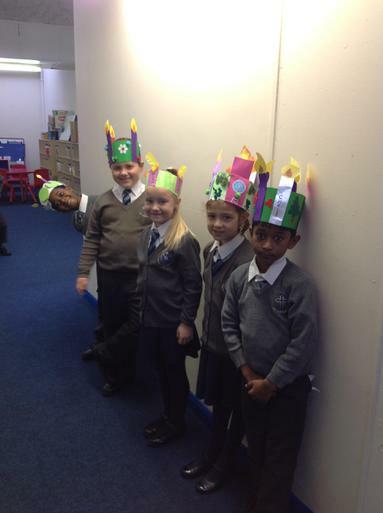 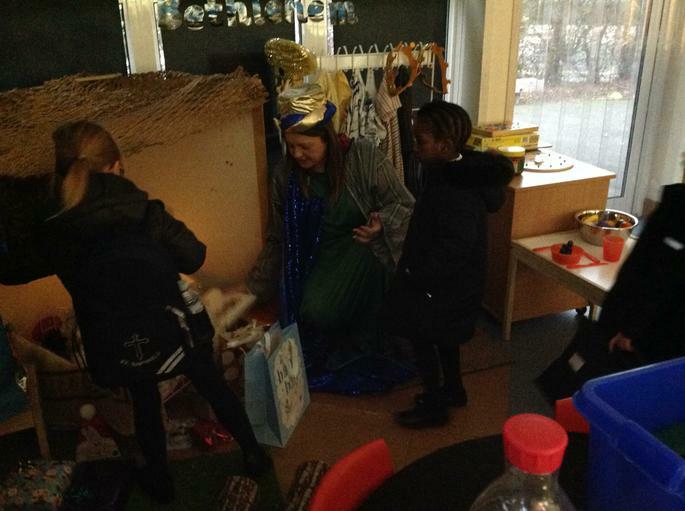 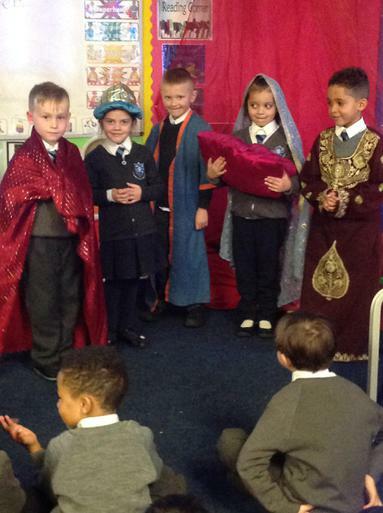 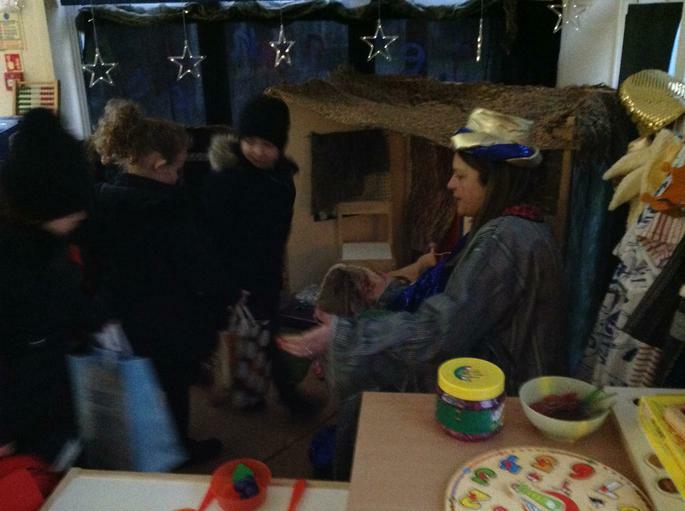 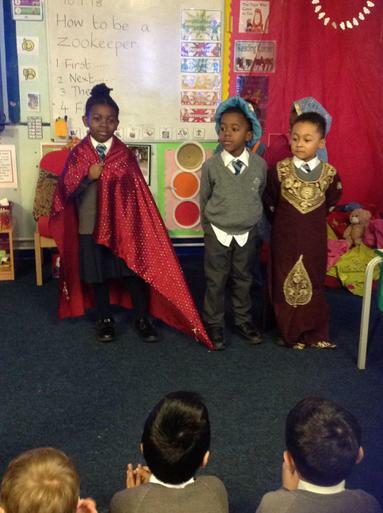 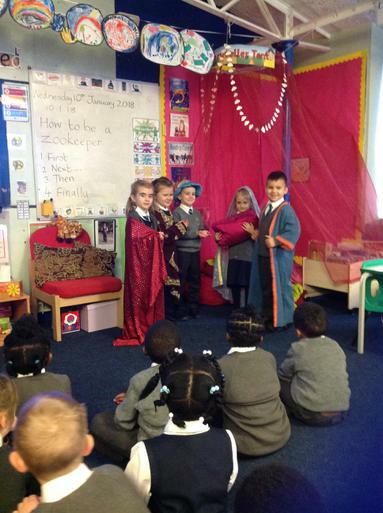 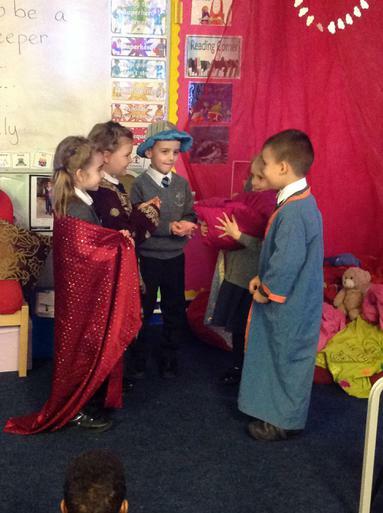 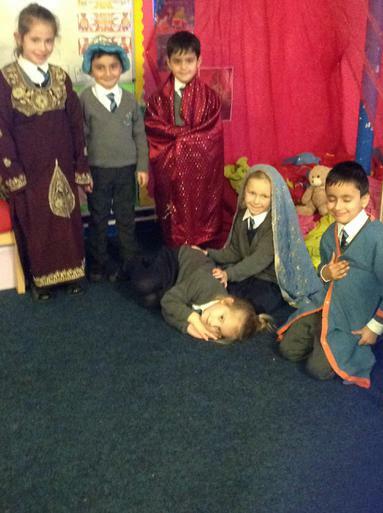 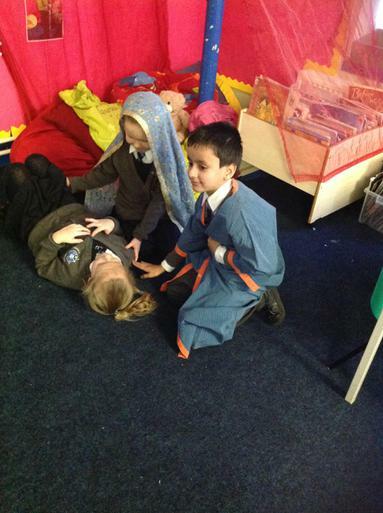 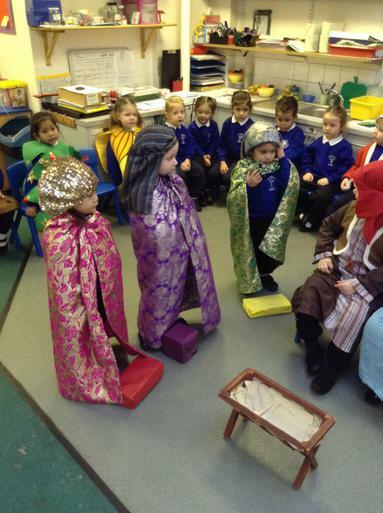 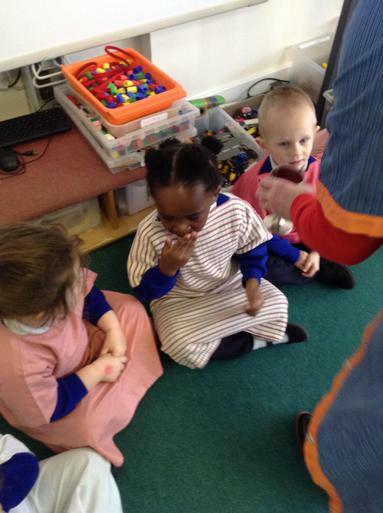 This week the Reception children had a visit from three Magi! 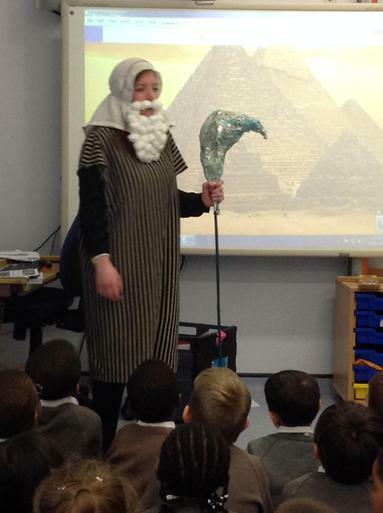 They learnt all about their journey from the East and the very special person they came to visit. 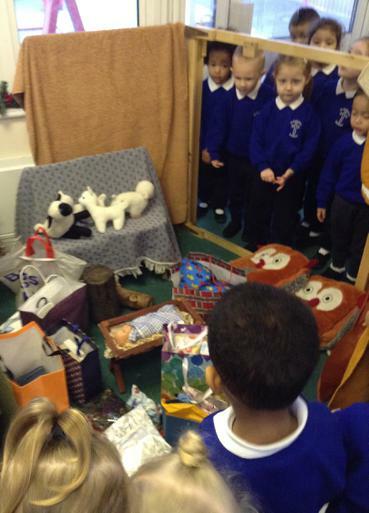 The children even brought in gifts for the baby Jesus, which were then given to the charity Caritas. 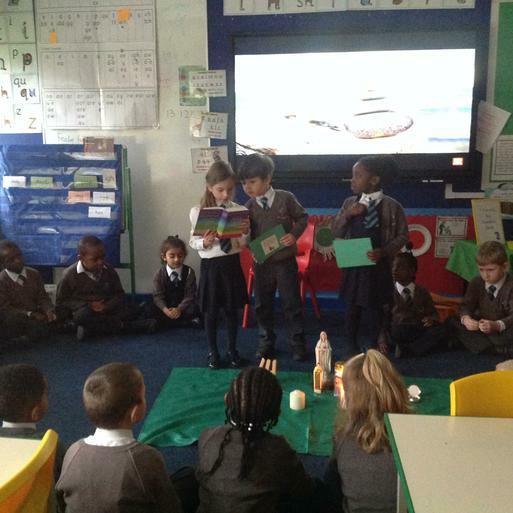 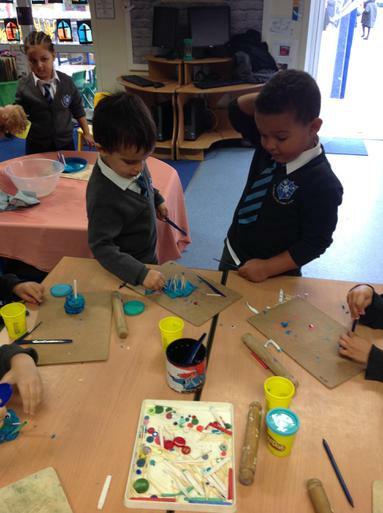 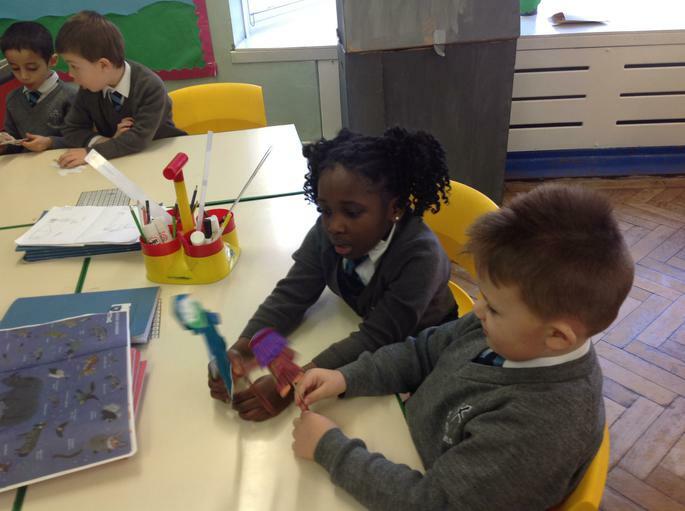 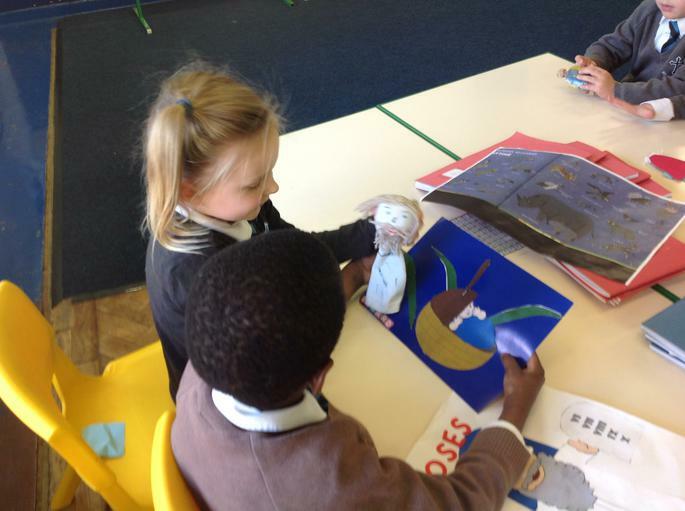 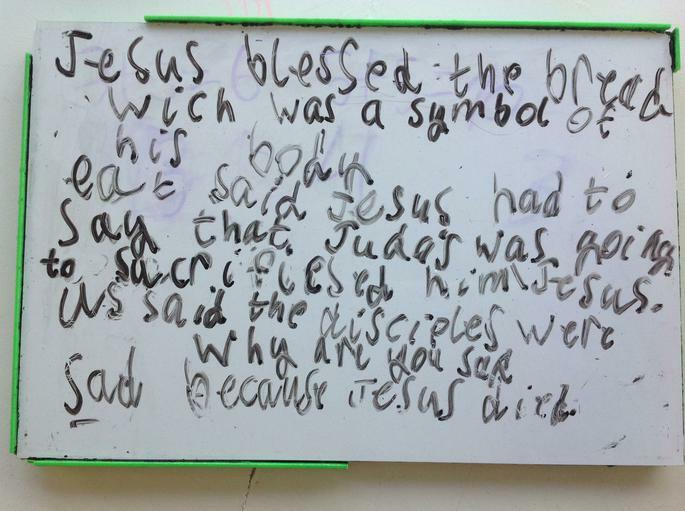 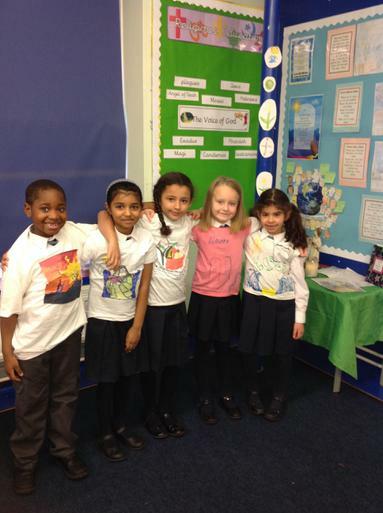 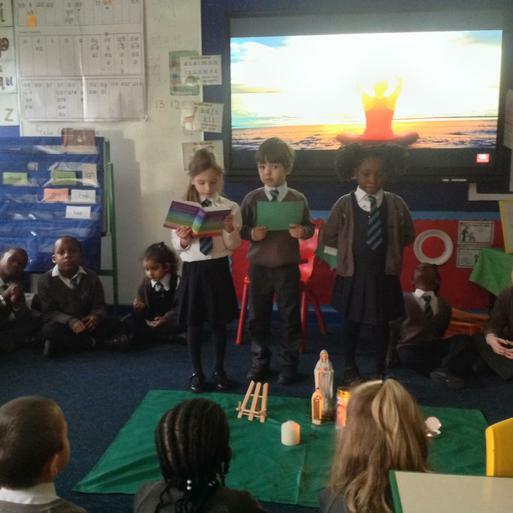 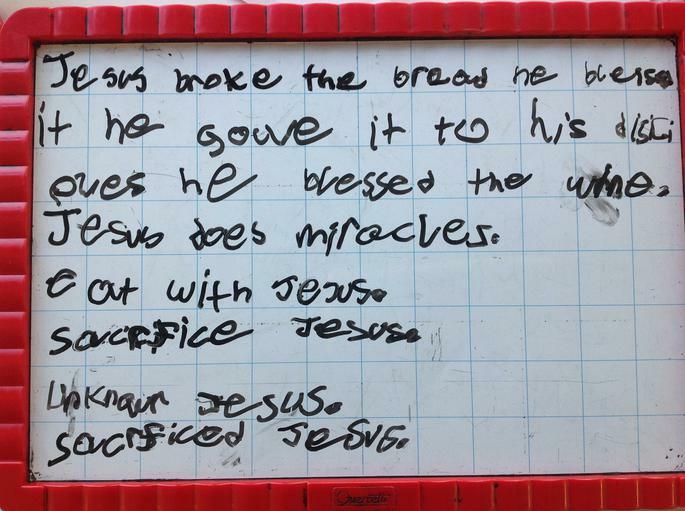 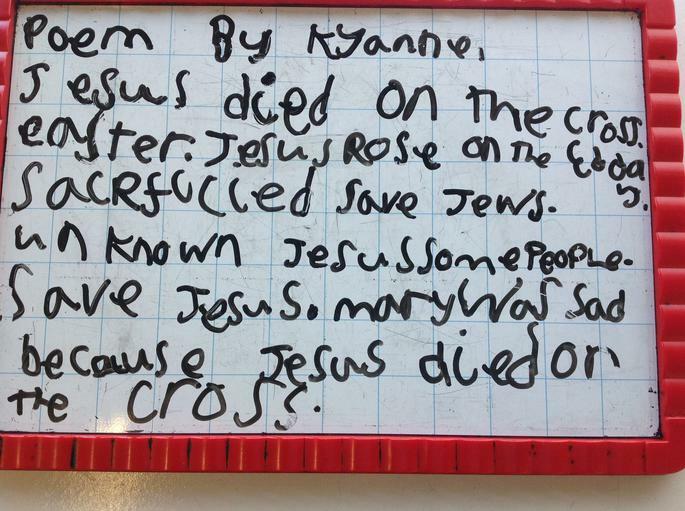 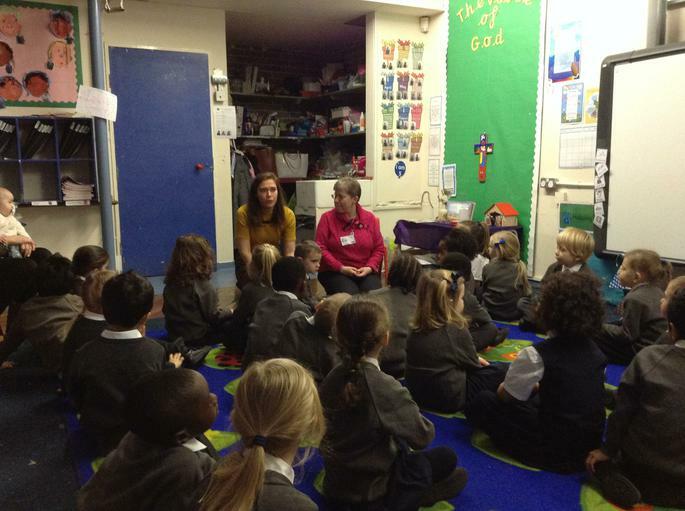 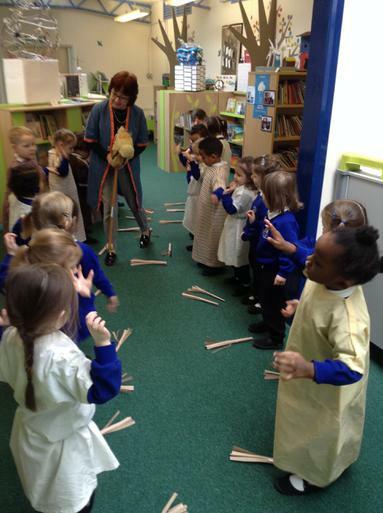 In the spring term, Reception learned the story of Holy Week. 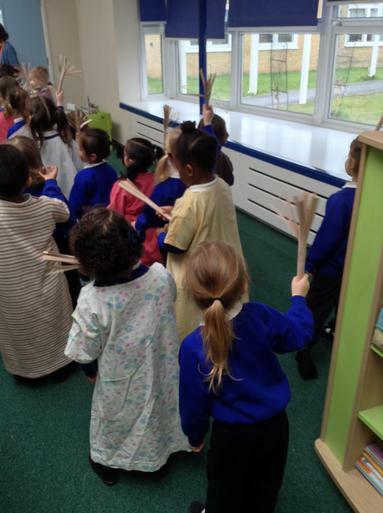 We had our own Palm Sunday procession, we ate a Last Supper with bread and 'wine', and then we retold the story of Jesus' resurrection. 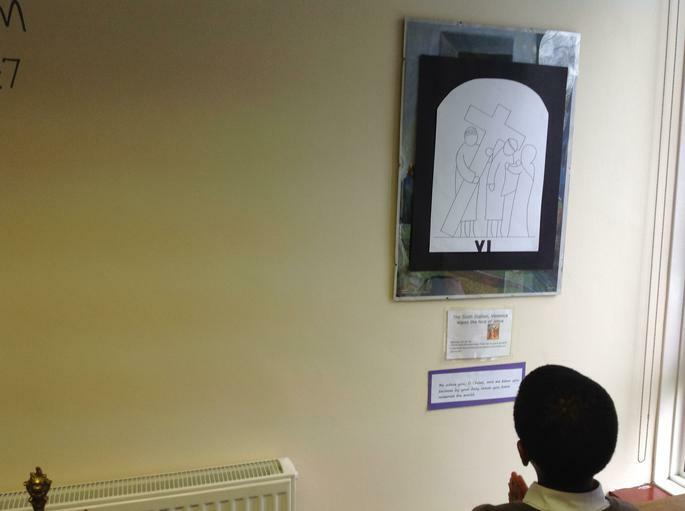 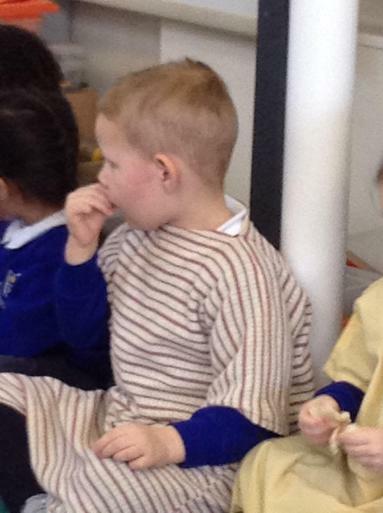 In Reception, we having been learning about Jesus and his disciples on the 'Road to Emmaus' and 'The Ascension ' stories. 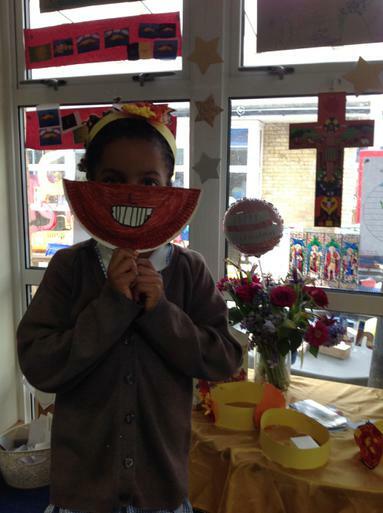 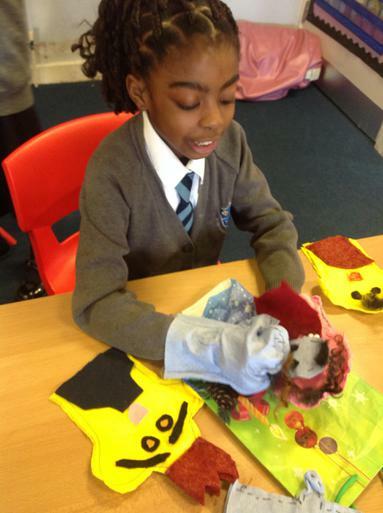 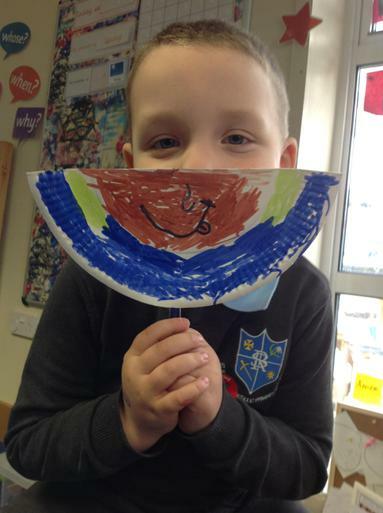 We made masks to show how the disciples felt after hearing such 'Good News'. 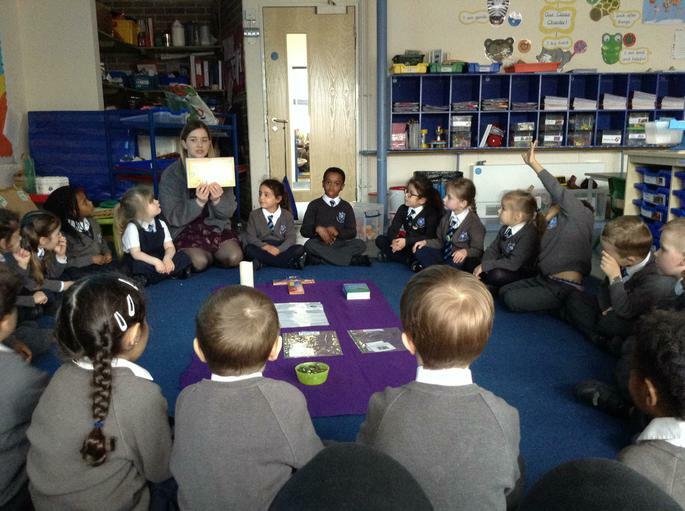 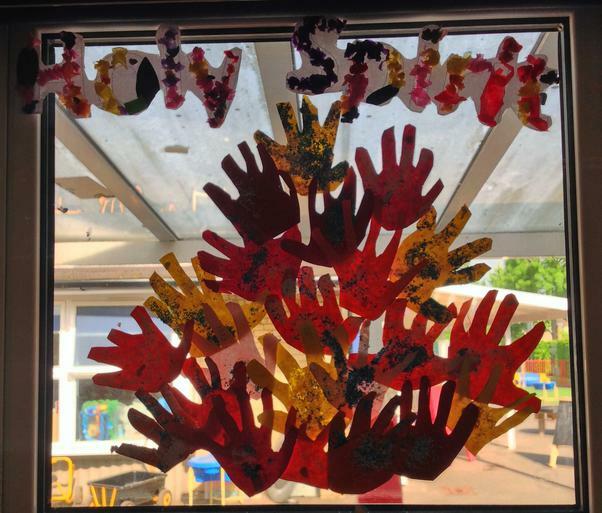 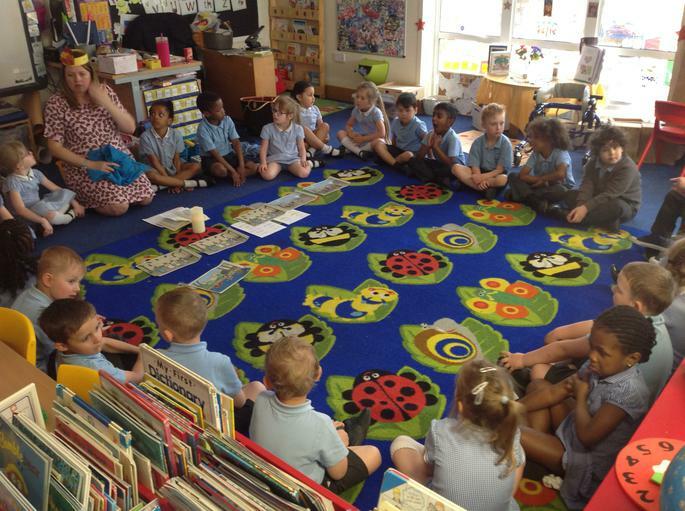 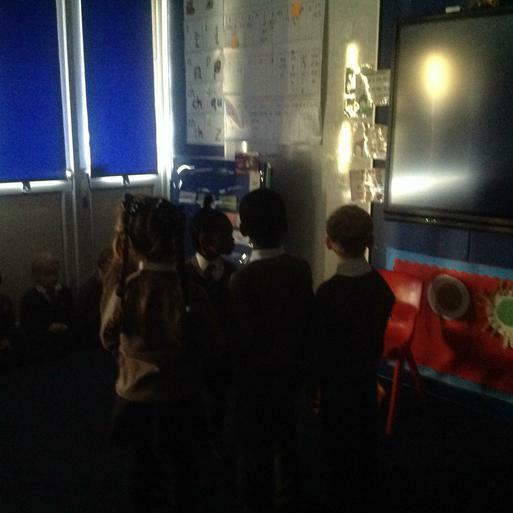 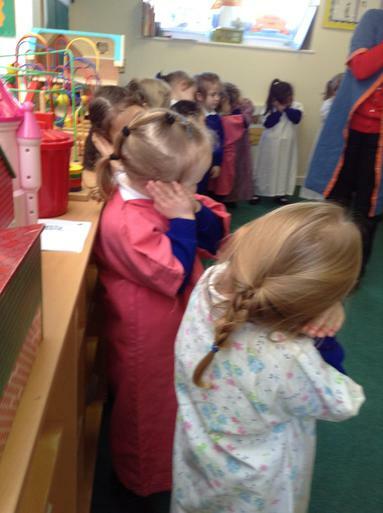 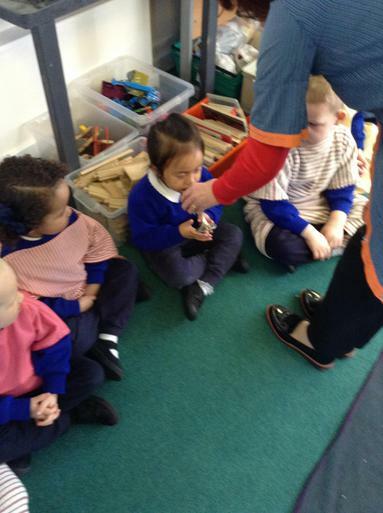 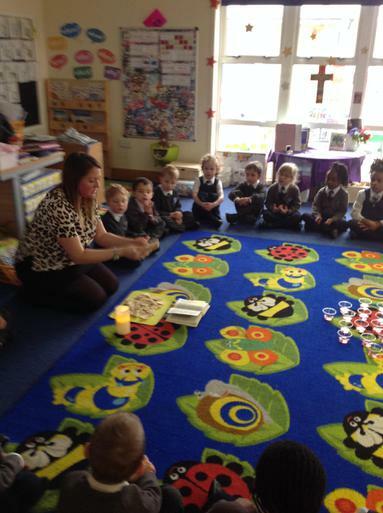 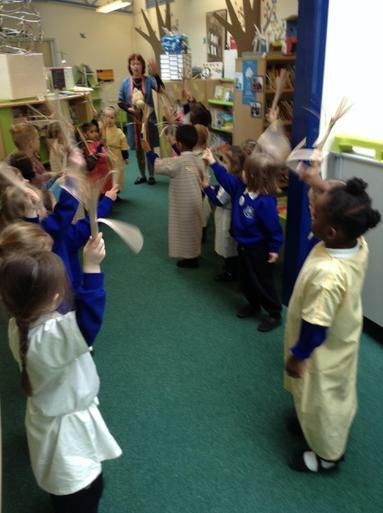 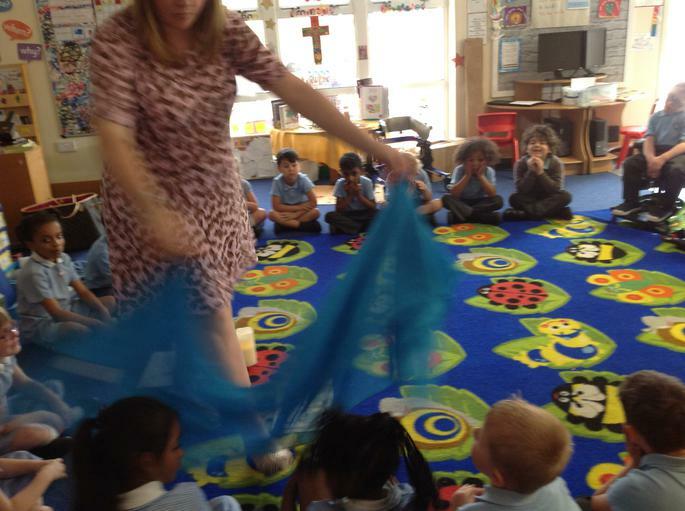 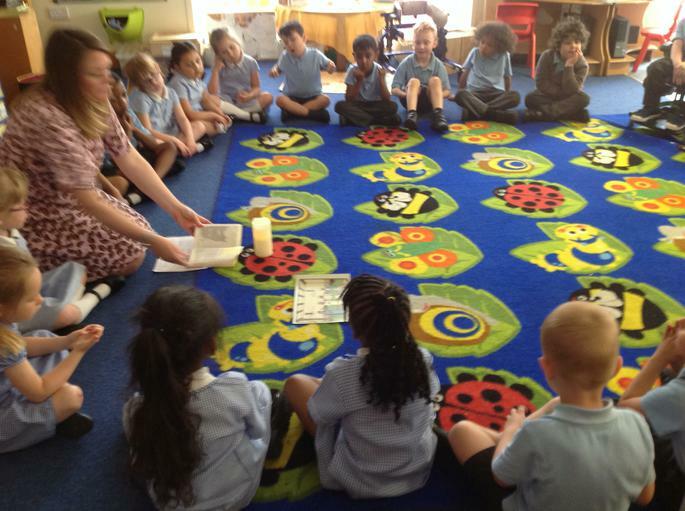 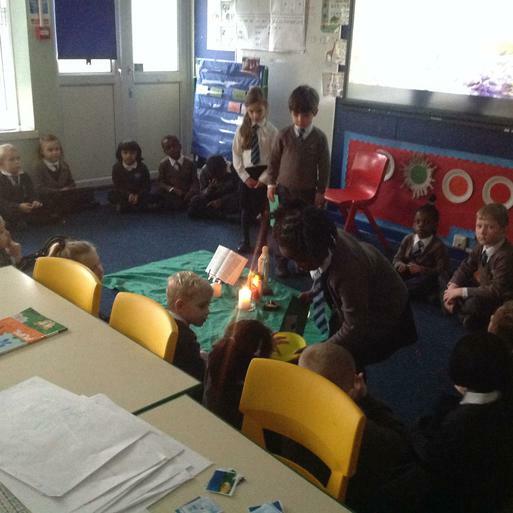 In Reception, we have been hearing the story of Pentecost. 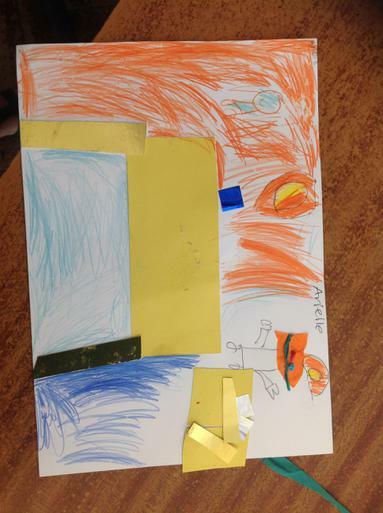 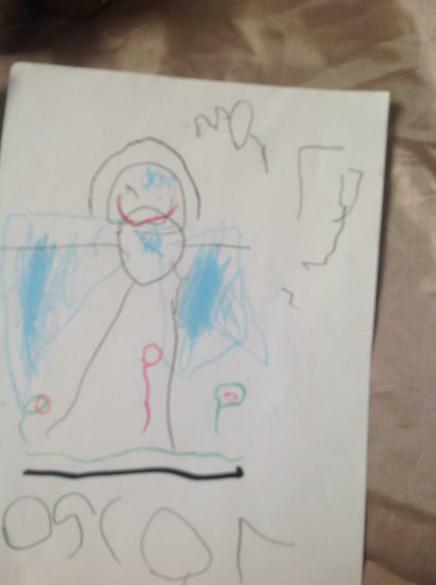 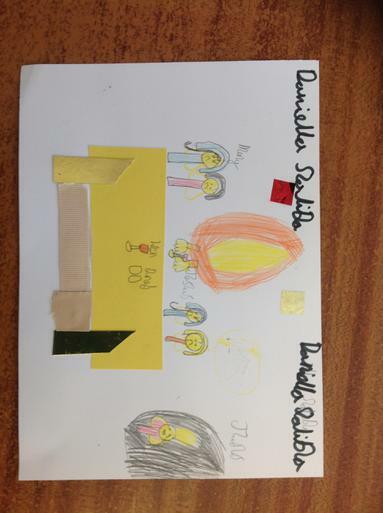 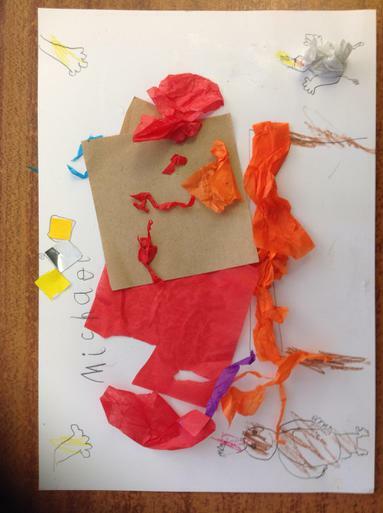 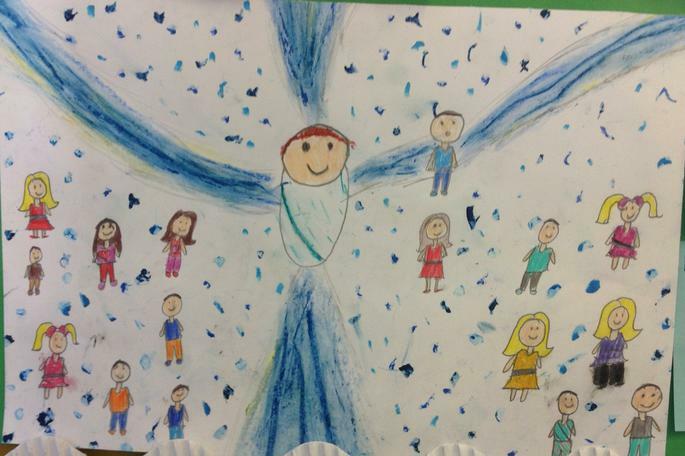 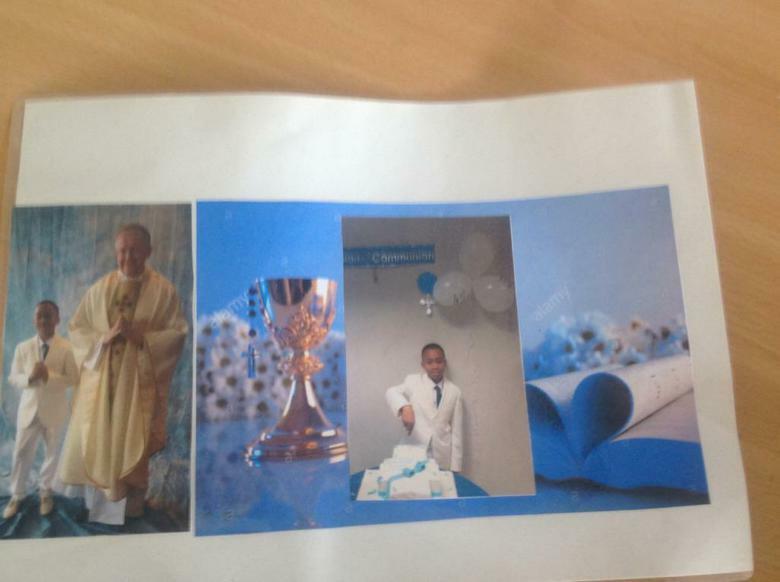 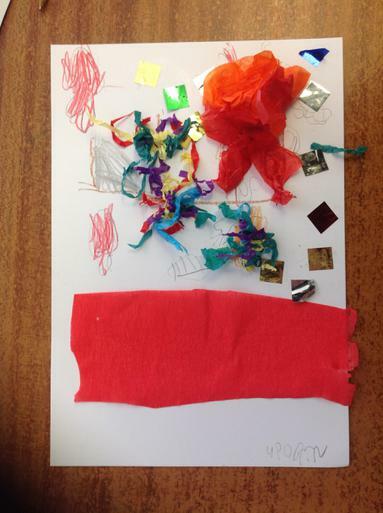 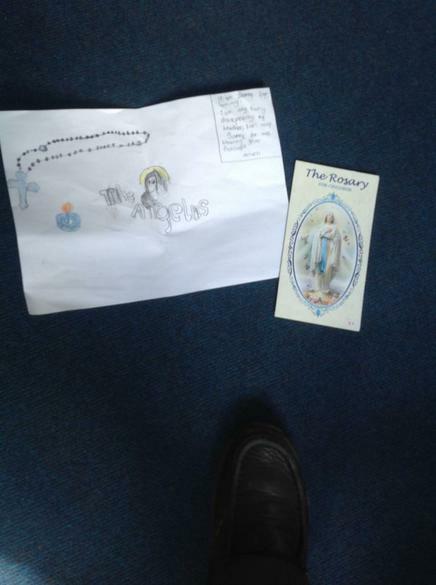 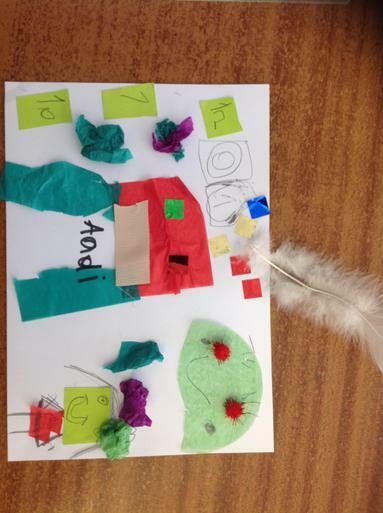 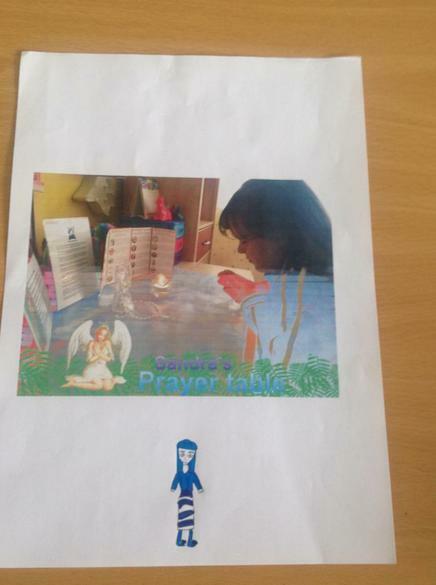 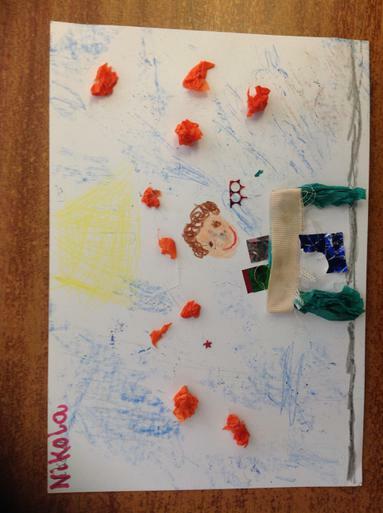 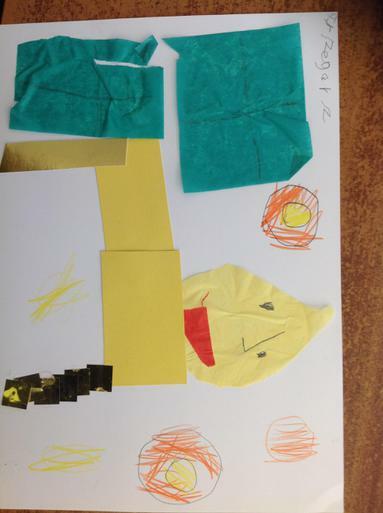 We have made birthday cards for the church and made our own representations of the Holy Spirit. 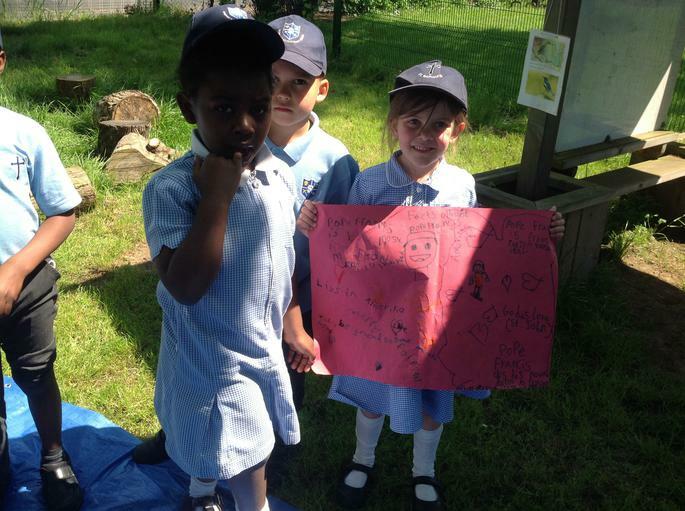 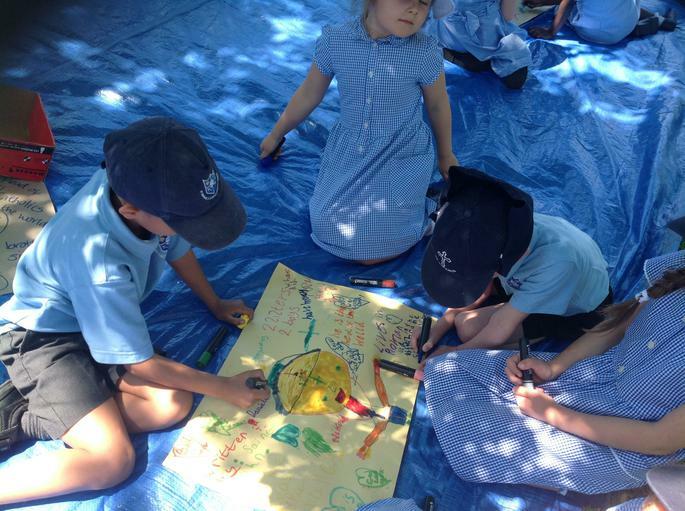 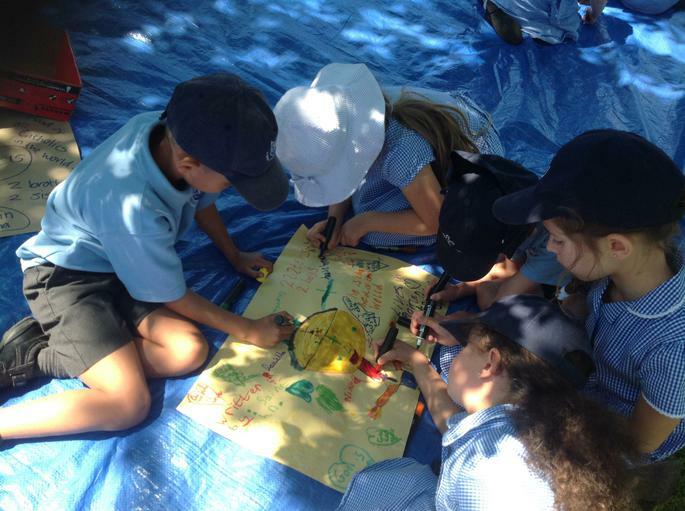 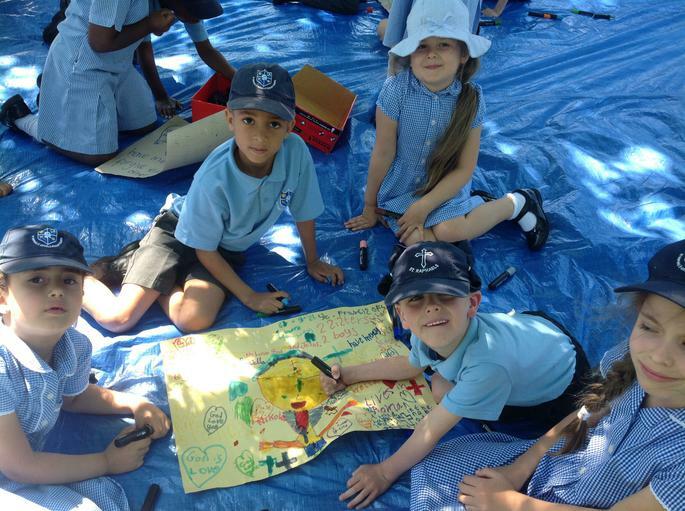 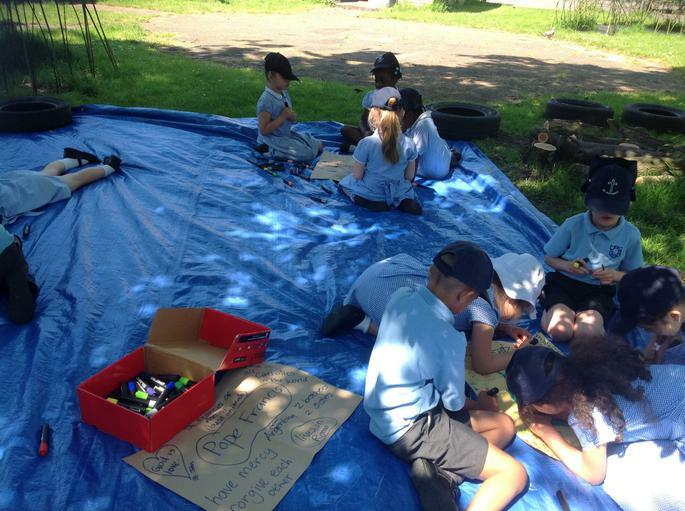 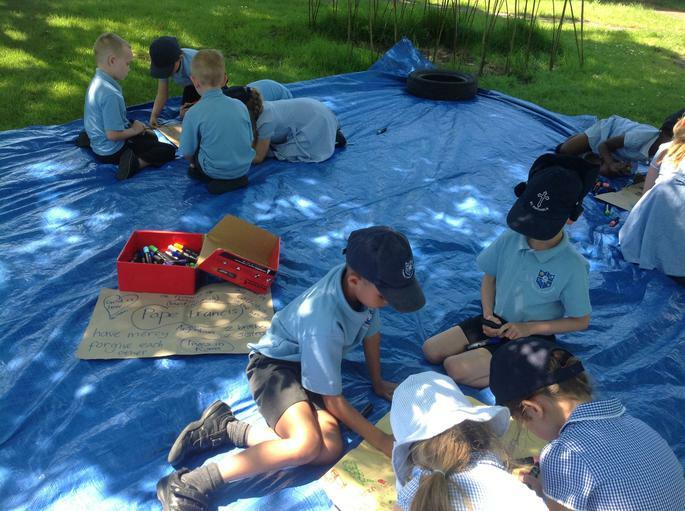 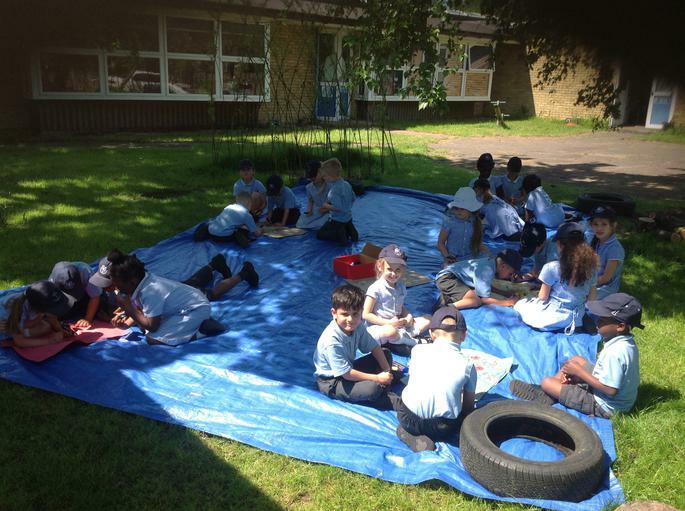 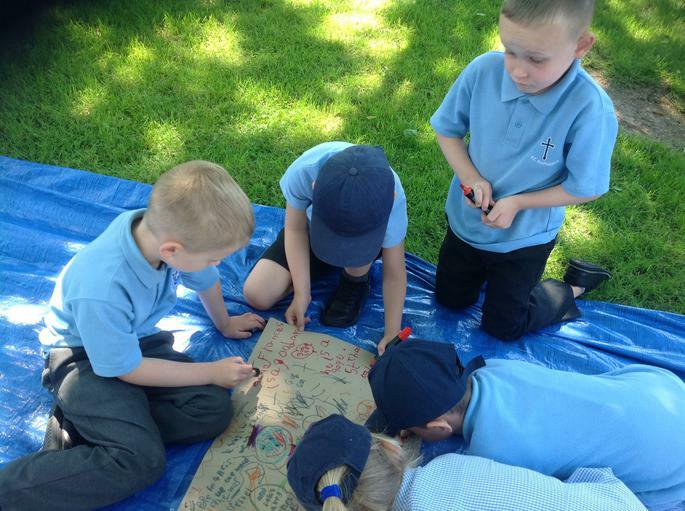 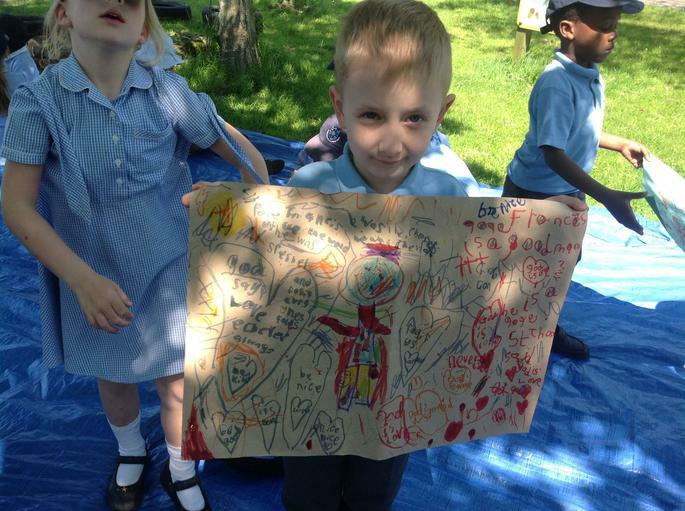 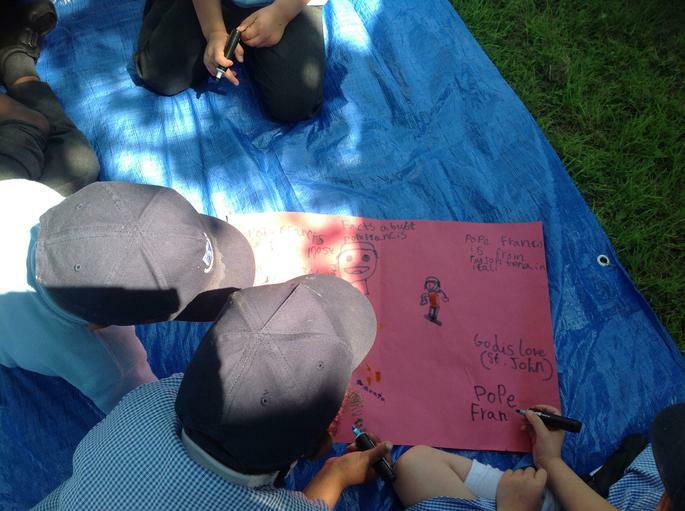 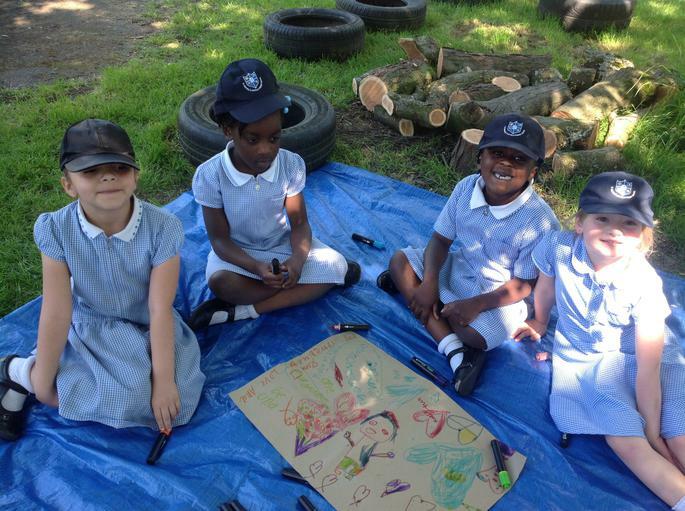 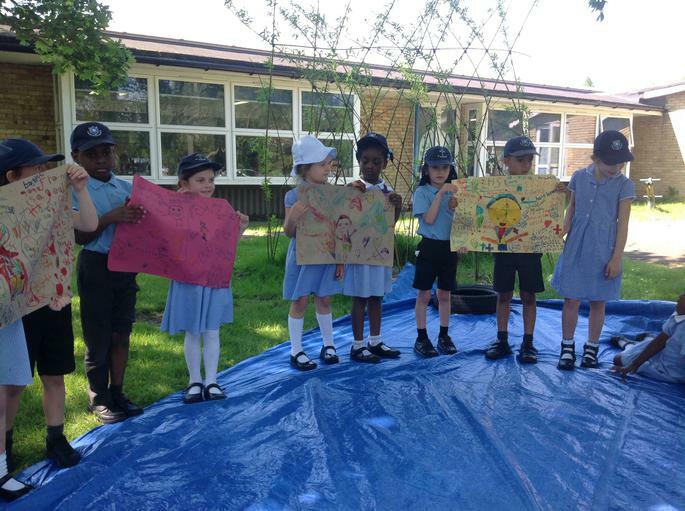 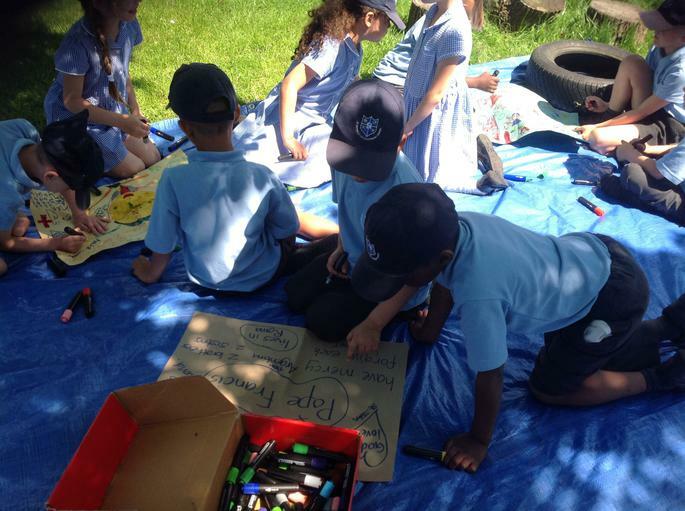 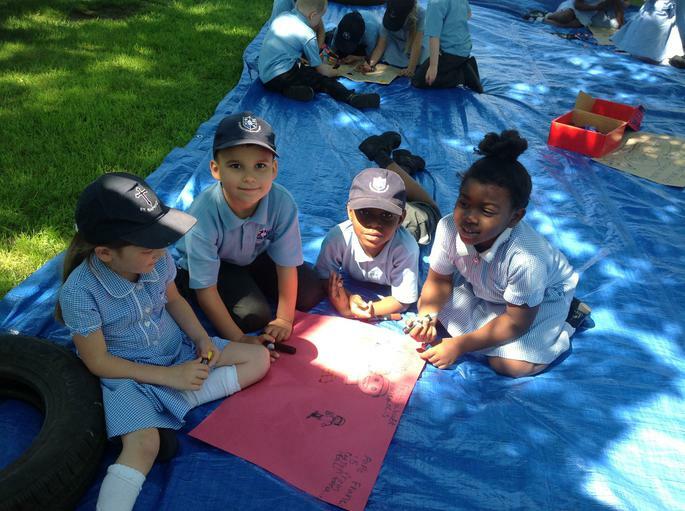 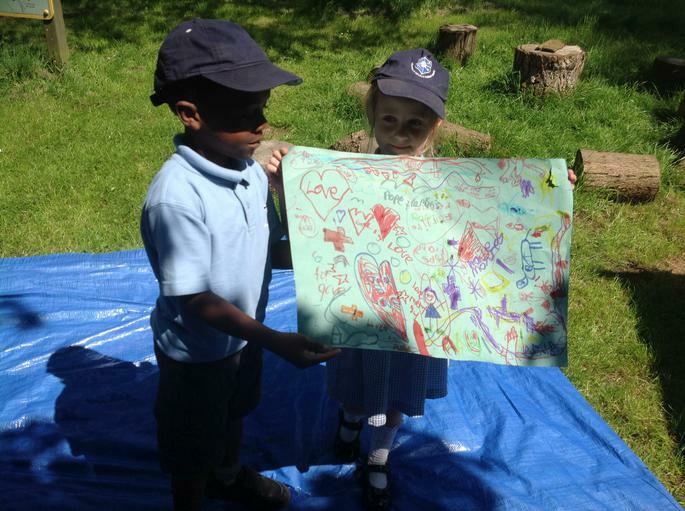 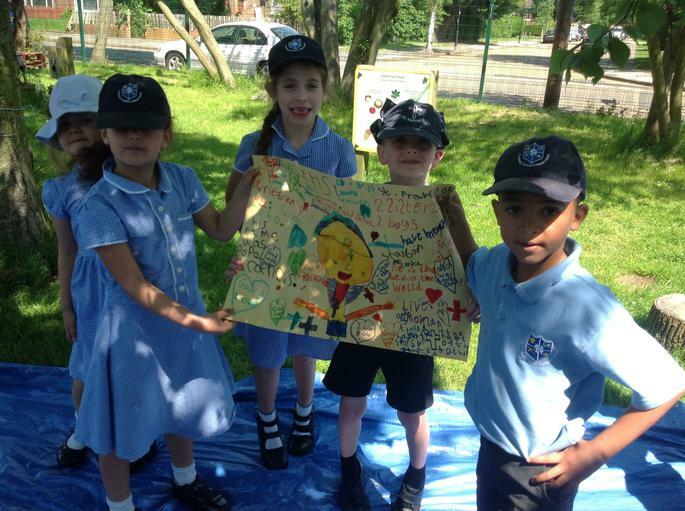 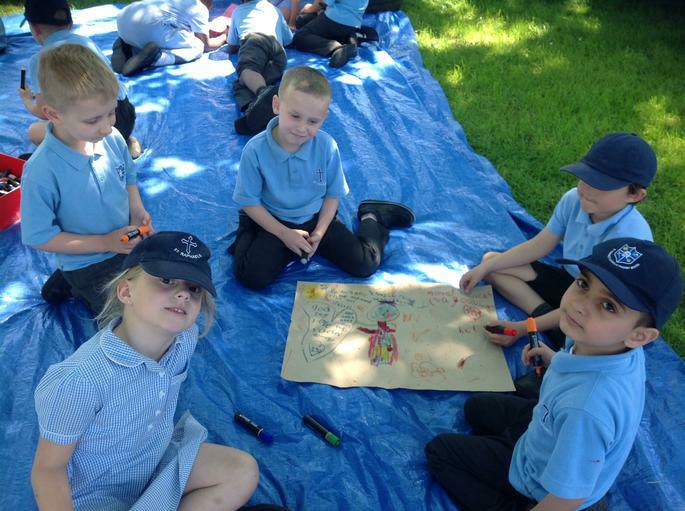 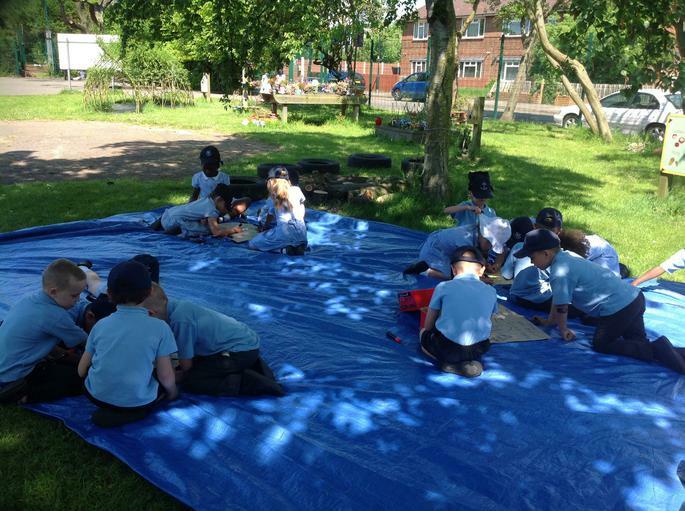 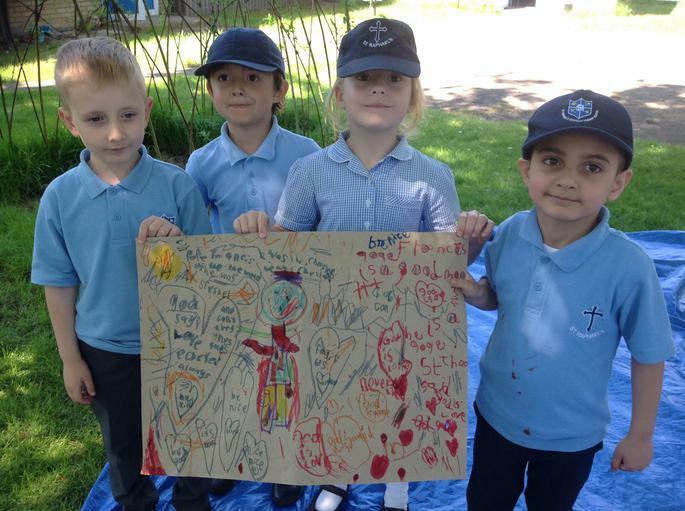 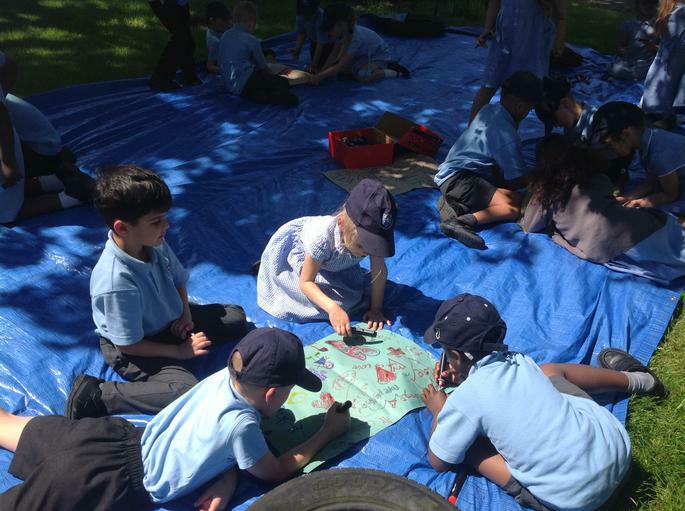 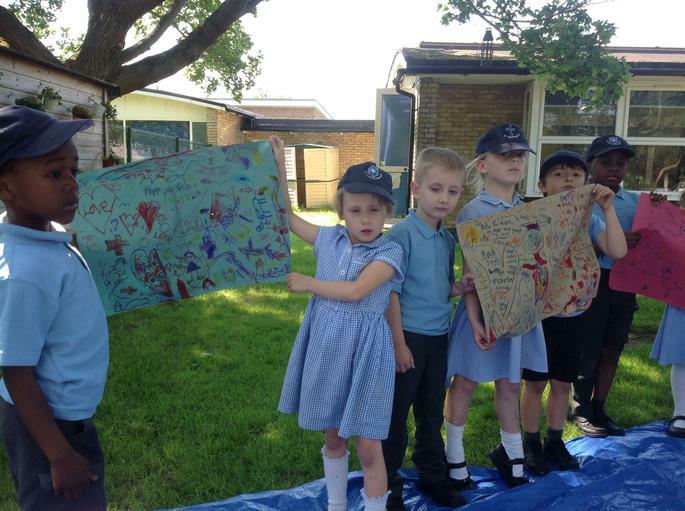 1 Esau enjoyed the sunshine in the Forest School garden as they worked with their groups to produce detailed fact file posters about Pope Francis. 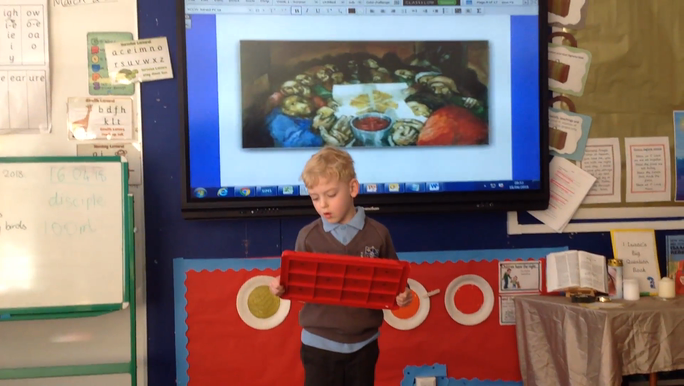 Adam interpreting the painting through a song. 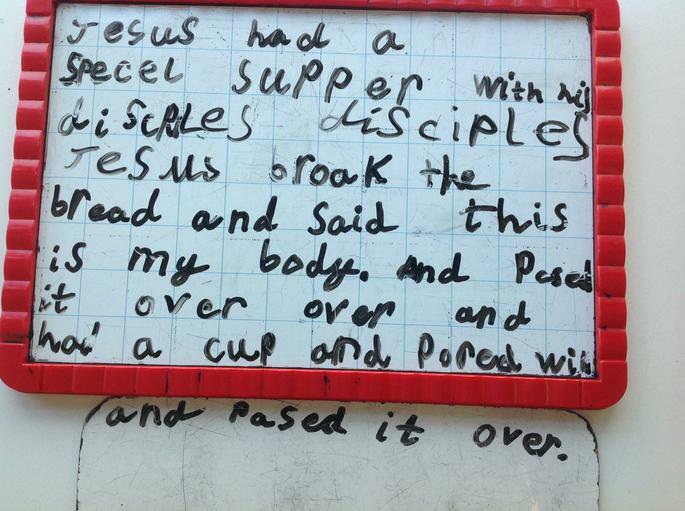 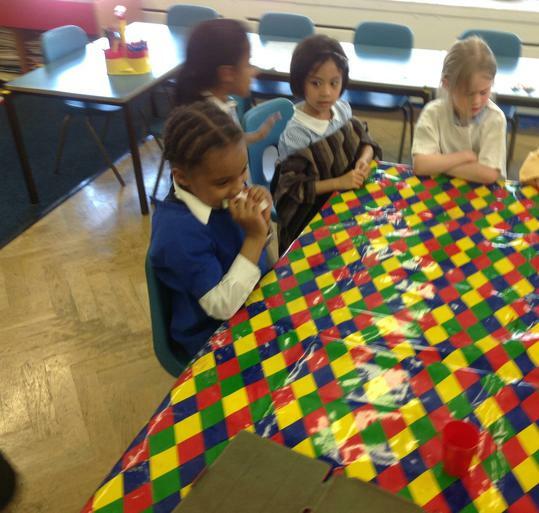 Year 1's Interpretation of the Last Supper. 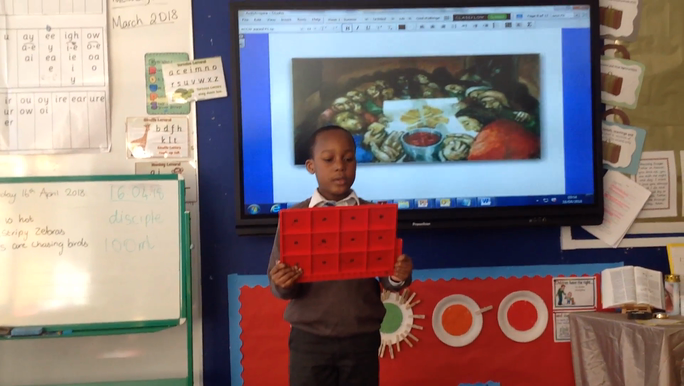 Raphael interpreted this painting through a song. 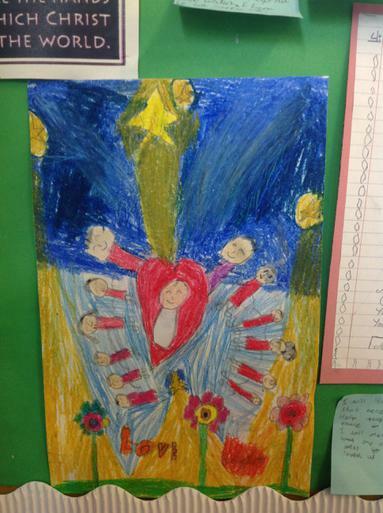 Lilly interpreted this painting through a song. 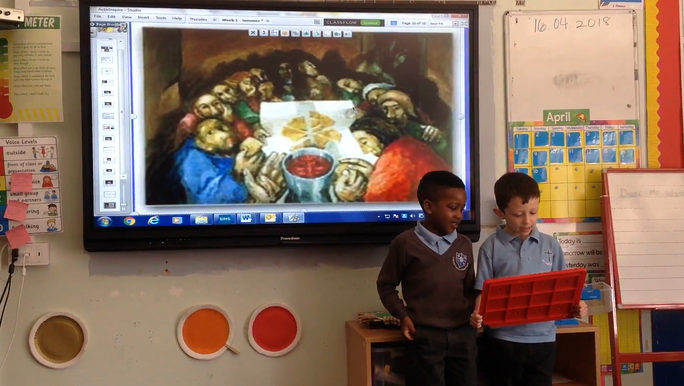 Jayron and Joe made a song about this painting of the Last Supper. 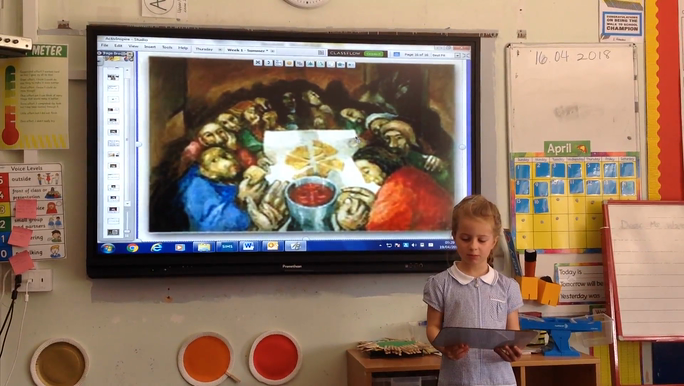 Beatrice has created a poem on this painting of the Last Supper. 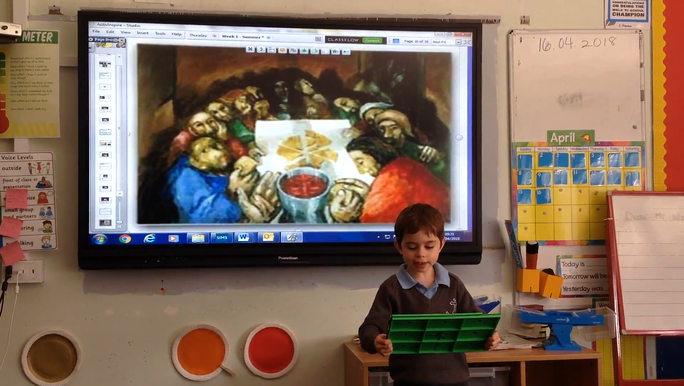 Roberto retells the story of the Last Supper. 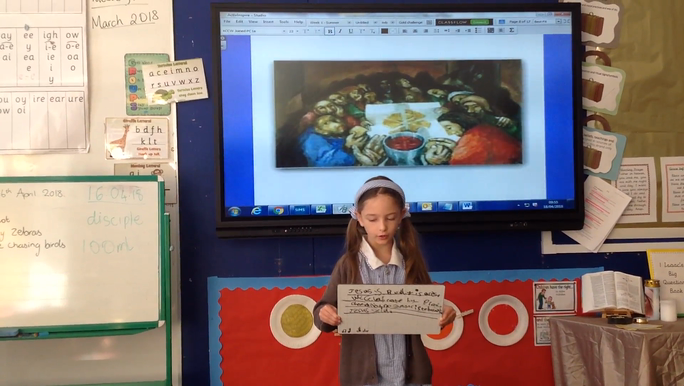 1 Esau investigated the painting of The Last Supper by Father Sieger Koder and made some interesting findings. 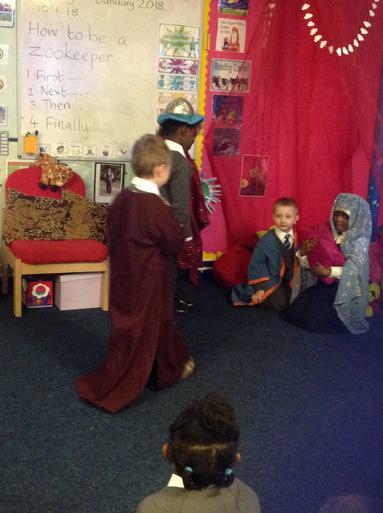 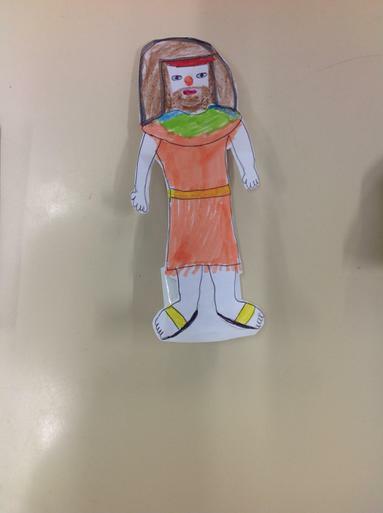 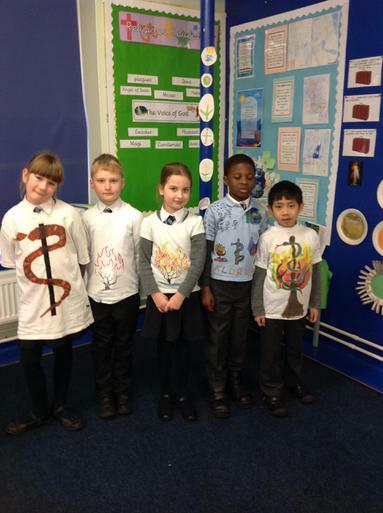 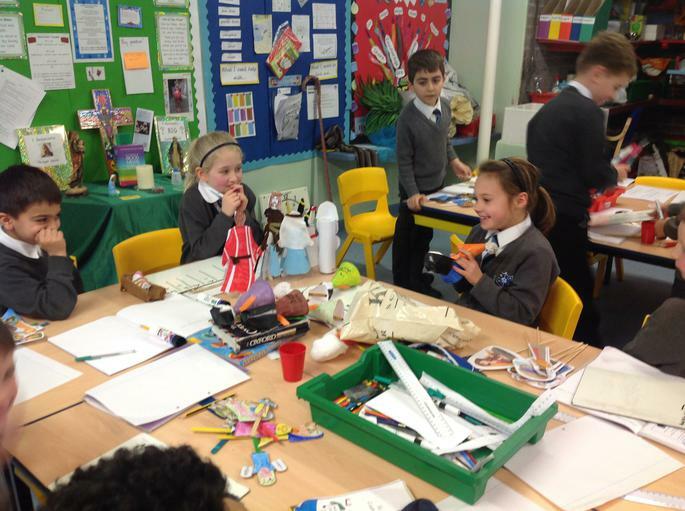 1 Esau represented Pentecost through their role play and art. 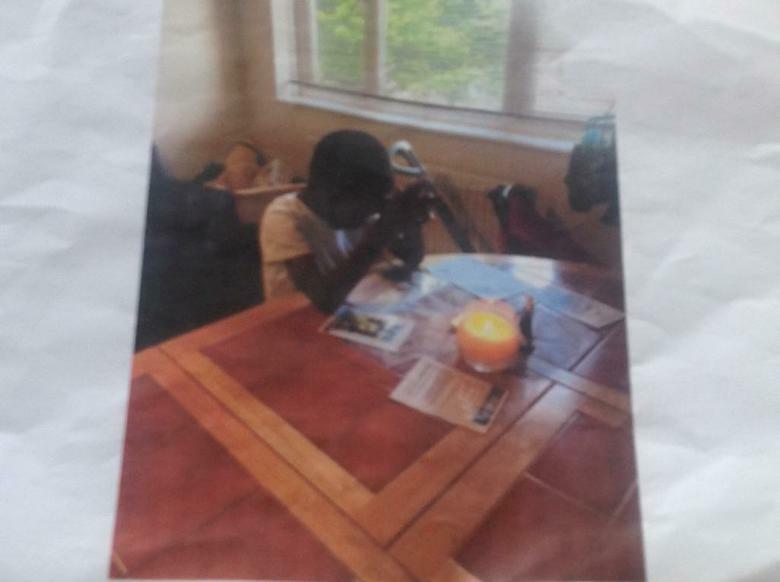 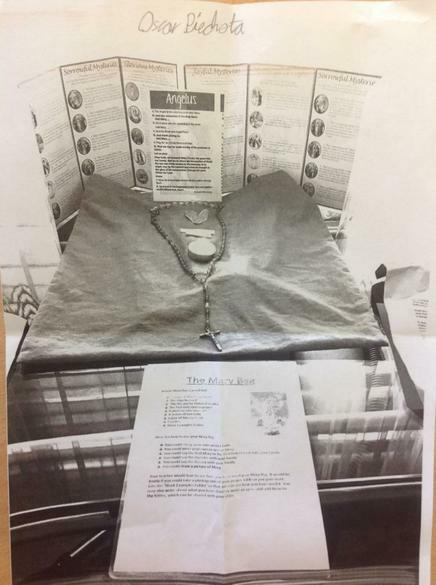 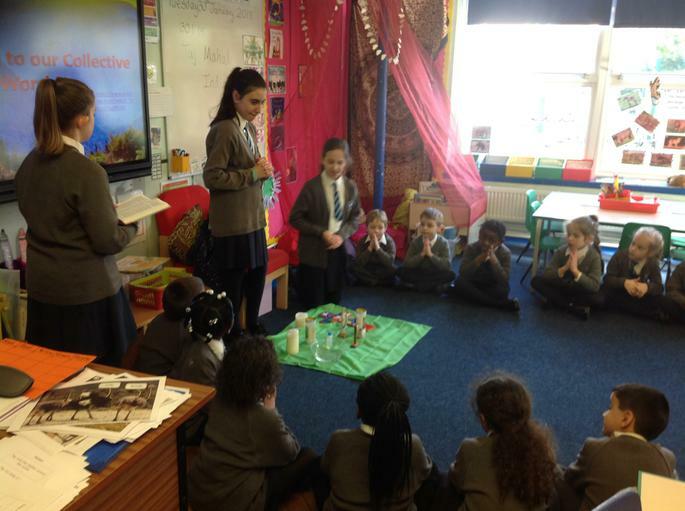 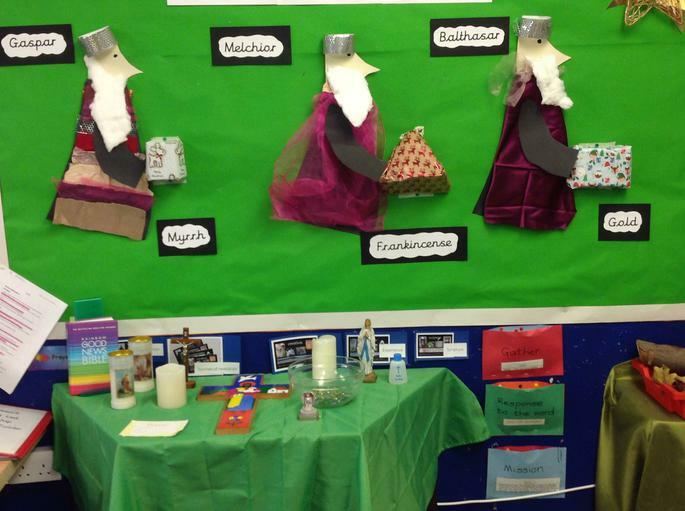 Our Year 6 girls have planned and delivered thought-provoking Collective Worship sessions to 1 Esau. 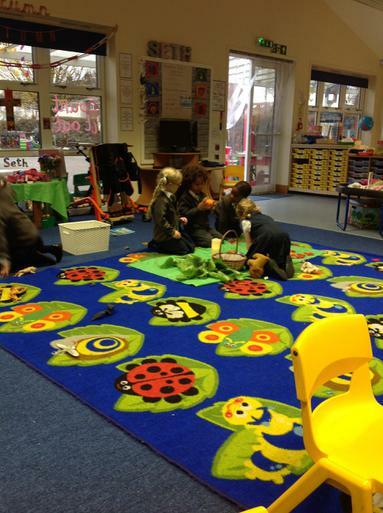 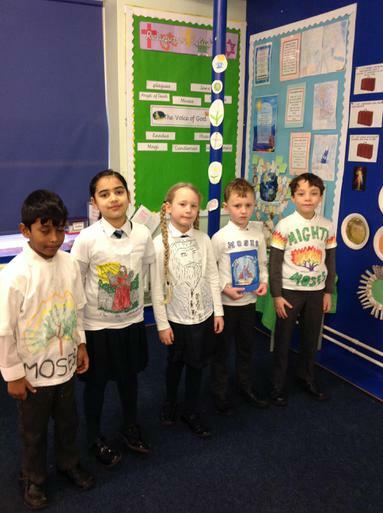 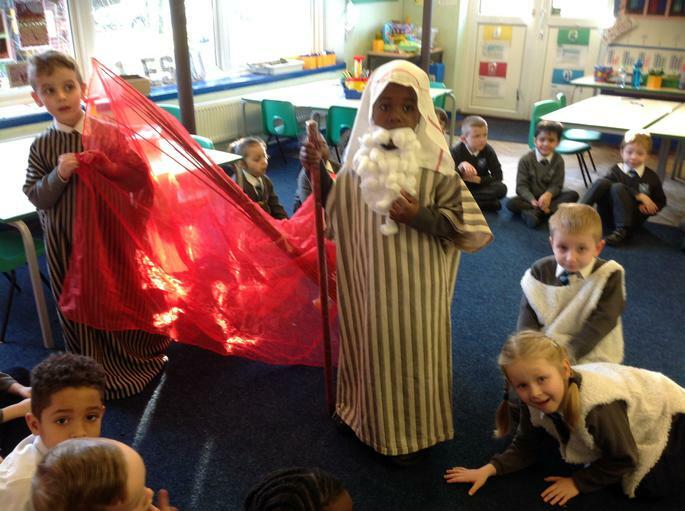 1 Esau enjoyed role-playing the story of Moses and the Buring Bush. 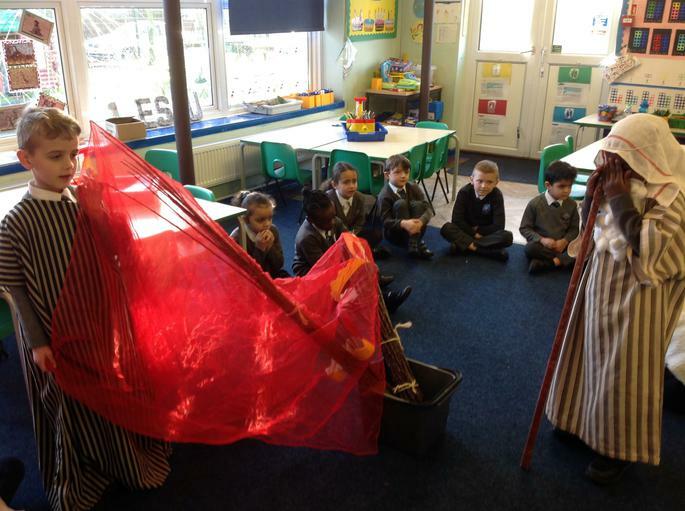 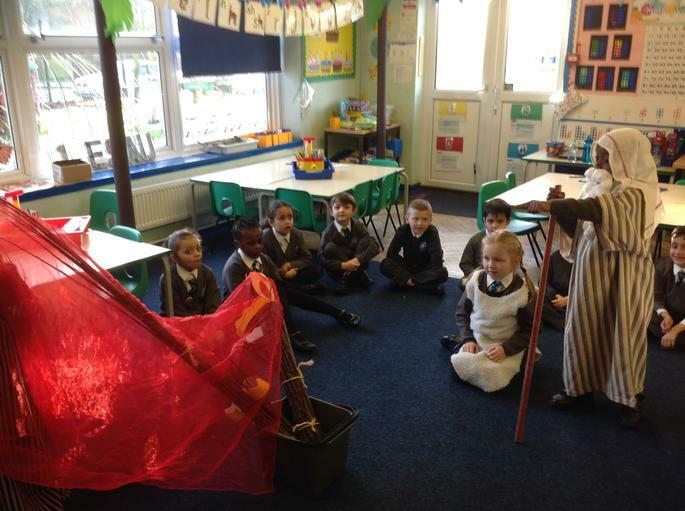 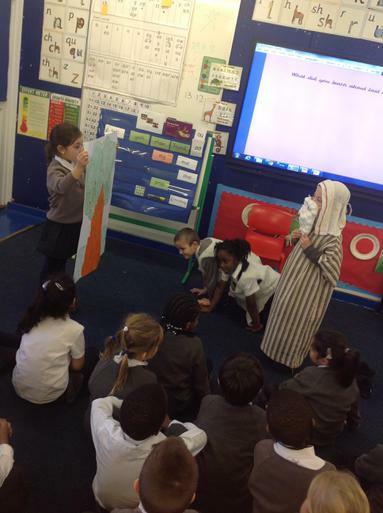 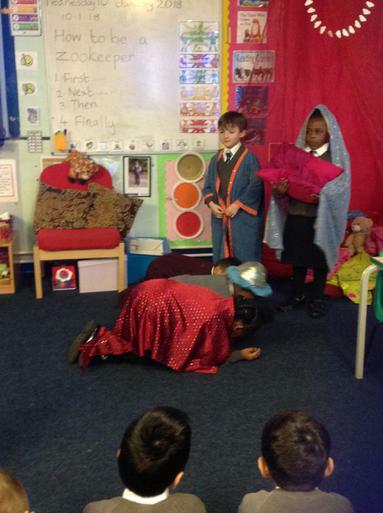 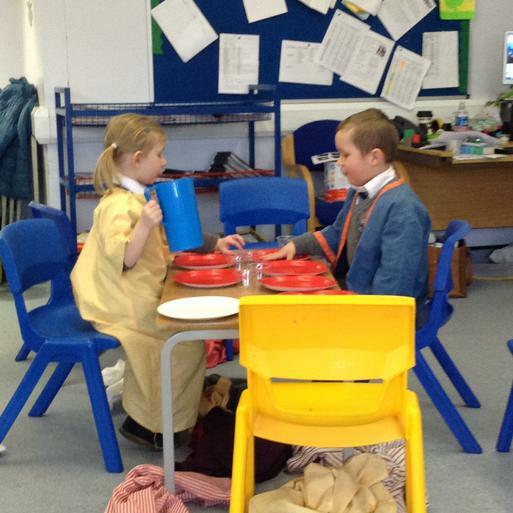 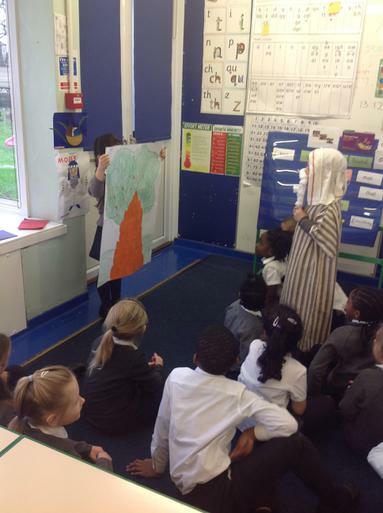 Year 1 participated in role play telling the story of Moses and the Pharaoh - Miss Wall was a wonderful Moses! 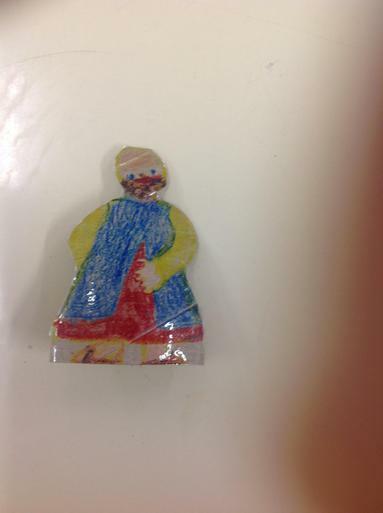 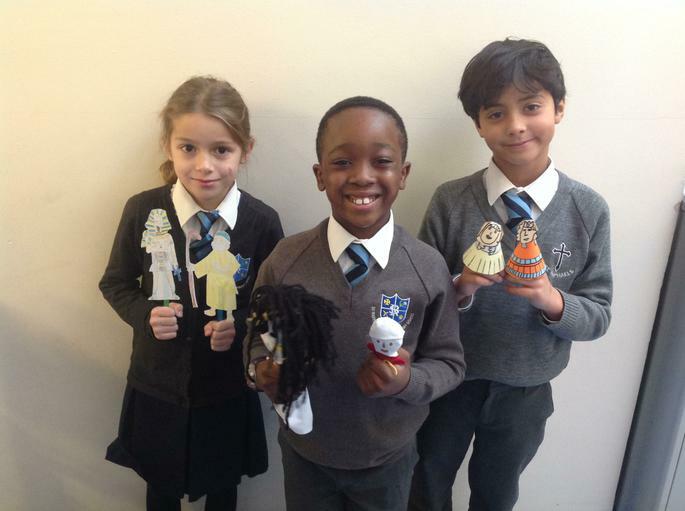 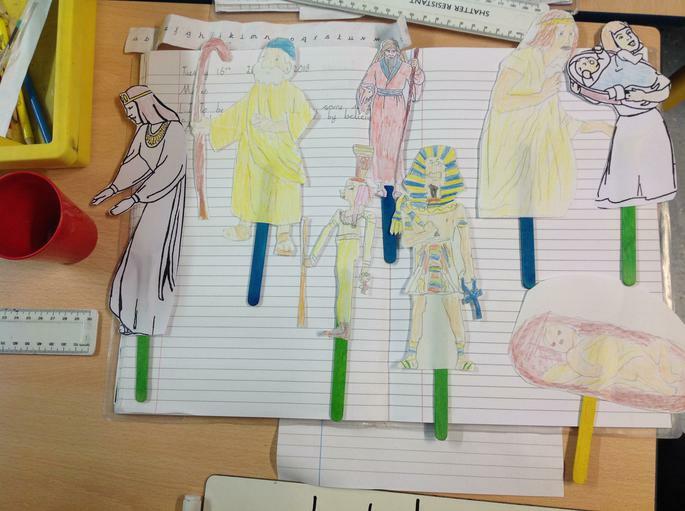 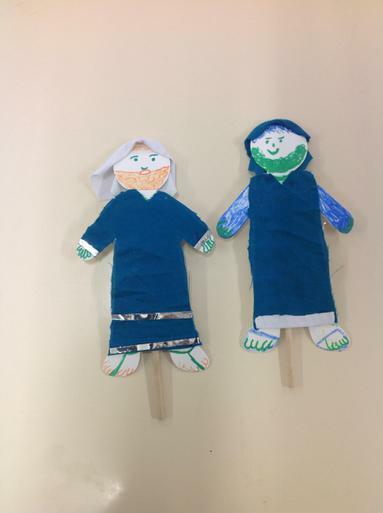 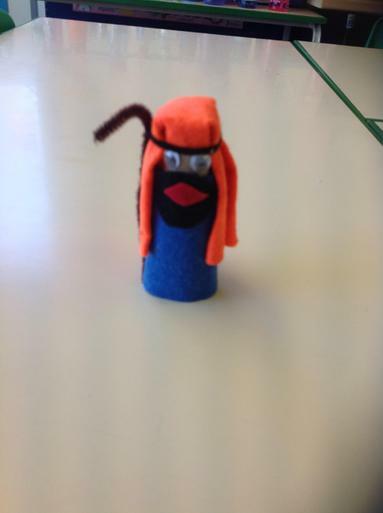 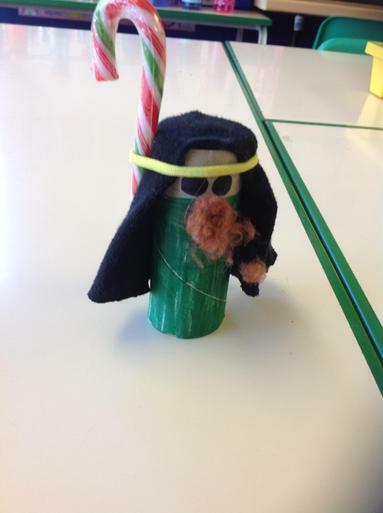 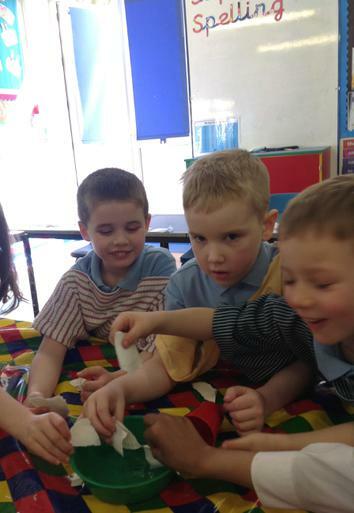 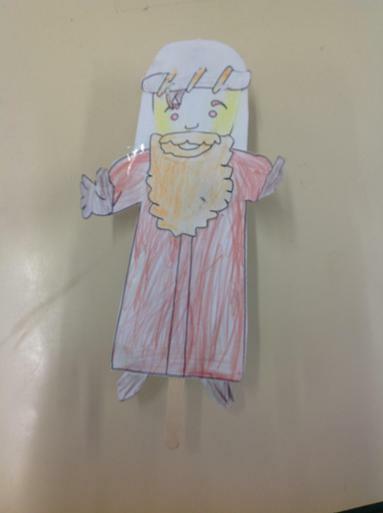 They made amazing Moses finger puppets. 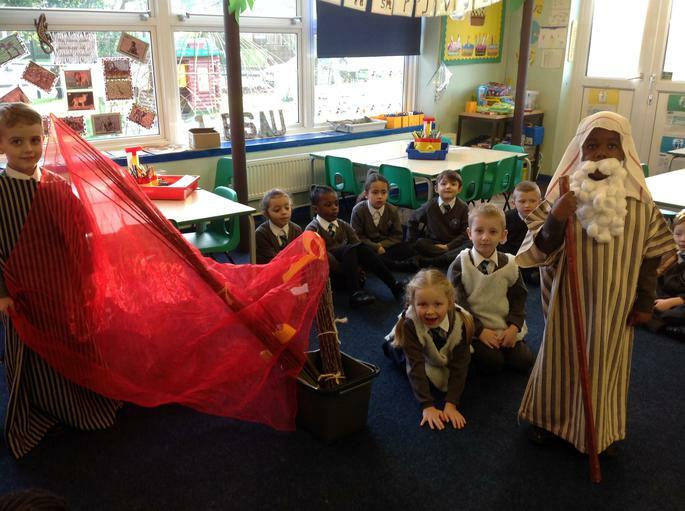 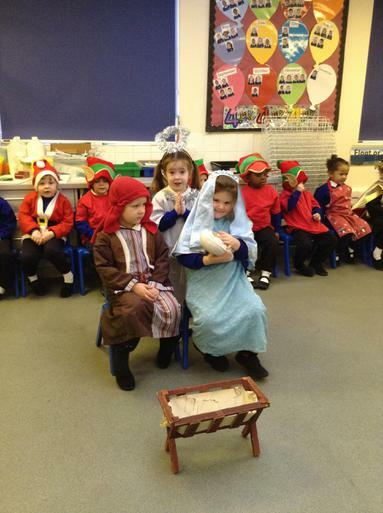 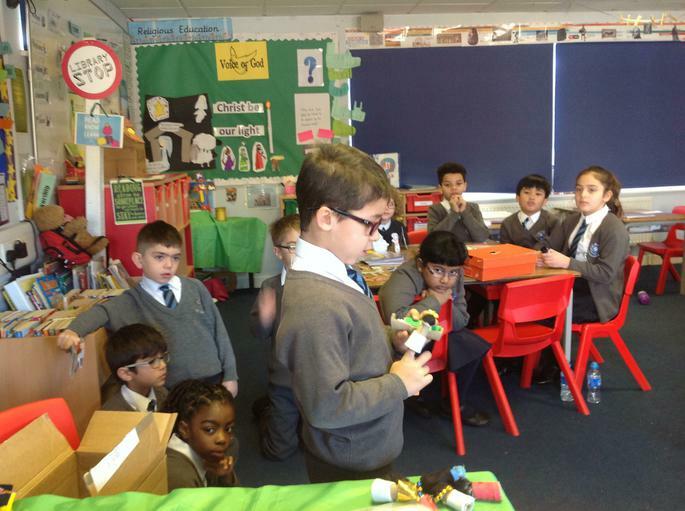 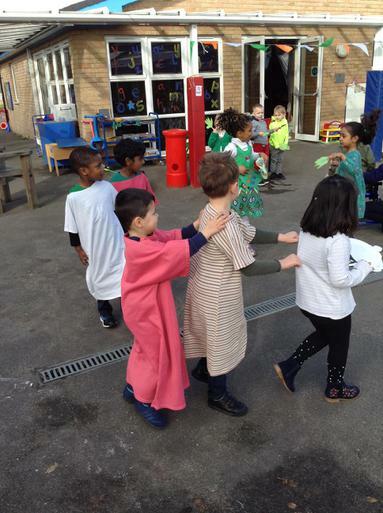 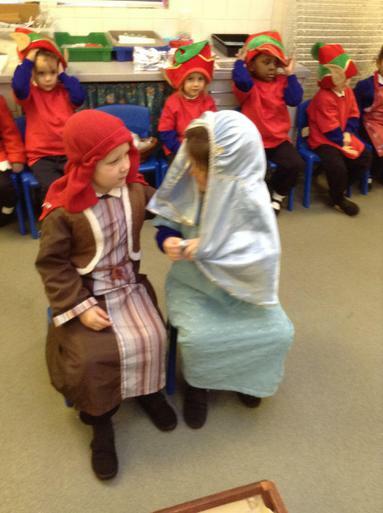 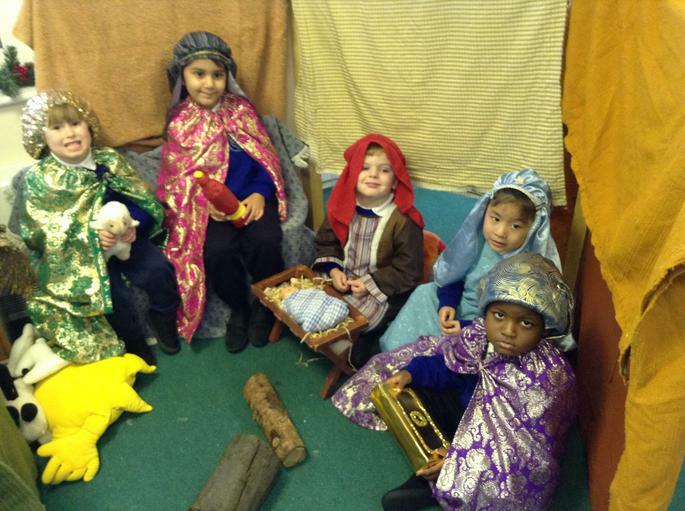 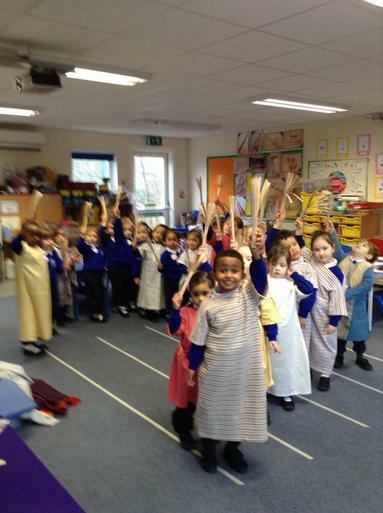 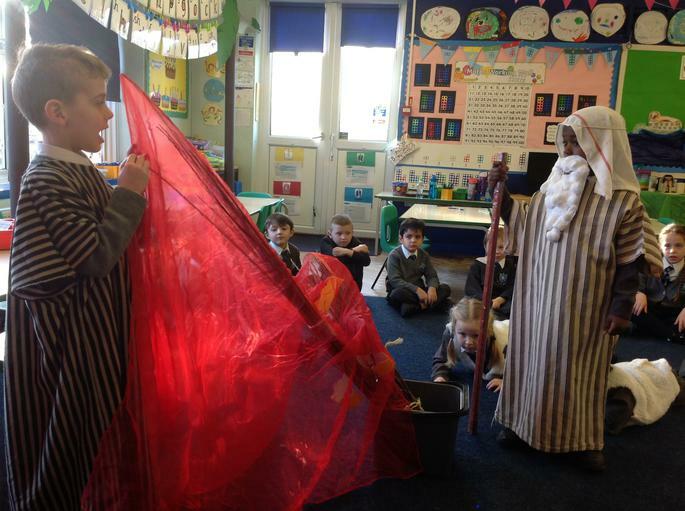 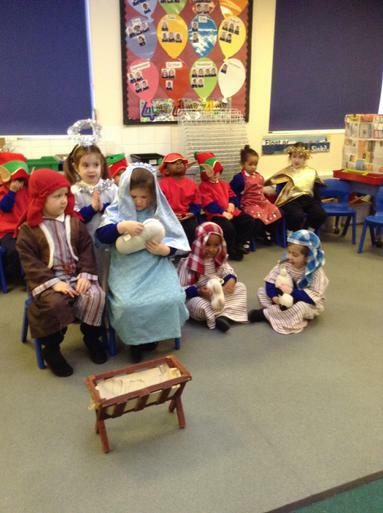 Year 1 enjoyed re-enacting the arrival of the Magi to the stable in Bethlehem, where they brought gifts for baby Jesus. 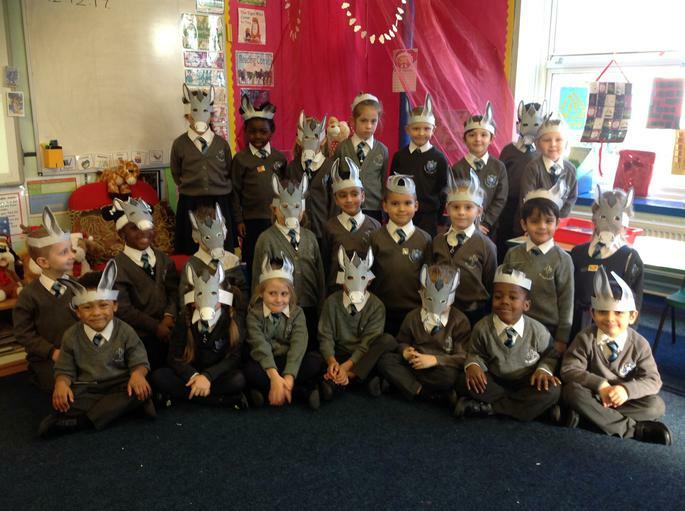 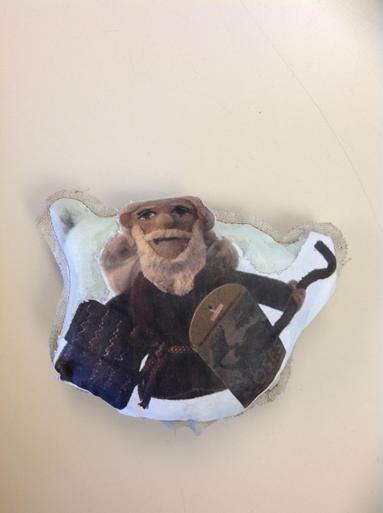 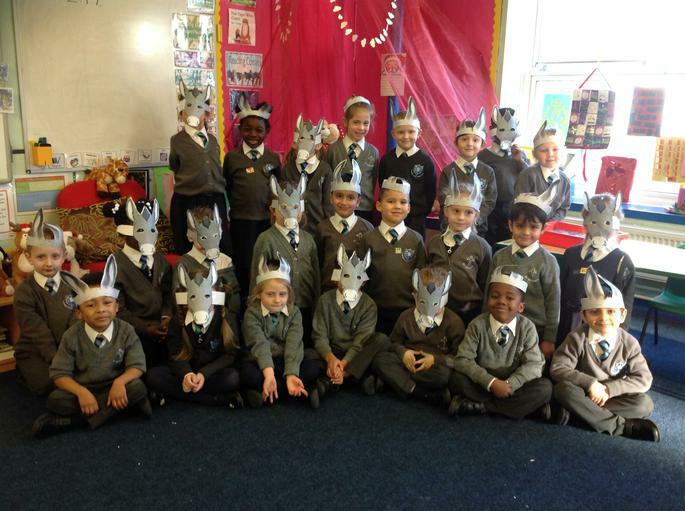 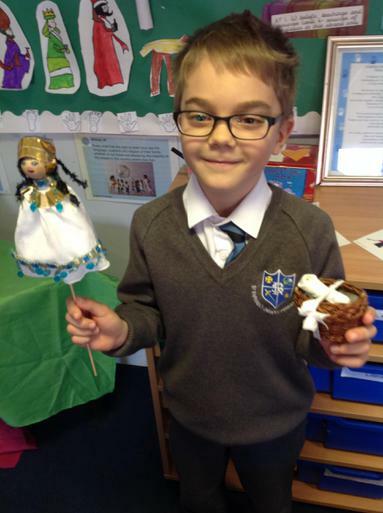 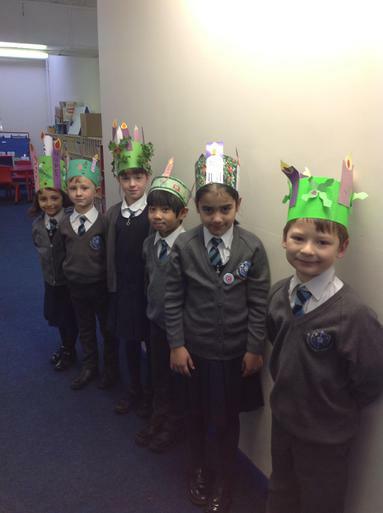 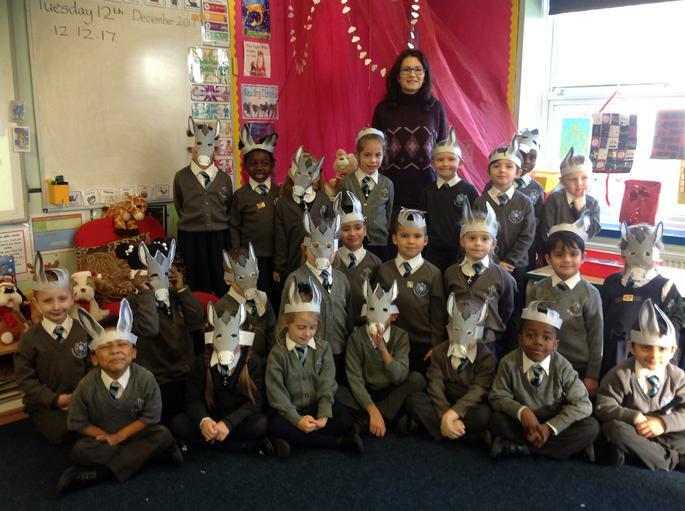 1 Esau made donkey masks and ears for their role play of Mary and Joseph's journey to Bethlehem. 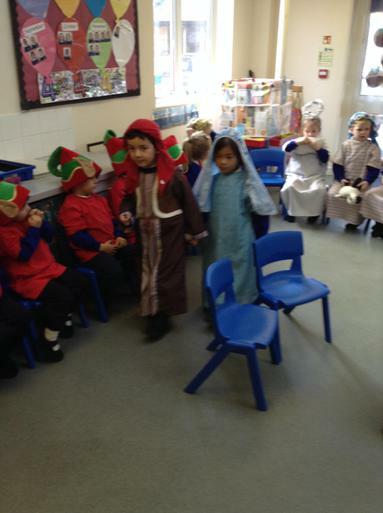 They imagined what it felt like to be the Little Donkey carrying Mary and her precious load. 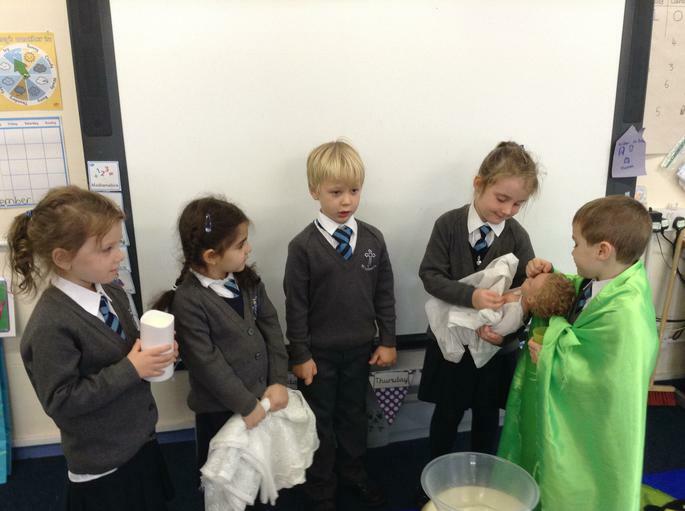 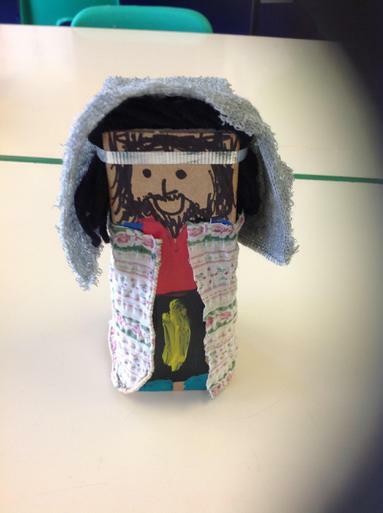 As we prepared for Advent and the birth of Baby Jesus, Laura's Mummy brought her baby to see 1 Esau. 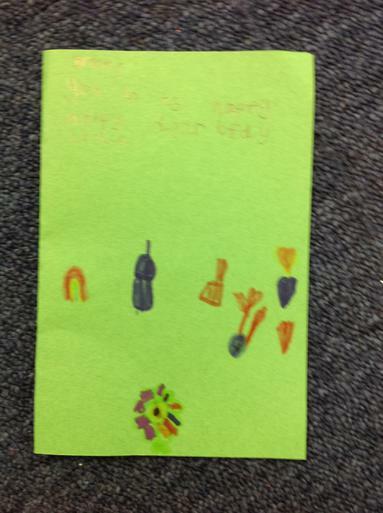 She told us all the things she had to do to prepare for her baby. 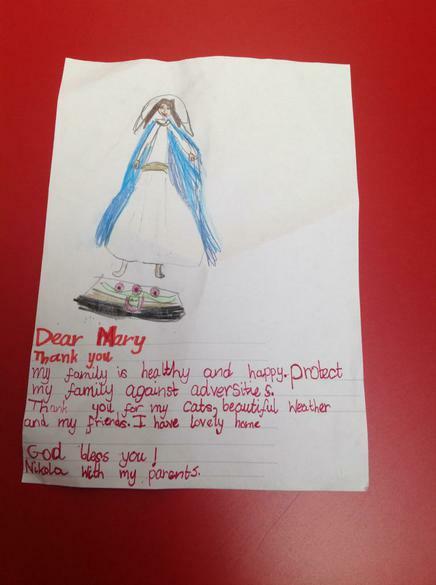 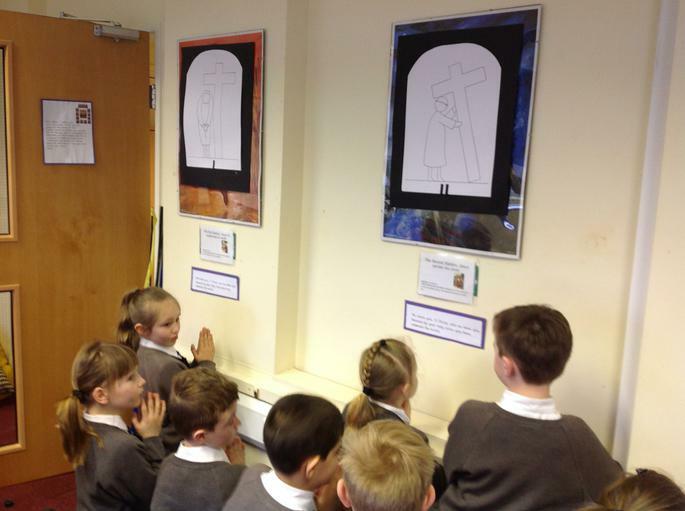 During our Be Spirited week we looked at the artist Sieger Koder and his Nativity artwork. 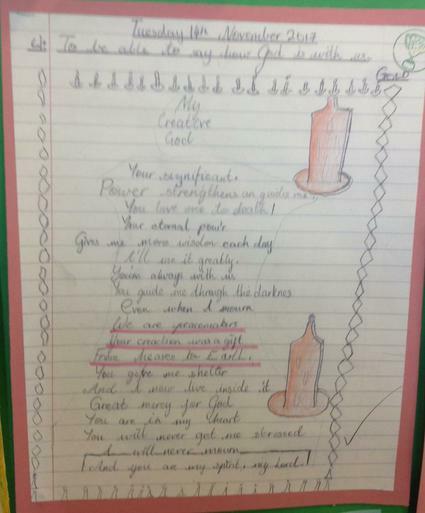 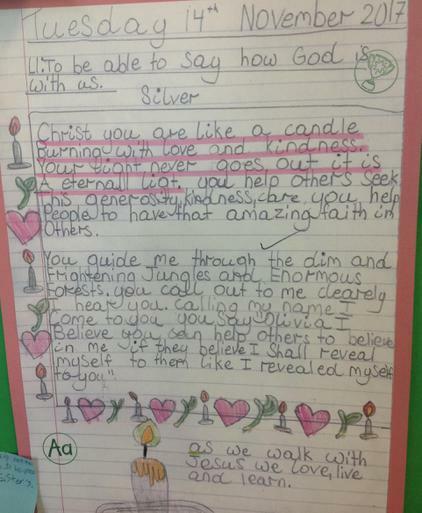 We thought about how God is with us in our lives and created poems to show this. 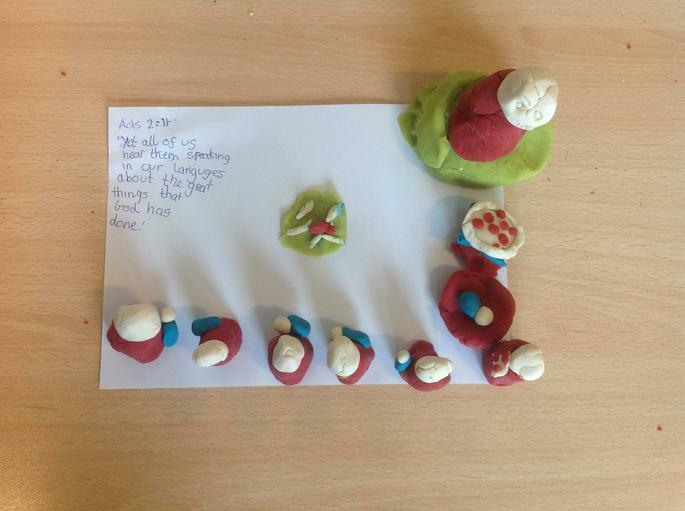 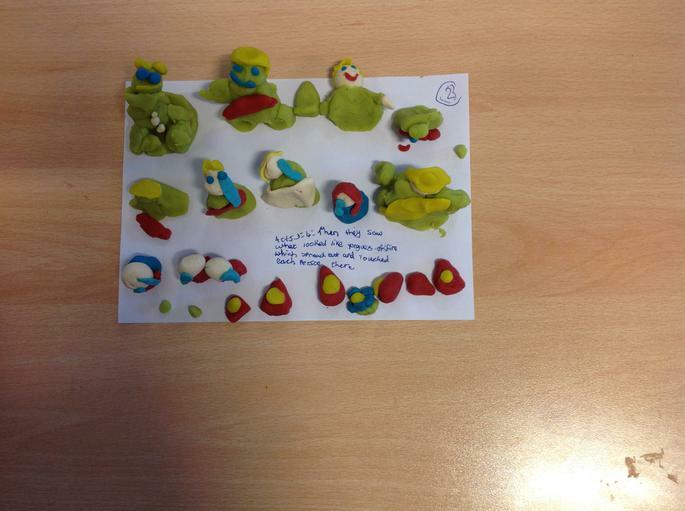 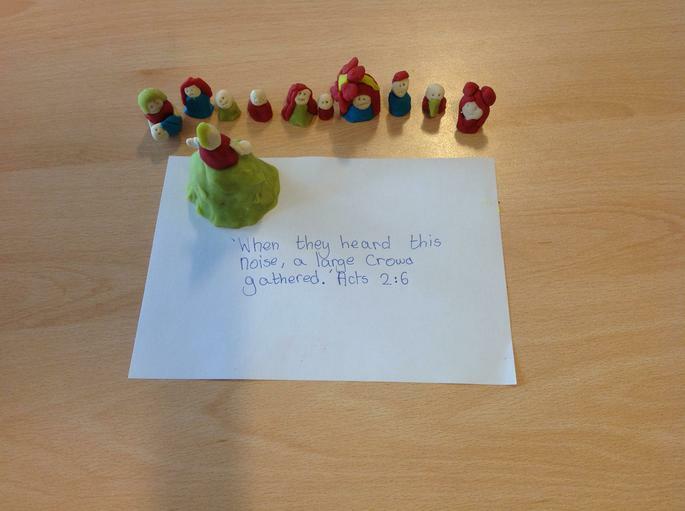 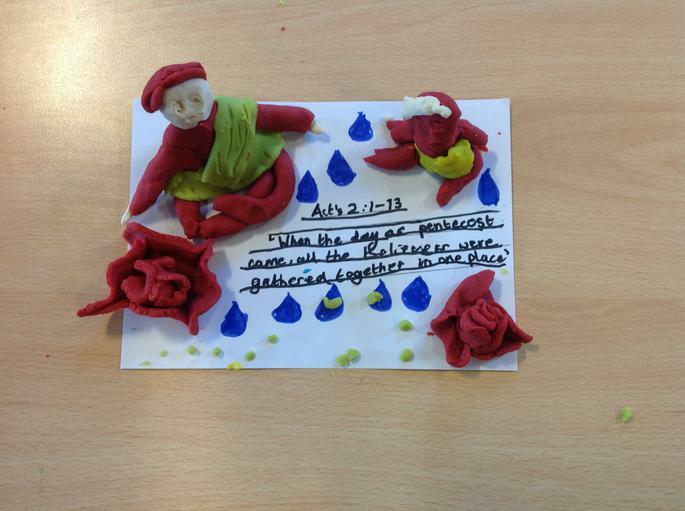 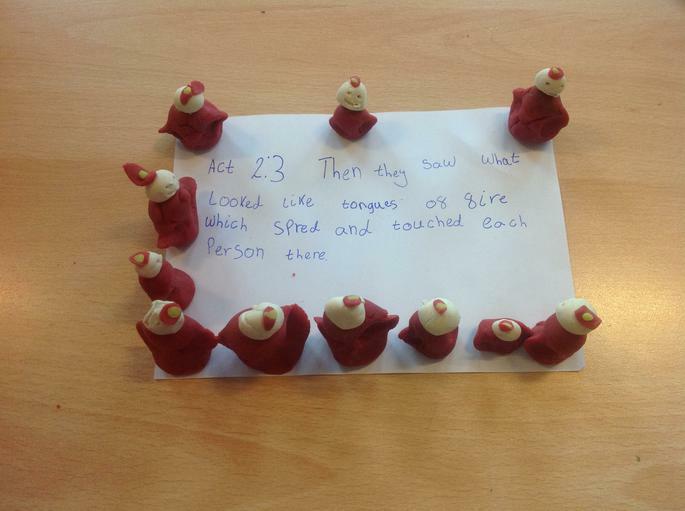 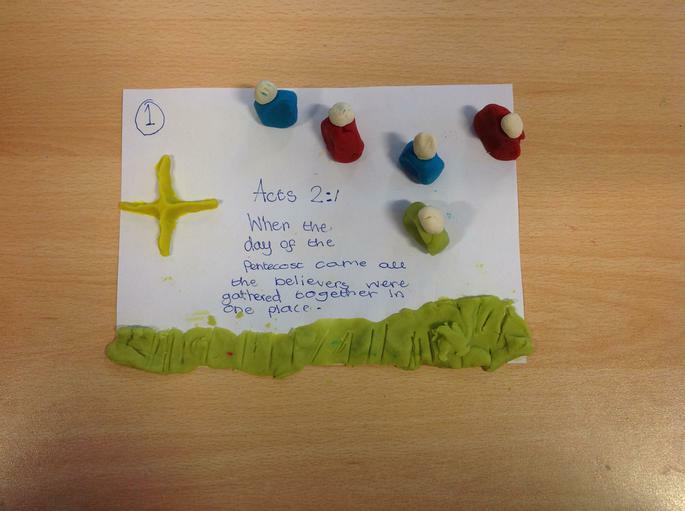 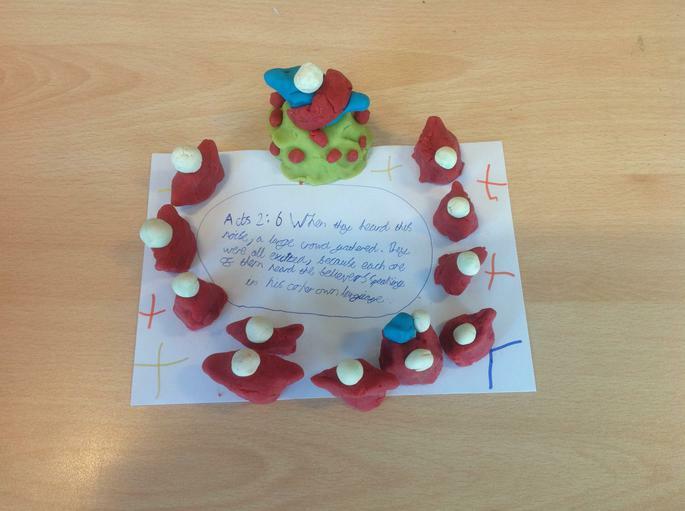 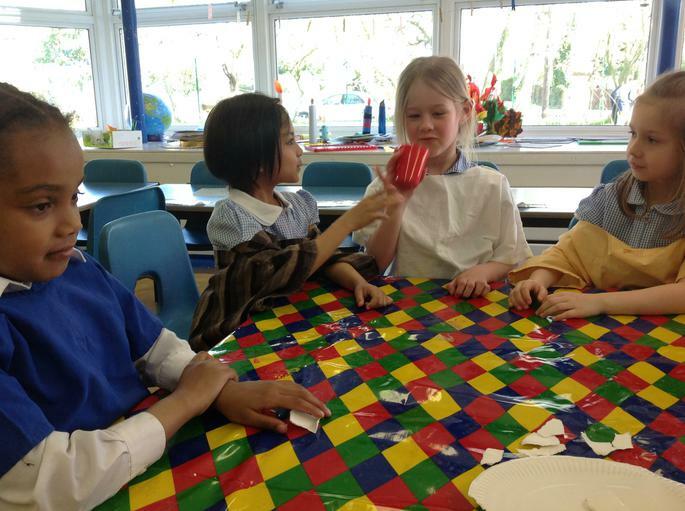 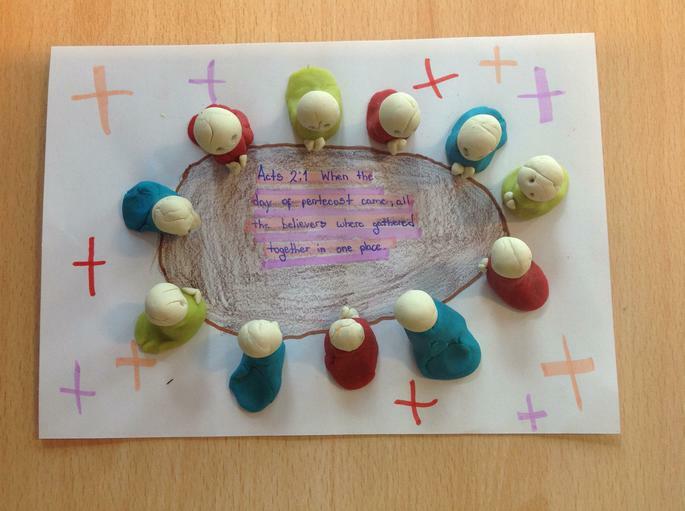 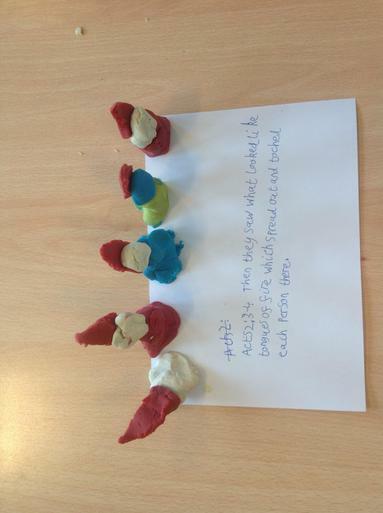 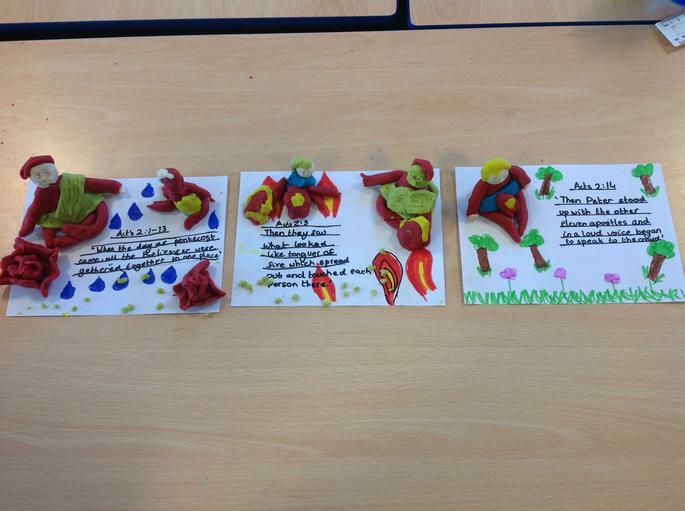 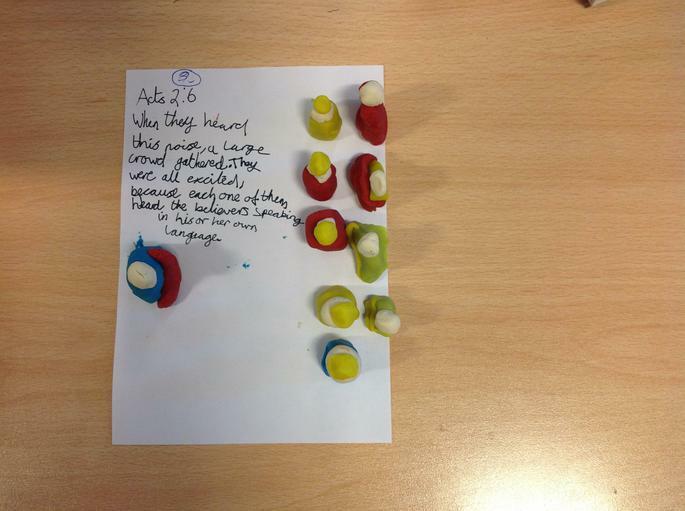 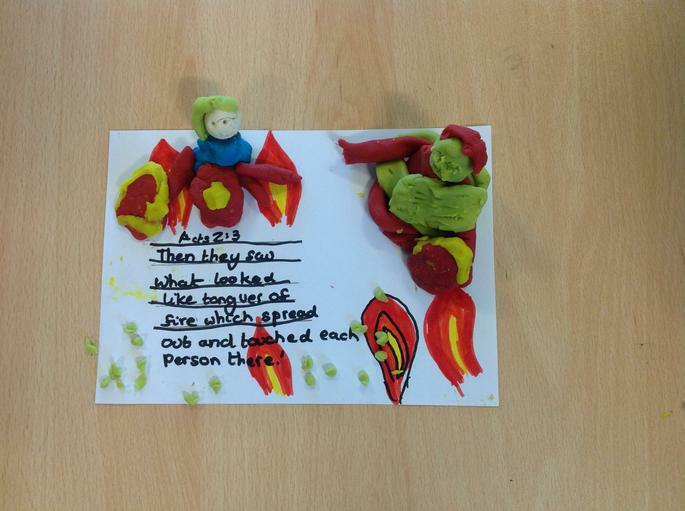 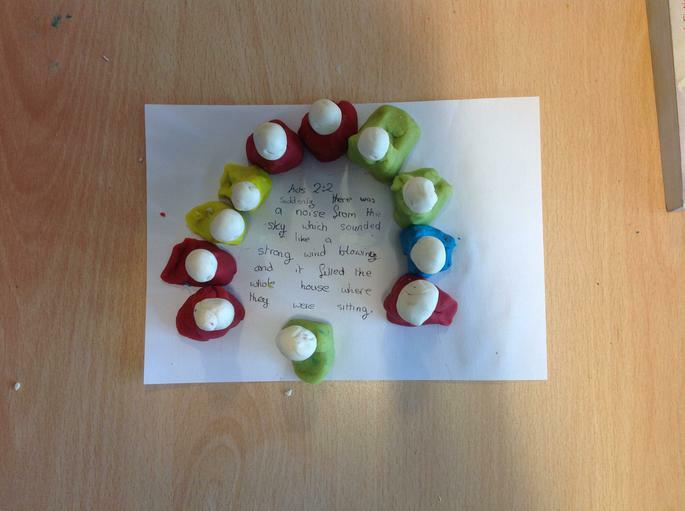 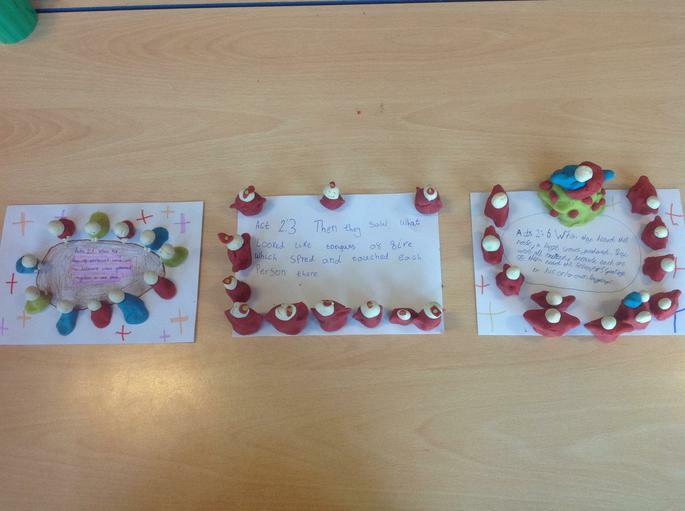 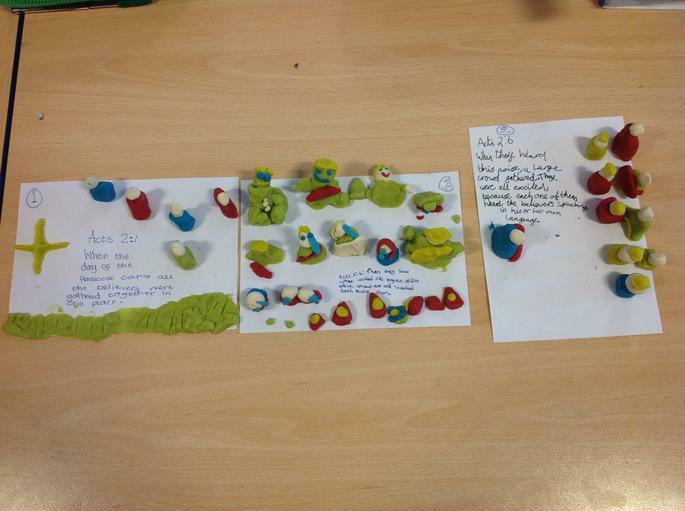 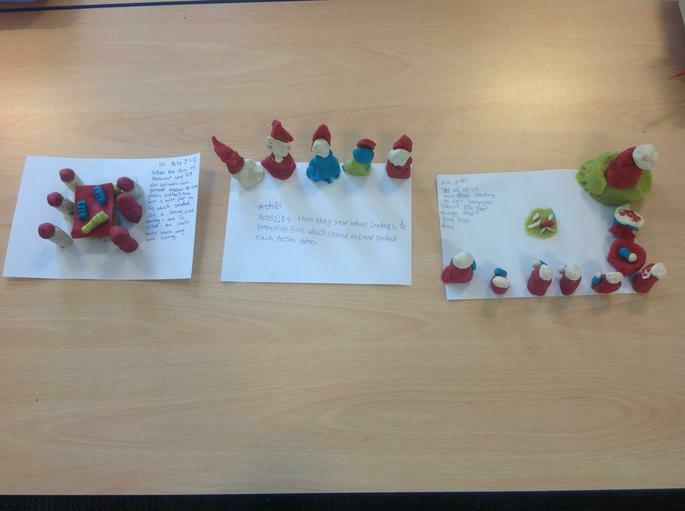 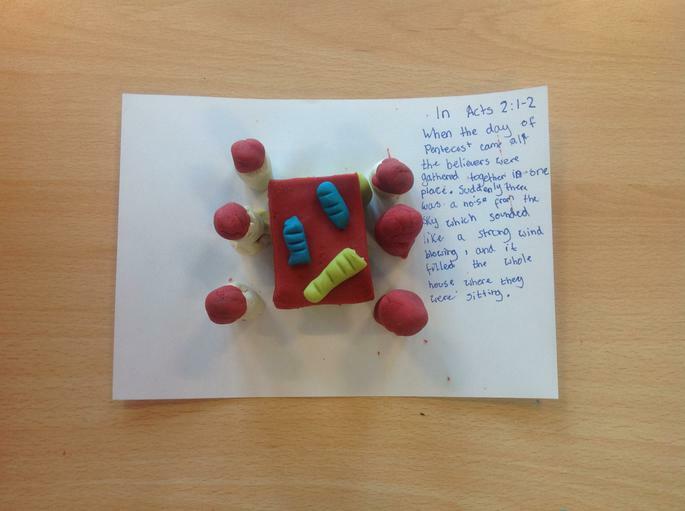 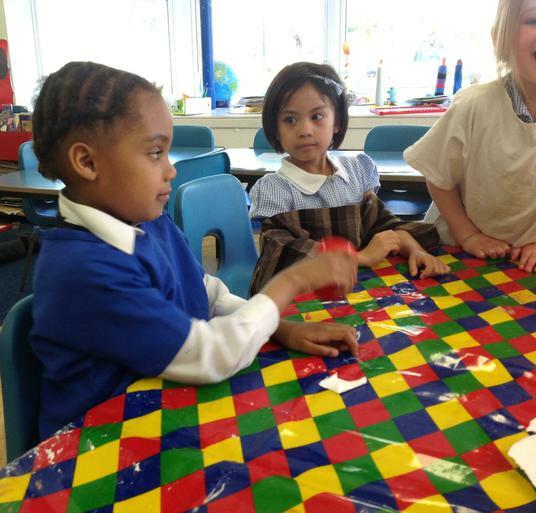 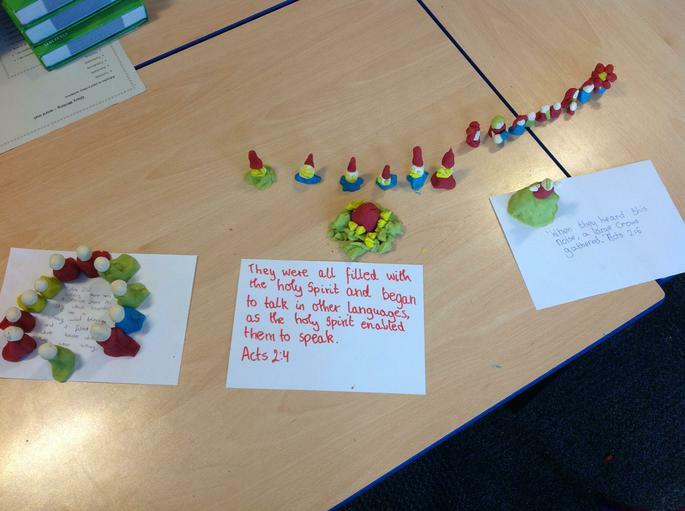 Year 5 worked in groups and reproduced the story of Pentecost using play dough. 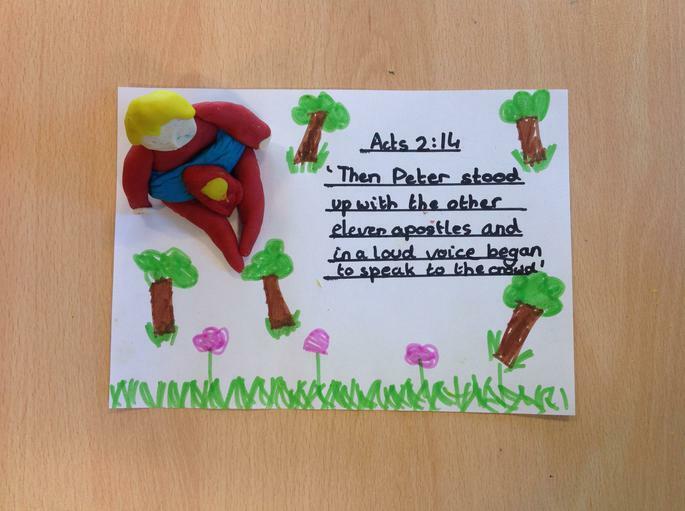 We linked our play dough scenes to scripture. 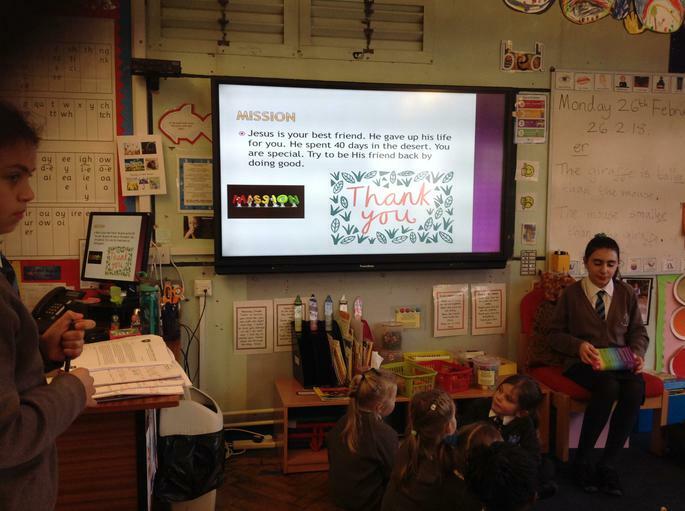 During Caritas week, we looked at Pope Francis' letter 'The Lodato Si' and decided to become better stewards of our planet. 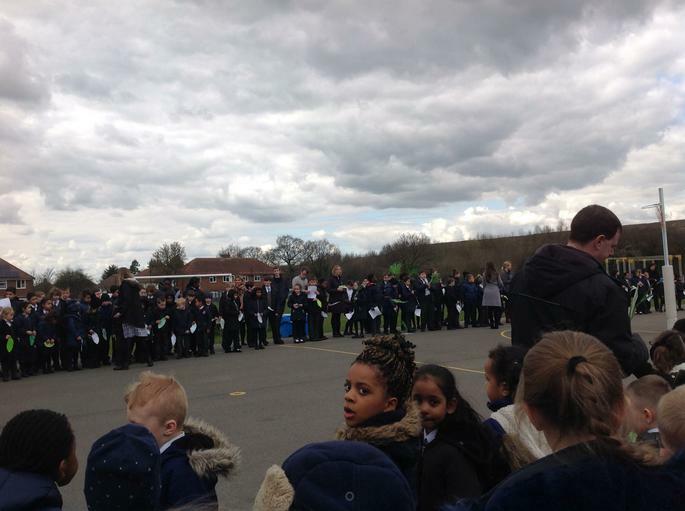 As a result, we devised some questions and then interviewed Mr Kaszmarek (Our school caretaker) on how we could reduce the waste we use in our school, recycle more efficiently while looking after the green space in our local area. 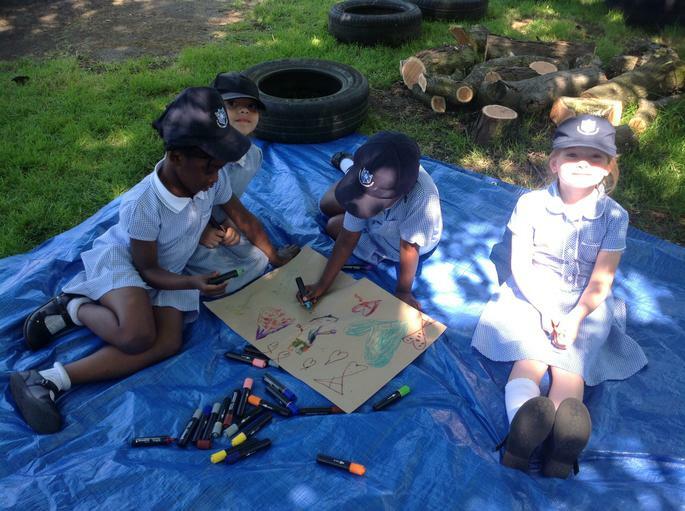 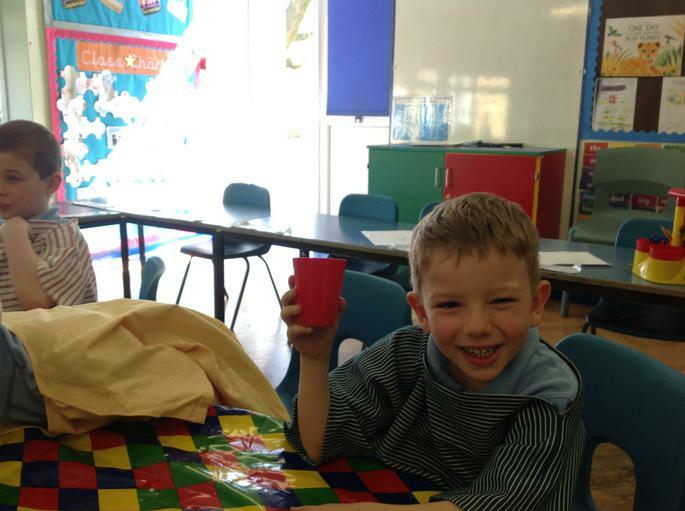 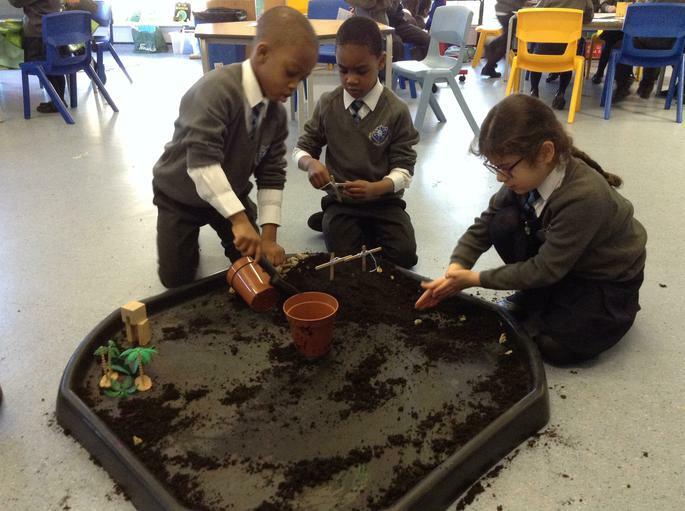 We learnt that by using reusable water bottles, putting our fruit peelings into a compost heap in the vegetable garden and ensuring we put our rubbish into the correct bins we can benefit ourselves, our local wildlife habitats and the planet. 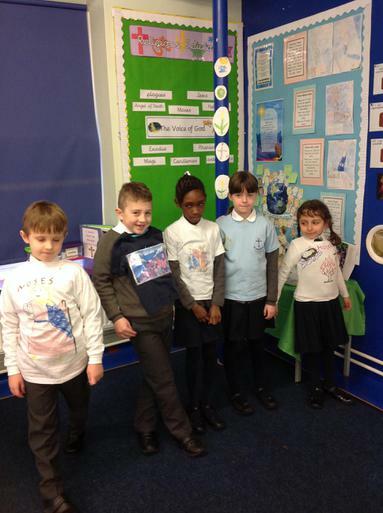 We are also going to promote the use of the 4R's (Reduce, reuse, recycle and repair). 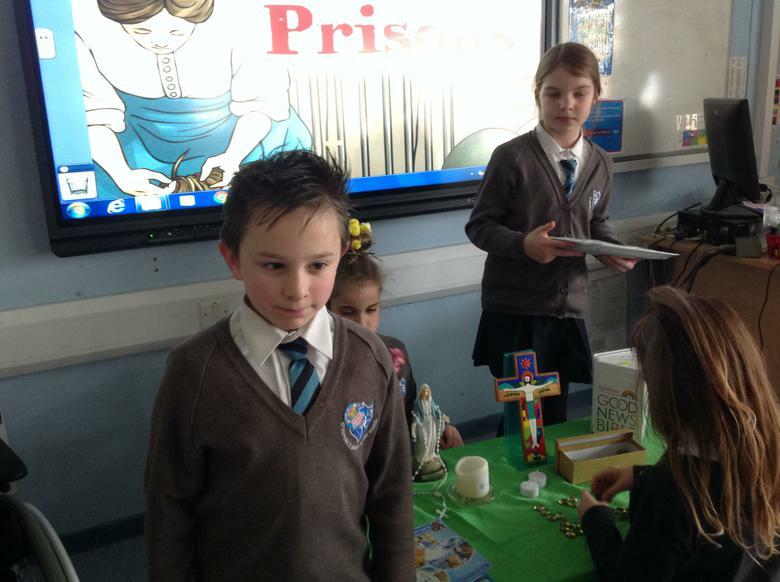 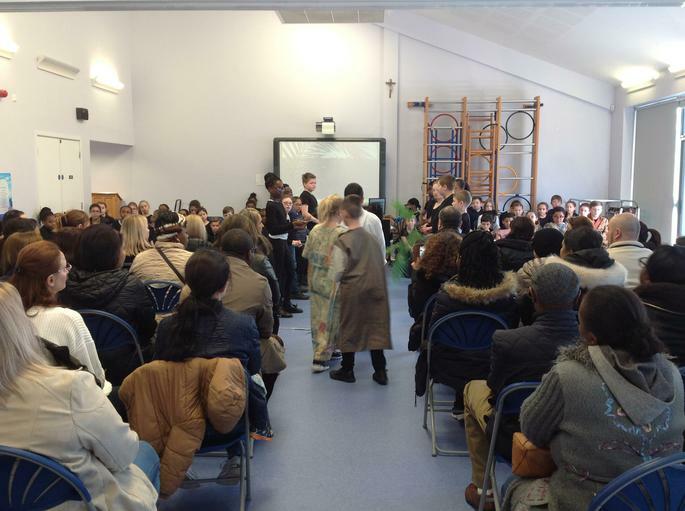 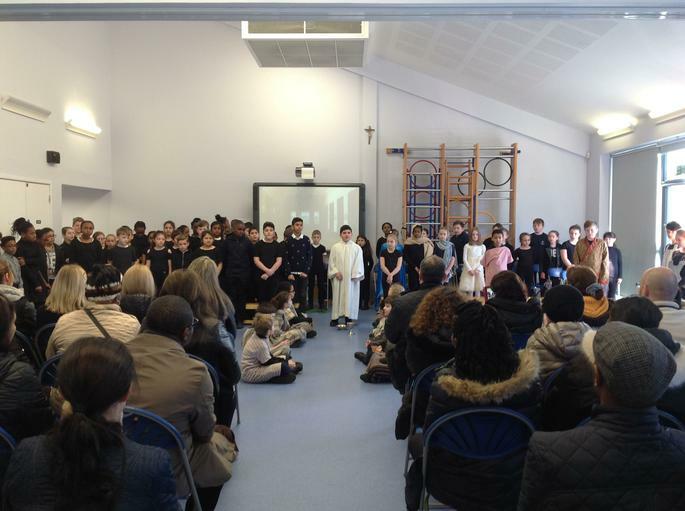 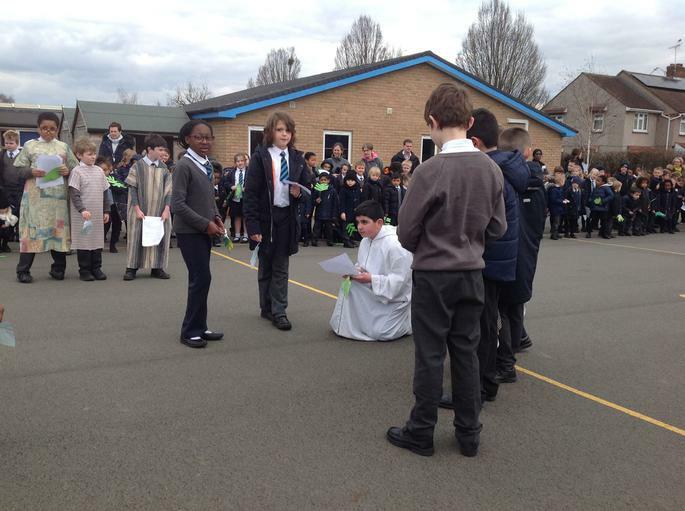 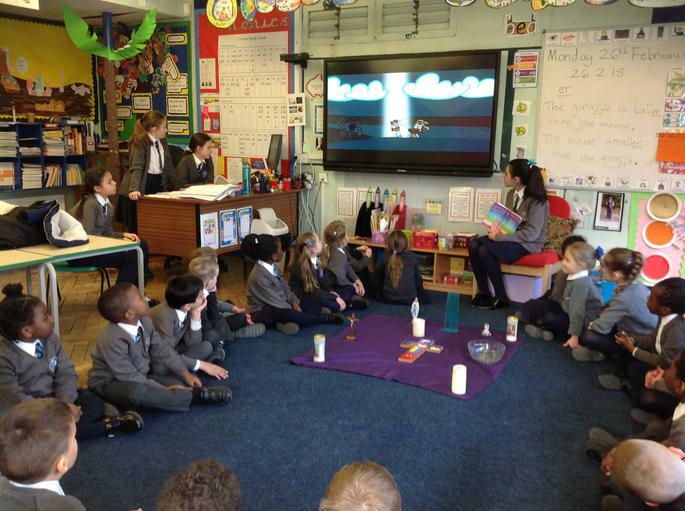 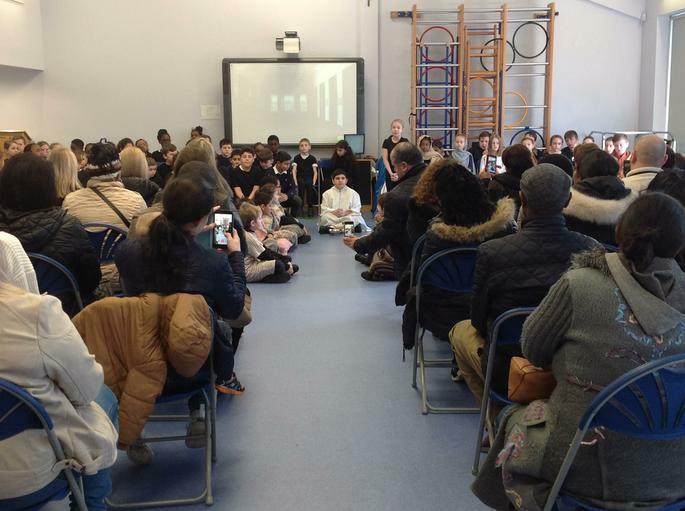 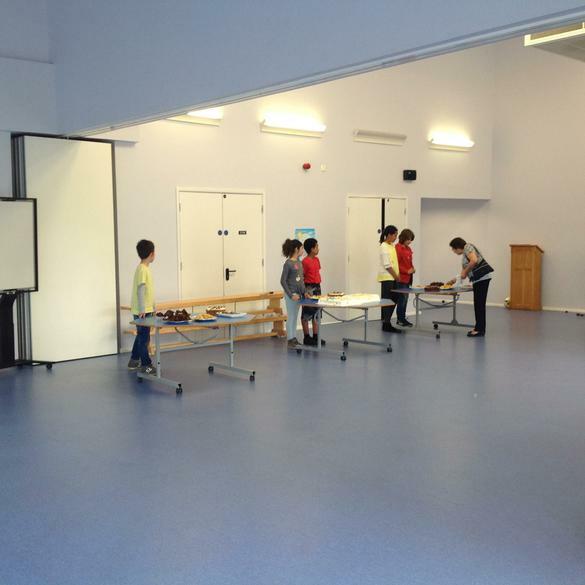 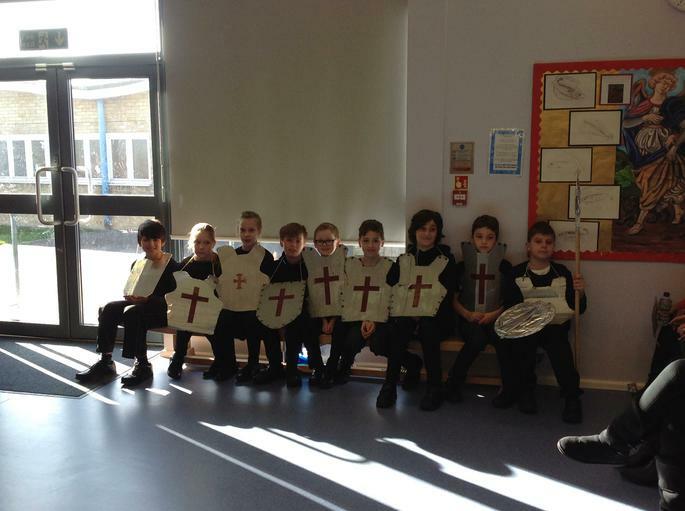 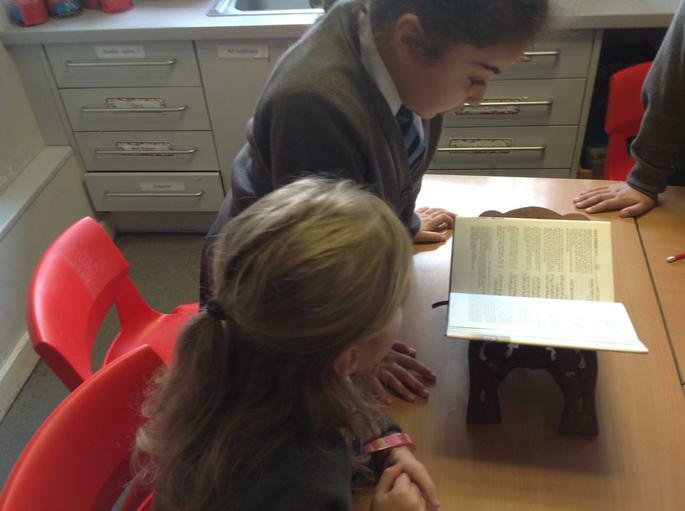 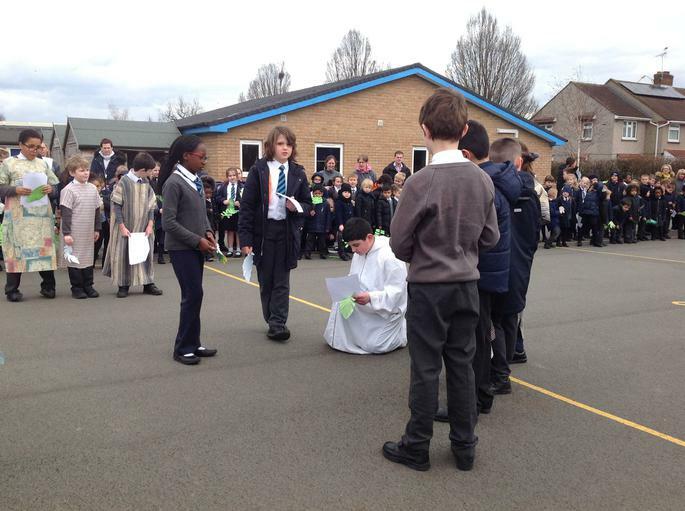 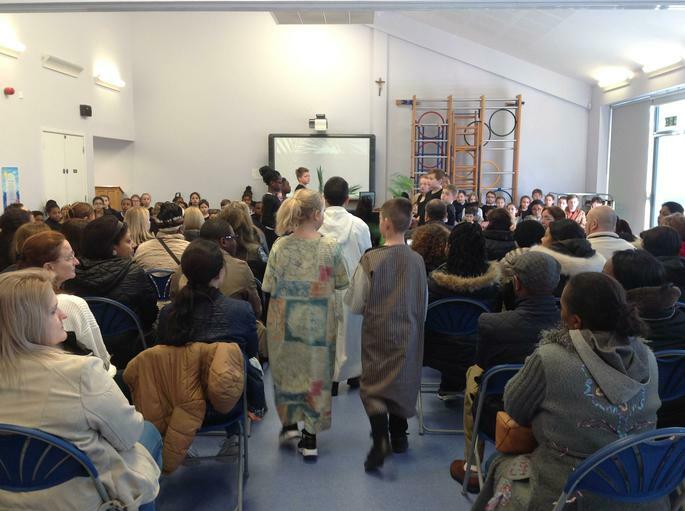 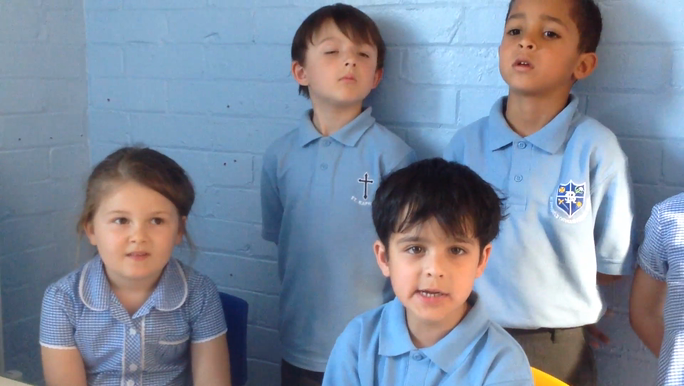 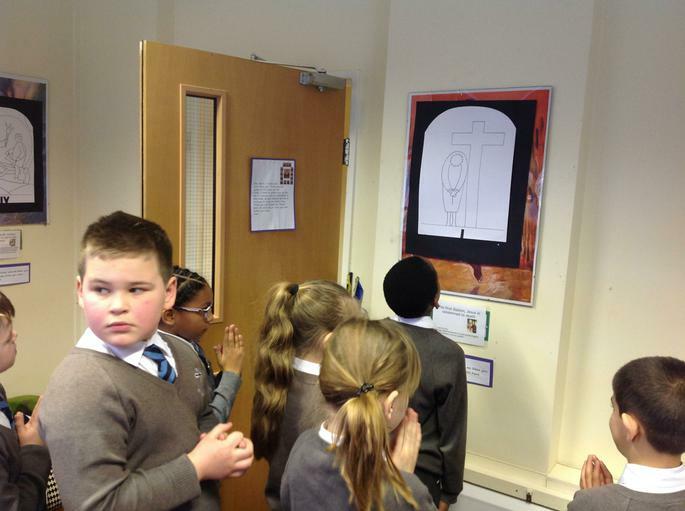 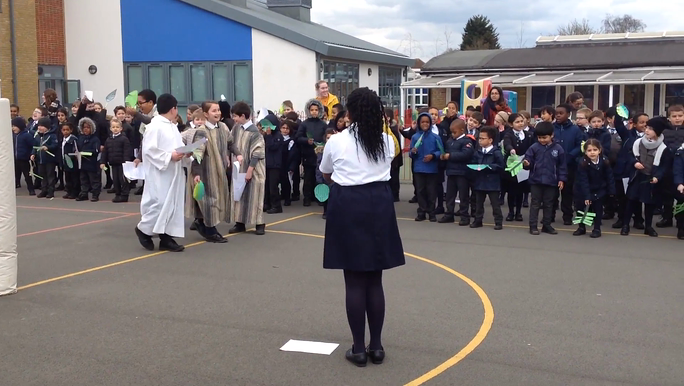 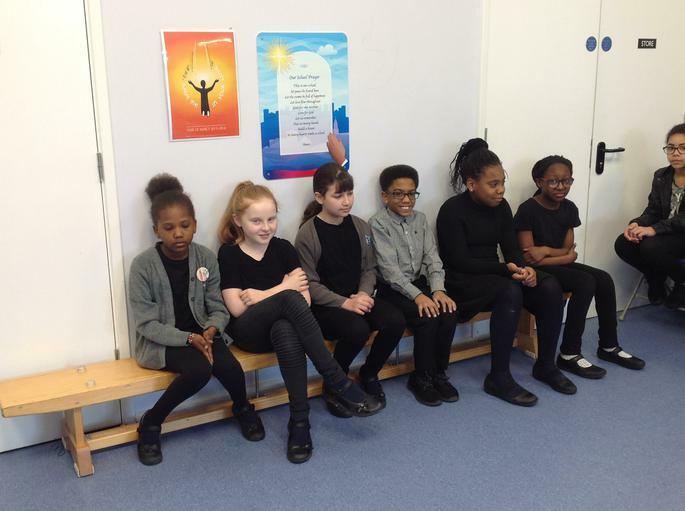 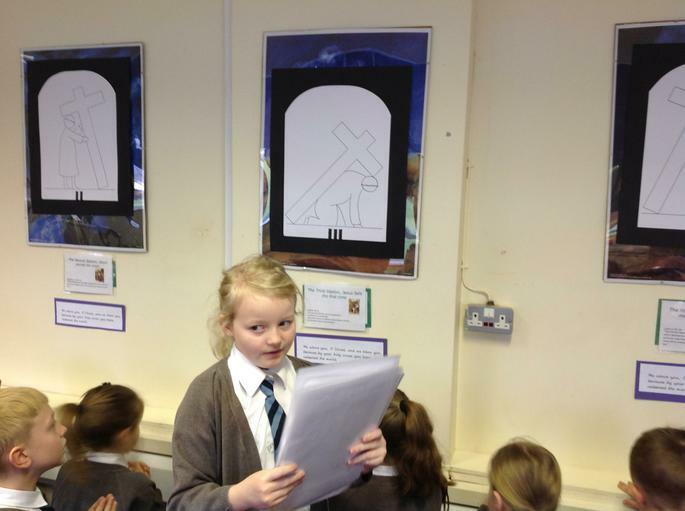 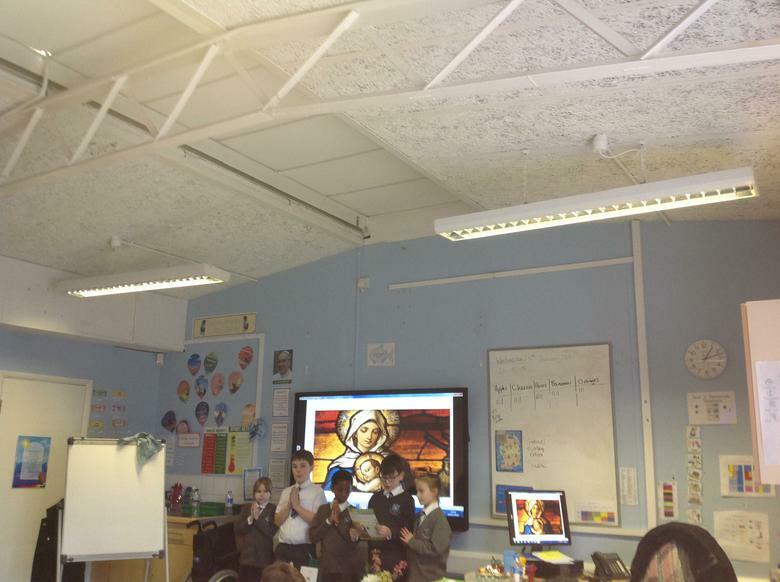 The Year 5 Pupil Chaplains led their class on a journey through the Stations of the Cross. 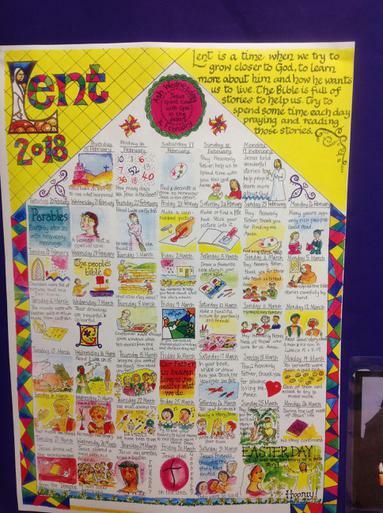 In Year 5 this week, we have been busy thinking about our Lenten promises. 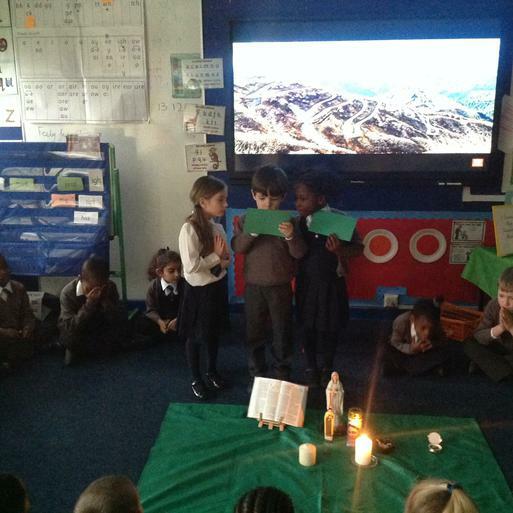 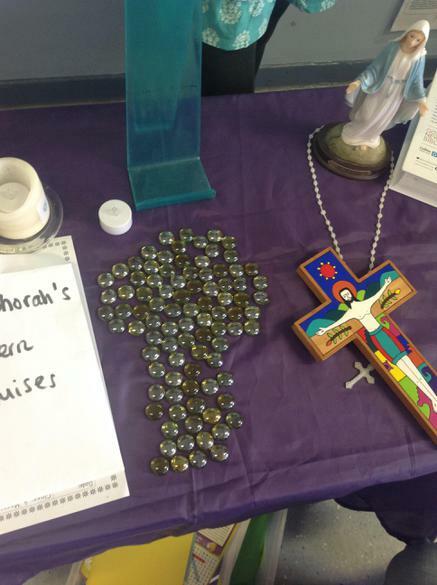 We reflected on the three practices of Lent and made our promises to God. 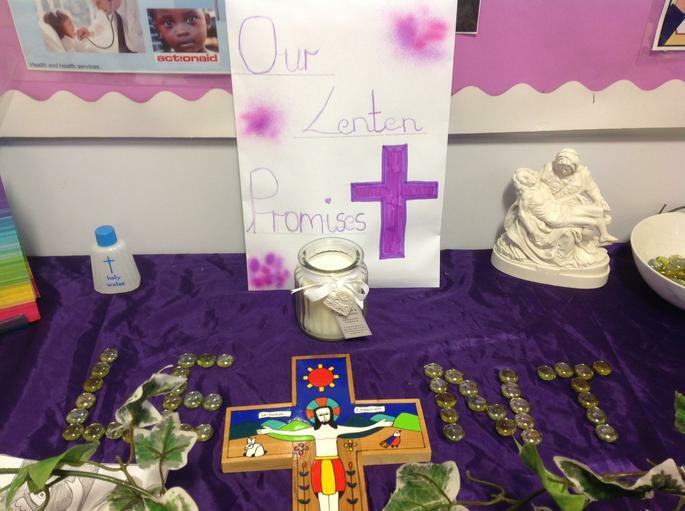 Have you made your Lenten promise yet? 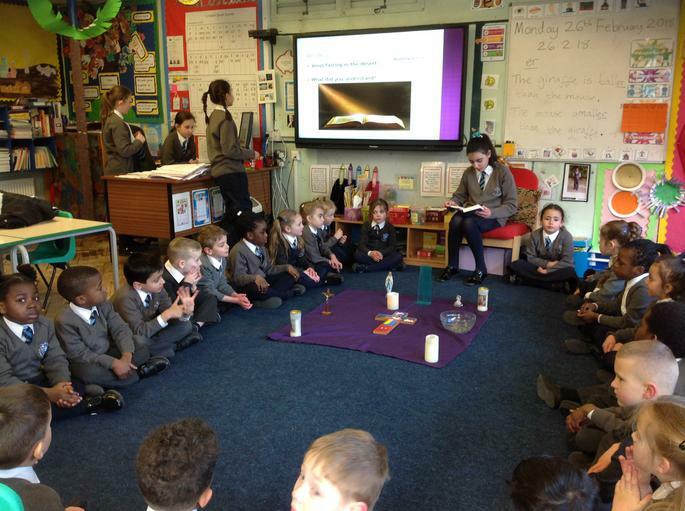 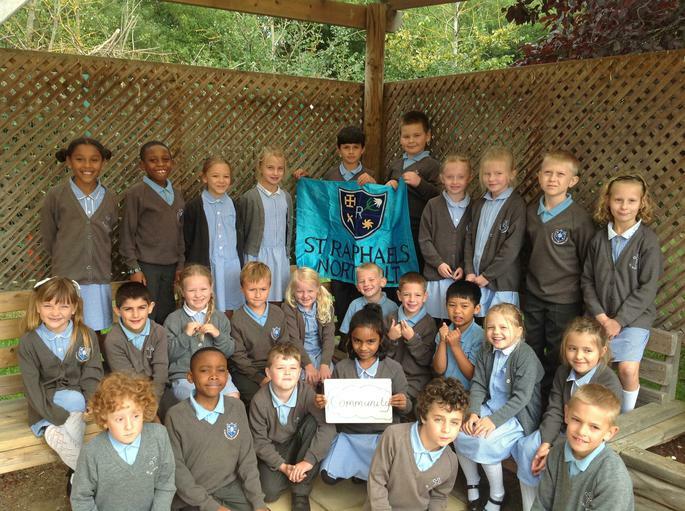 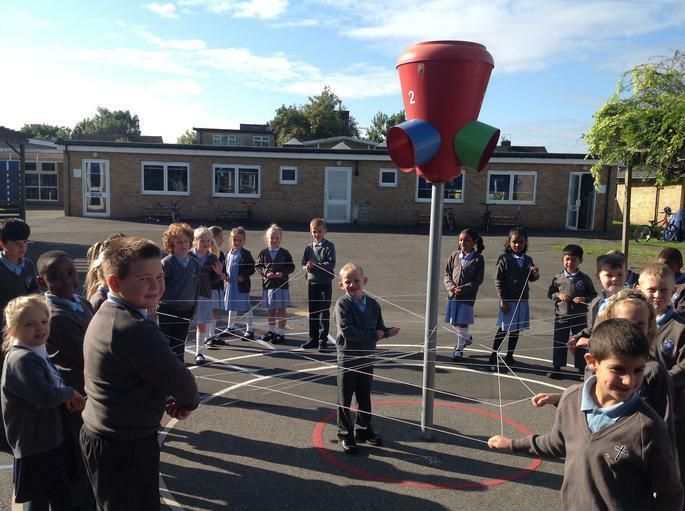 In Year 5 we reflected on what makes us a community and discussed our values (AT2). 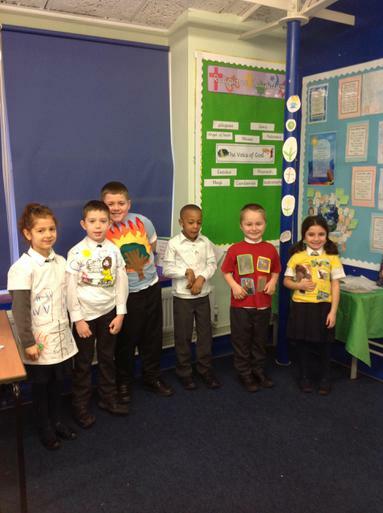 We decorated a jigsaw piece with images from our culture and our values. 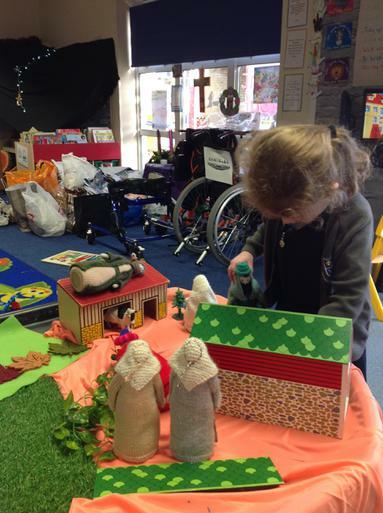 We agreed that communities are made up of people who live in the same area or have common interests. 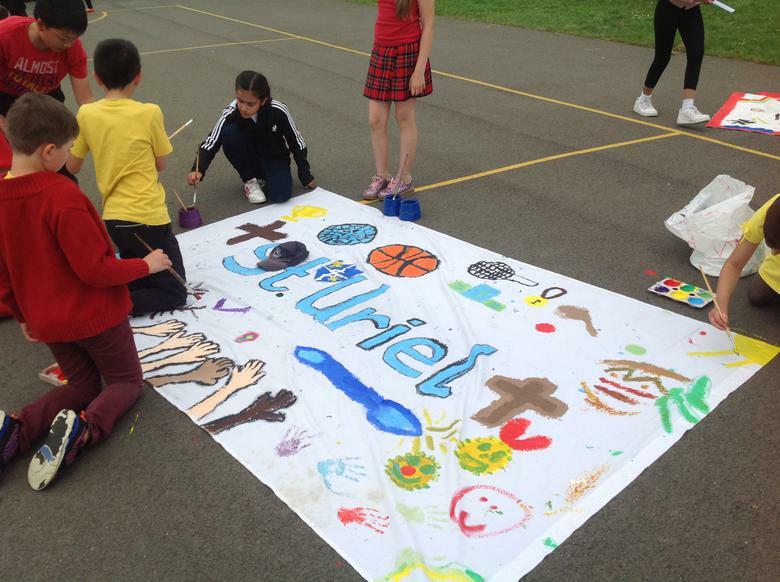 We all belong to several communities such as our street, town, country, the world and religious communities. 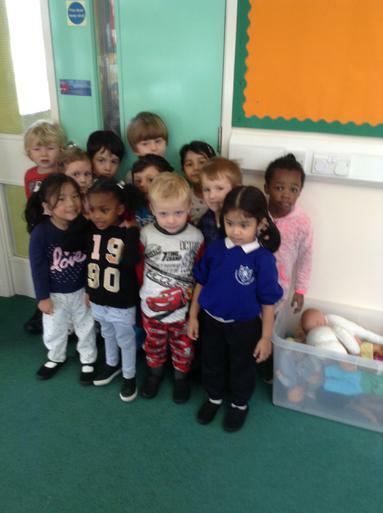 Can you identify where our families are from? 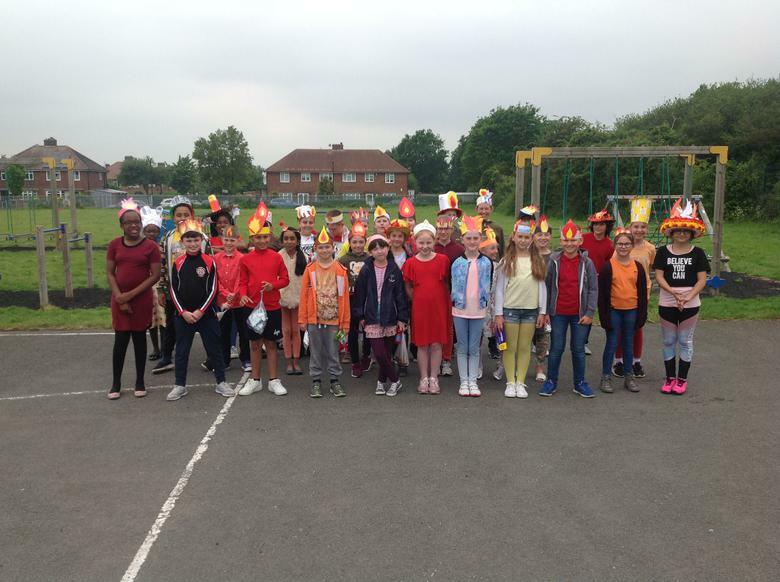 What makes us unique in Year 5? 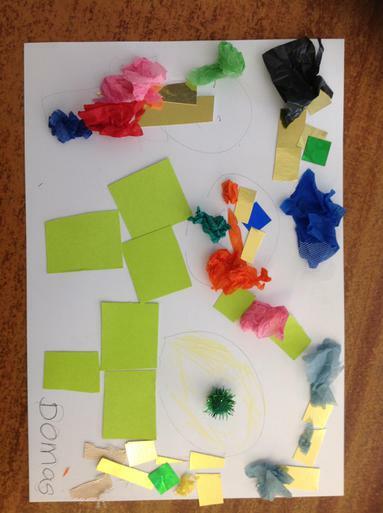 Can you identify what our family values are? 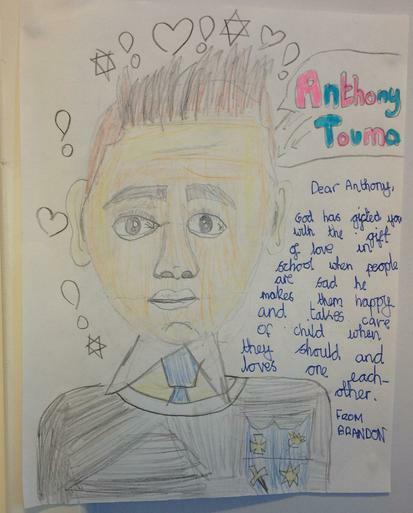 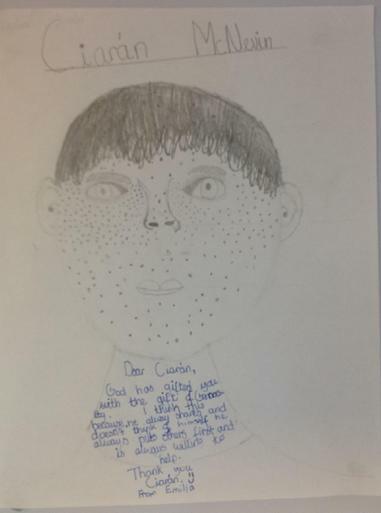 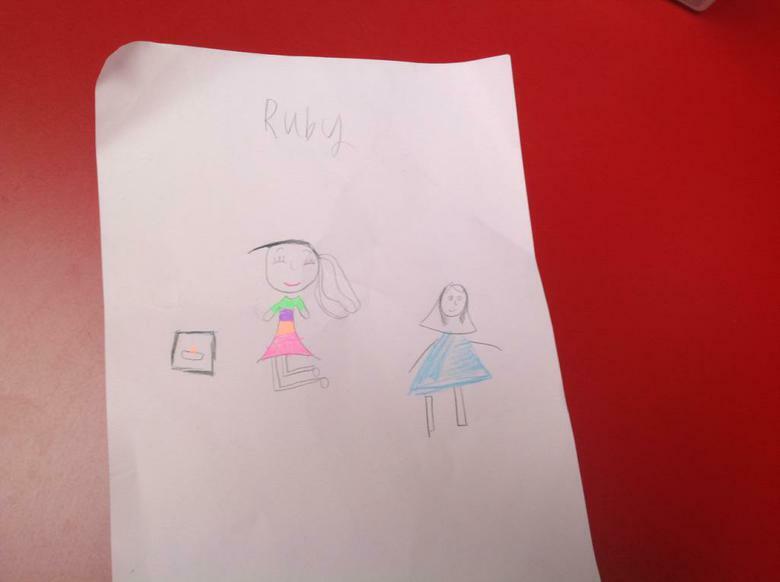 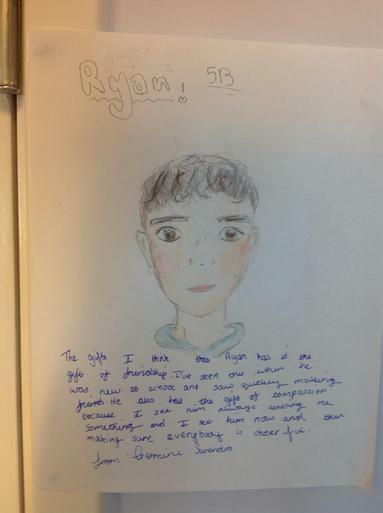 In Year 5, we were paired up and sketched a portrait of our partner. 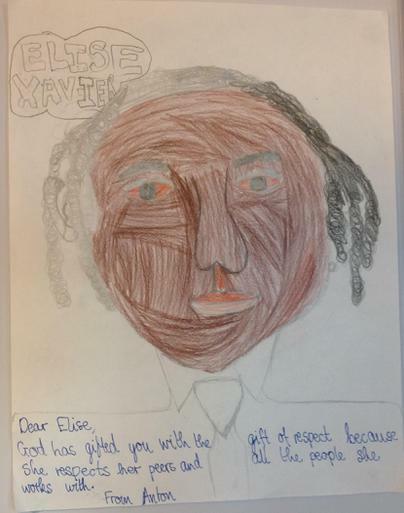 After we sketched a portrait of our partner, we wrote a message telling them what spiritual gift they had been given by God and a time we saw our partner use that gift. 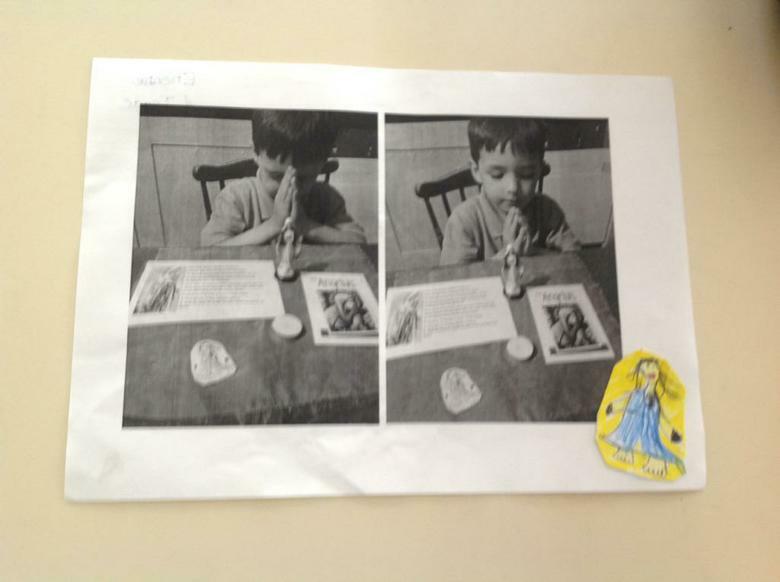 acknowledge the ways we have turned away from God in our lives and we focus on turning our hearts and minds back toward God. 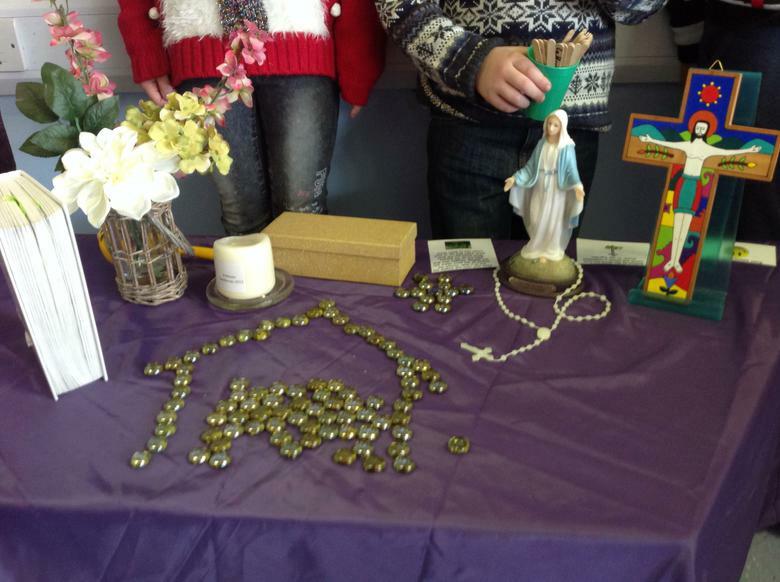 The three pillars of Lent are prayer, fasting, and almsgiving. 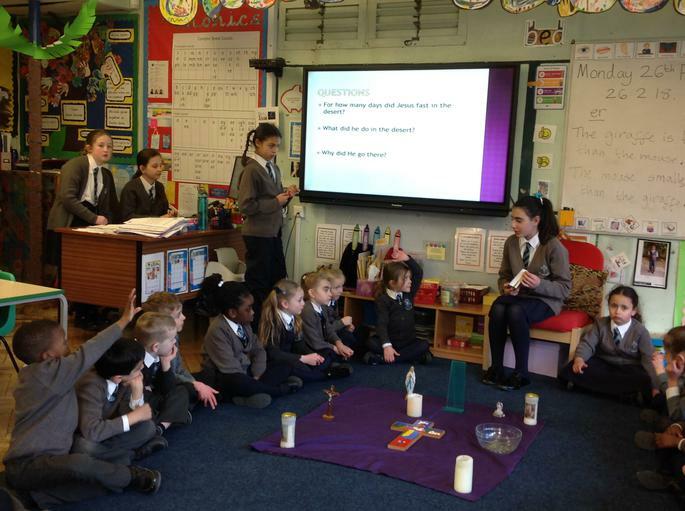 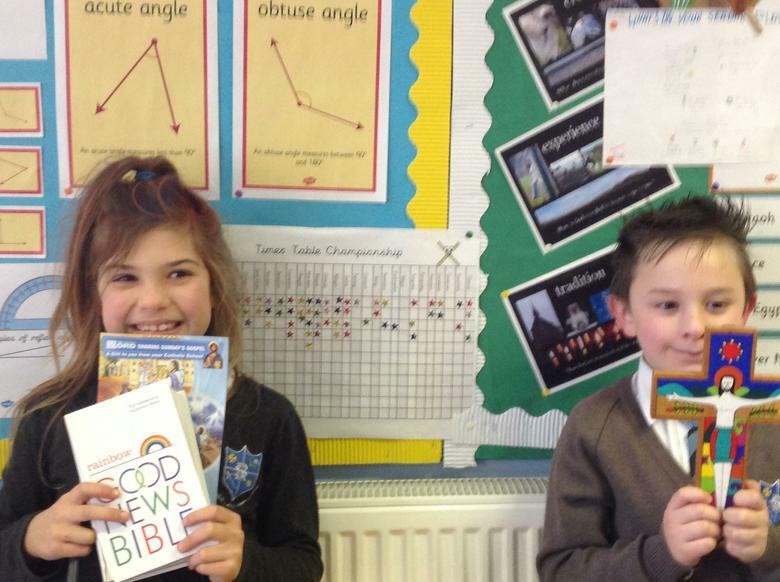 In year 6, we think that Lent is a reminder about how we should be about living the Gospel every day.